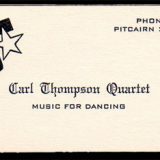 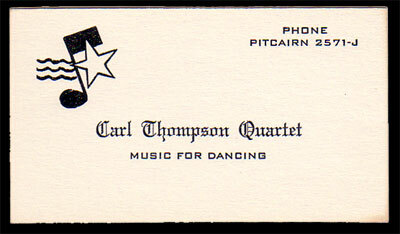 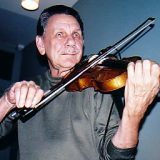 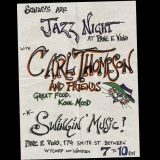 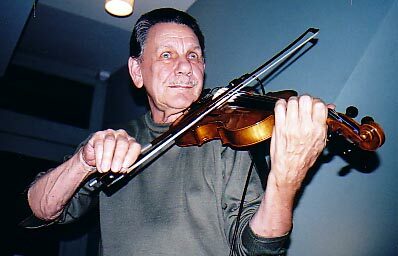 Born in Pitcairn, Pennsylvania on February 5, 1939, Carl Thompson was one of 11 children of a caring and nurturing family. 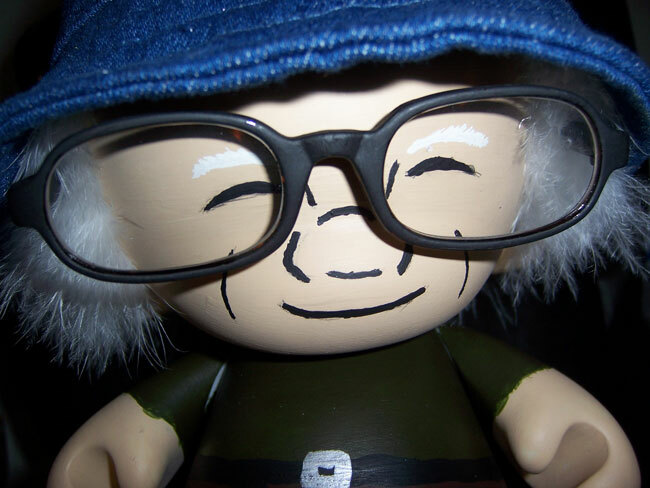 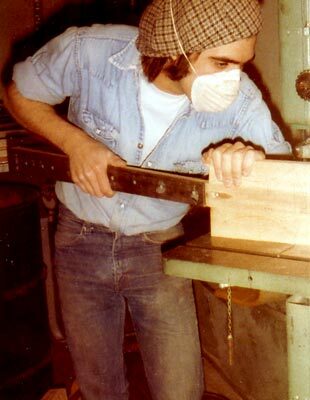 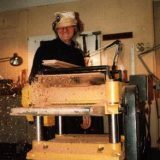 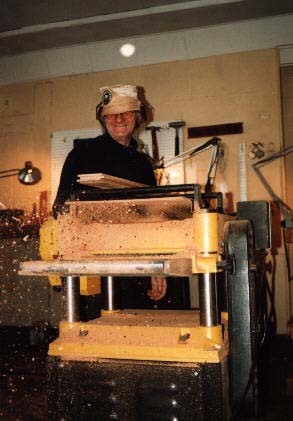 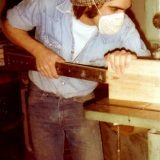 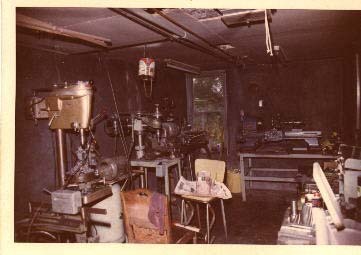 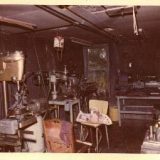 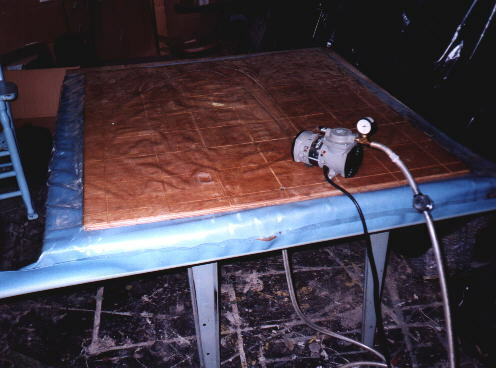 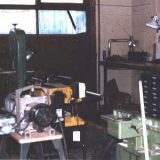 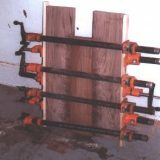 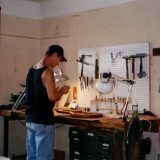 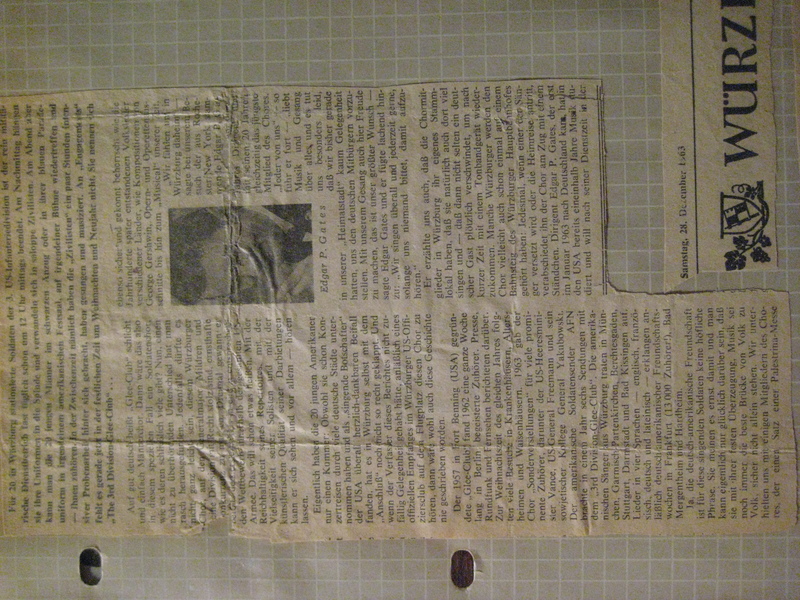 The son of a talented and inventive father whom played guitar as well as working in machining, carpentry and electronics, Carl’s father taught him above all to be a great thinker. 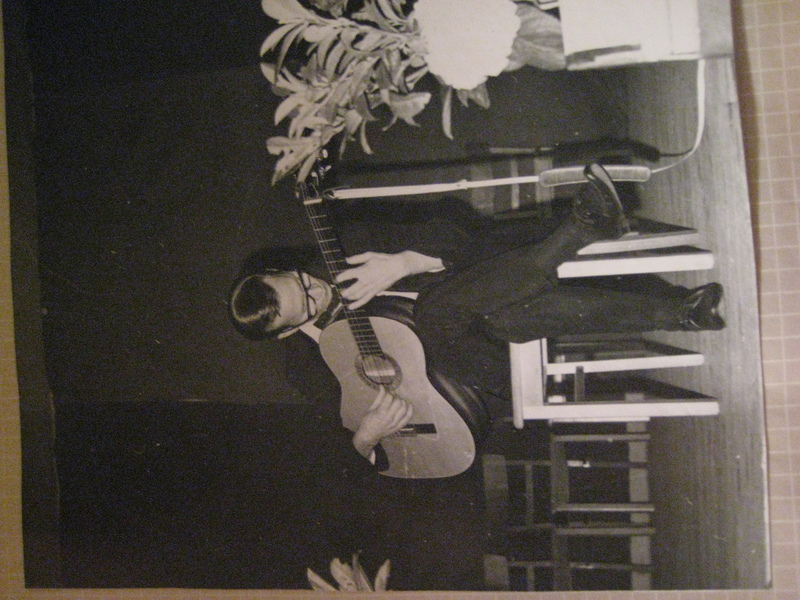 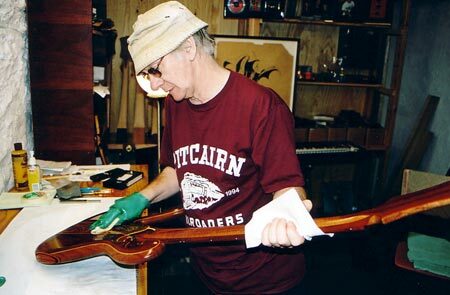 The combination of skills Carl’s father possessed led him to build the first electric guitar in the late 30’s, years before anyone else was able to. 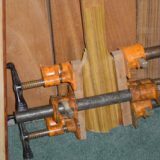 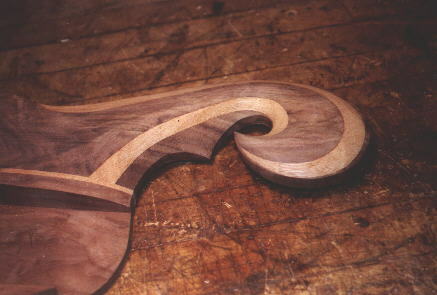 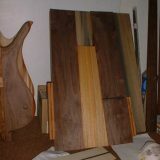 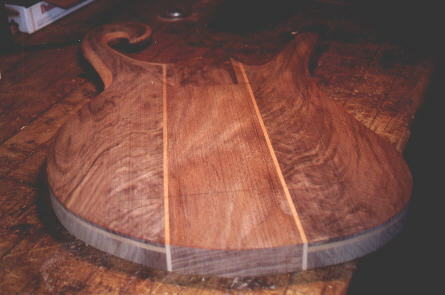 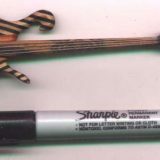 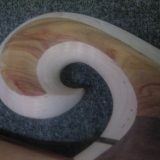 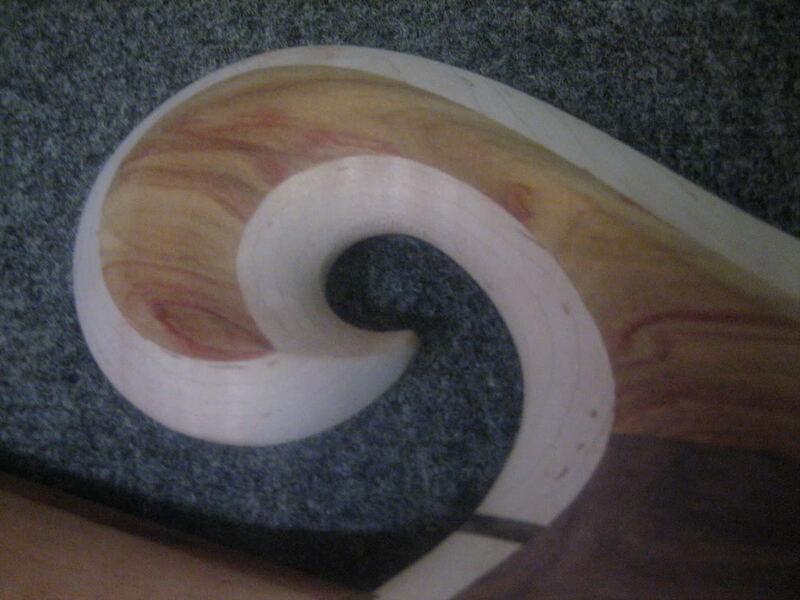 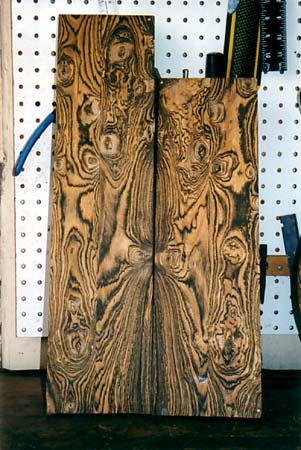 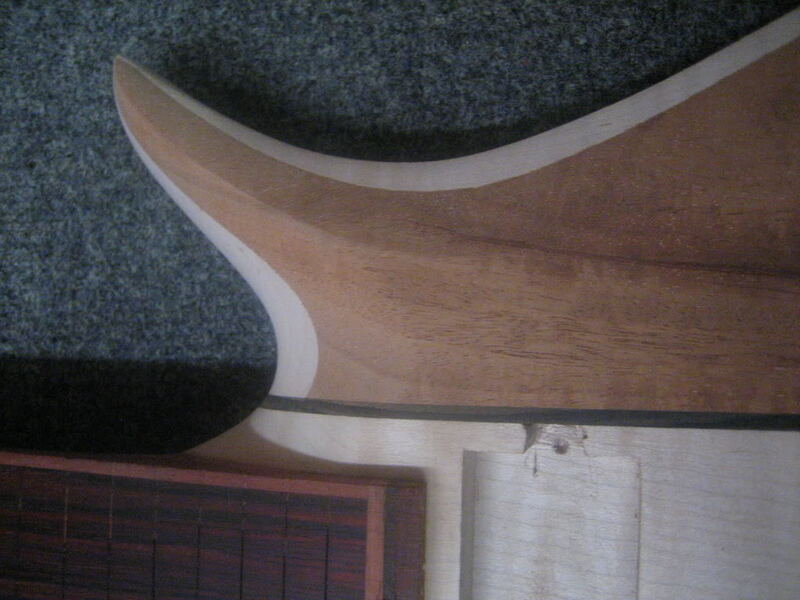 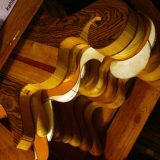 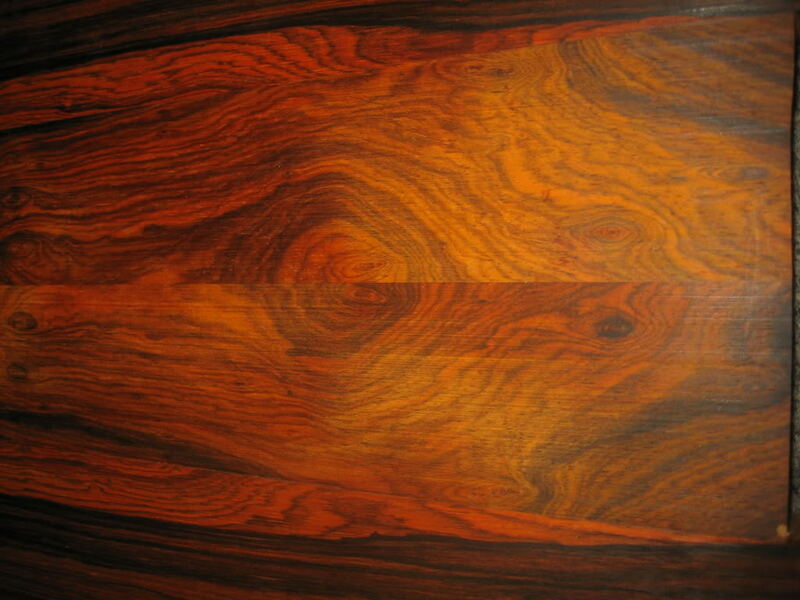 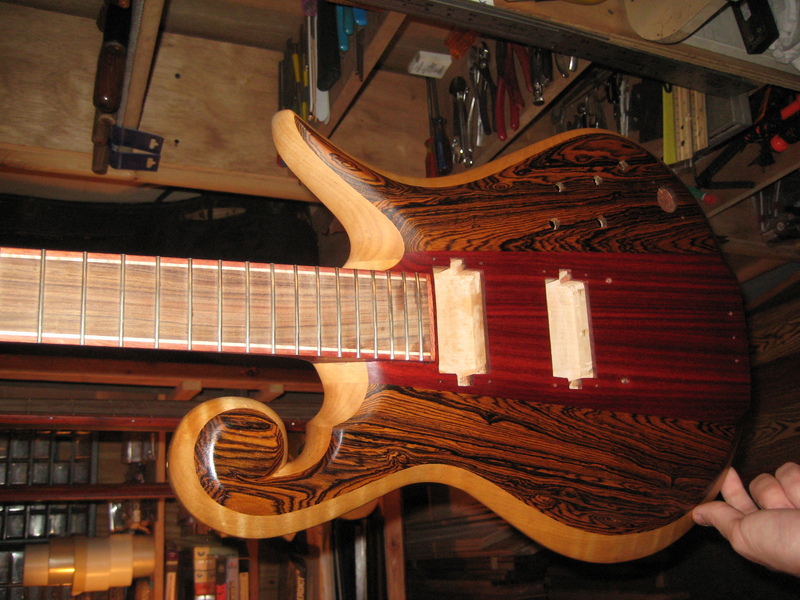 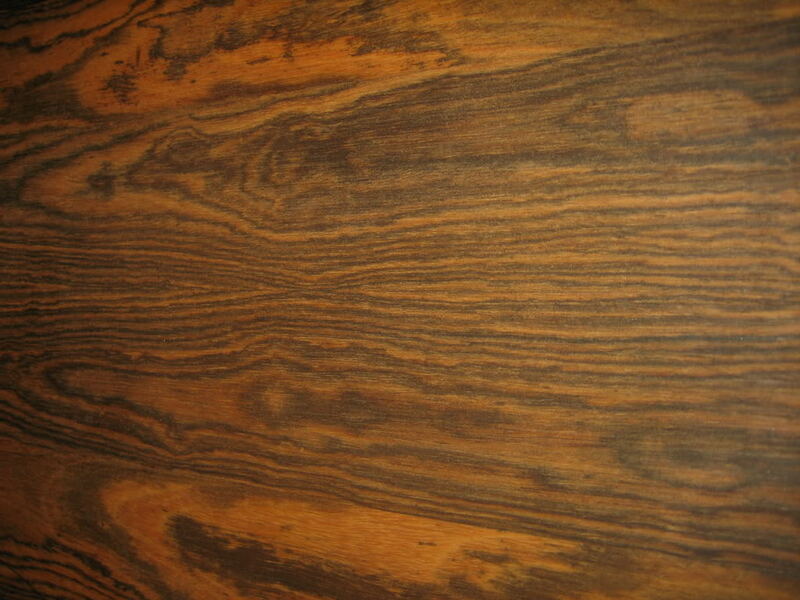 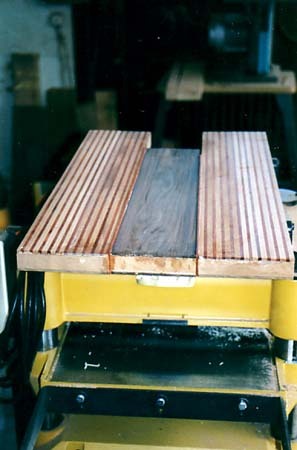 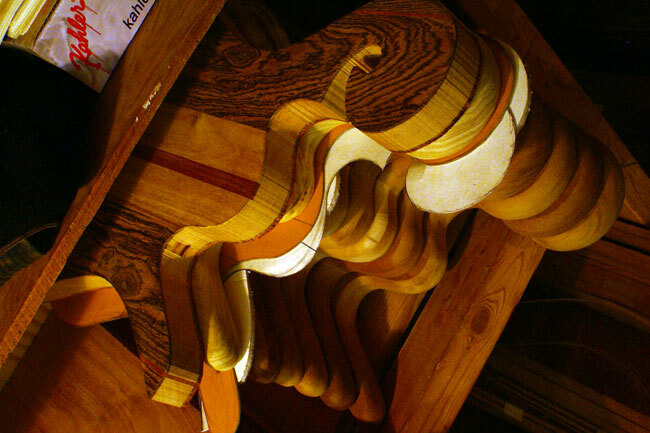 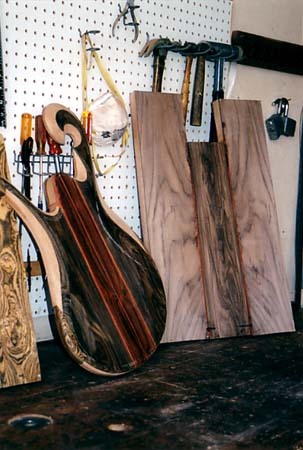 This combination also helped lead Carl down the path to an accomplished jazz guitarist and eventual luthier. 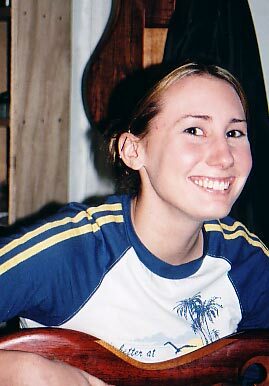 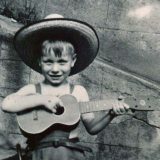 While very young, Carl was stricken with Rheumatic Fever, resulting in crippling attacks that sometimes lasted over a year. 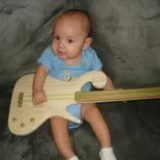 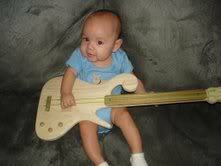 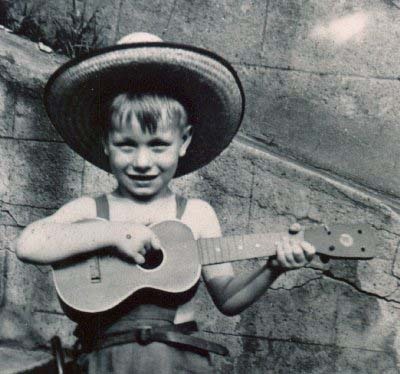 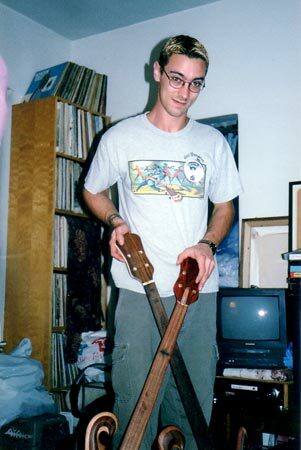 To pass the time, Carl’s parents bought him a ukulele and encouraged him to explore music. 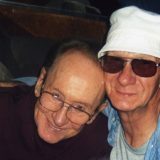 It was also during one of these attacks that the family minister would visit and pray for Carl’s health. 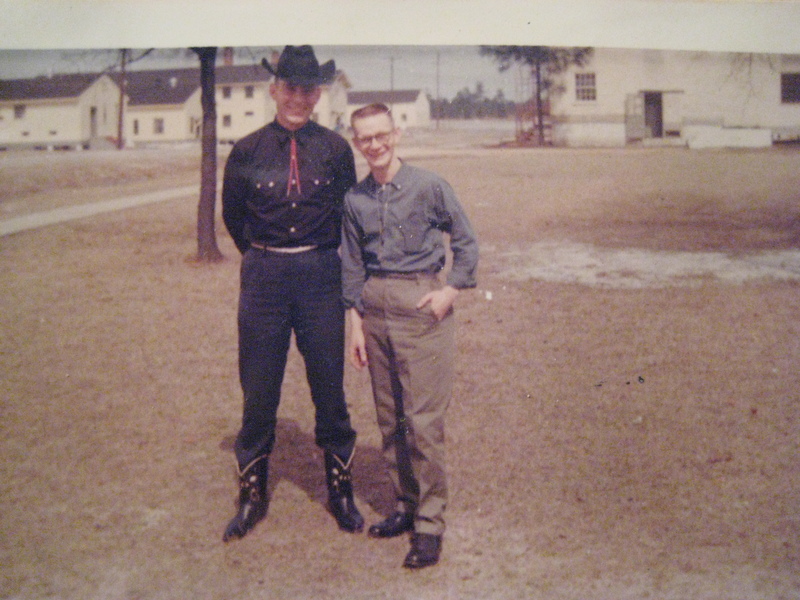 During one of Carl’s last attacks, the minister prayed “this boy has things to do, and he can’t do them from bed.” Within hours, Carl was up and walking and hasn’t sat back down since. 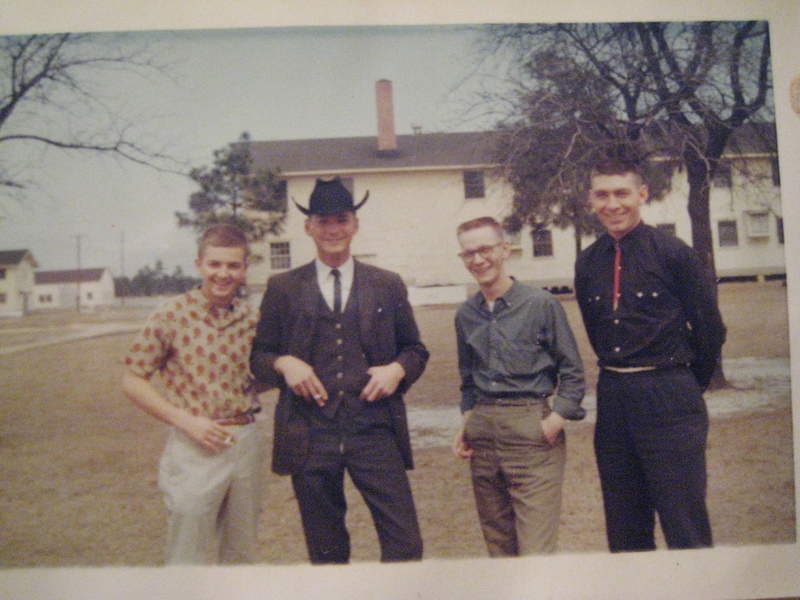 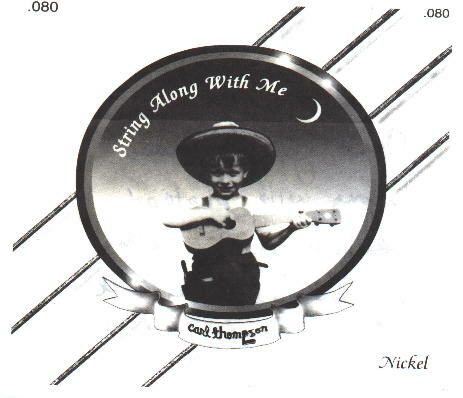 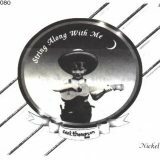 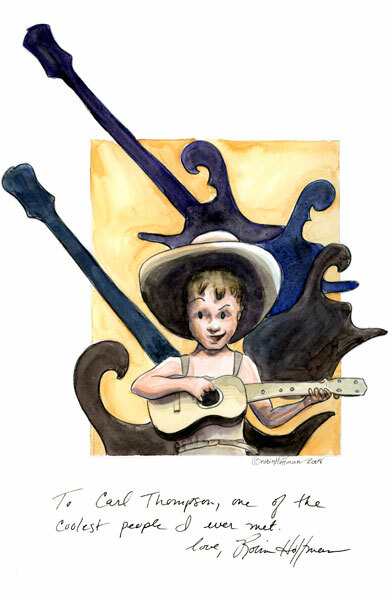 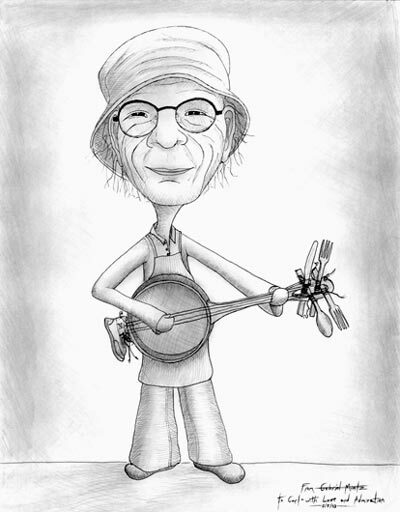 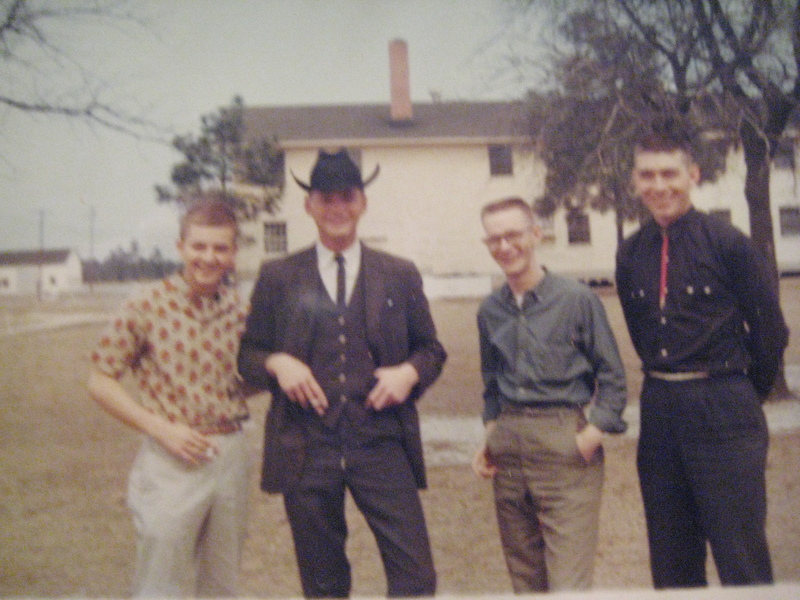 By the age of 13 Carl was playing guitar while his older brother handled singing duties in a country band. 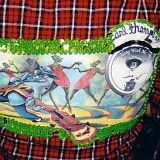 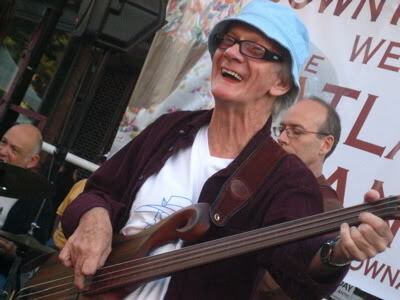 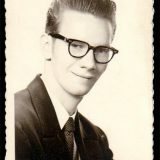 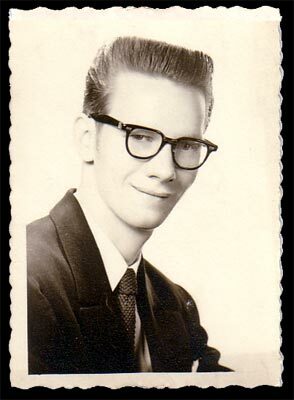 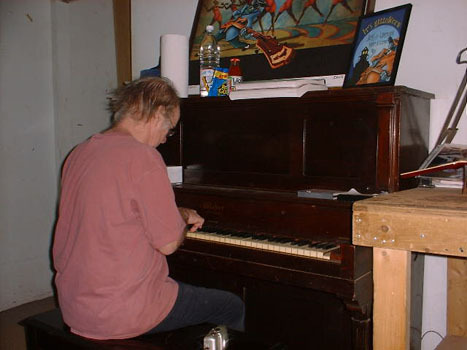 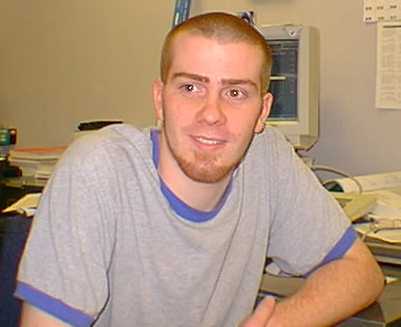 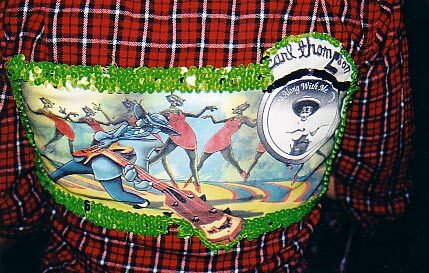 Playing through his high school years, Carl was approached at age 19 with an offer to travel to California and join Billy Ward and the Dominoes. 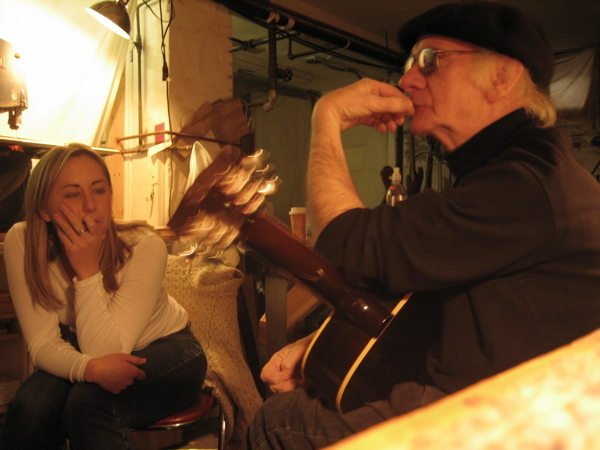 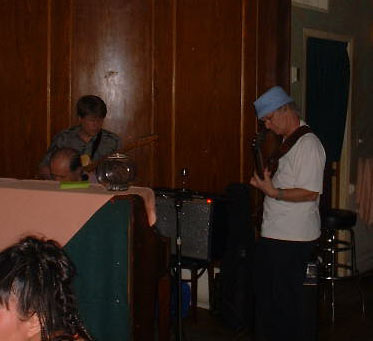 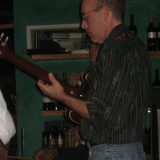 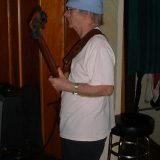 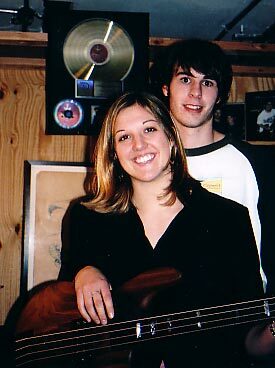 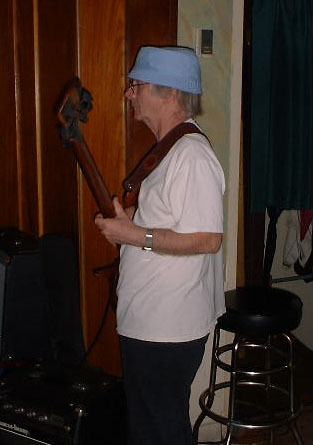 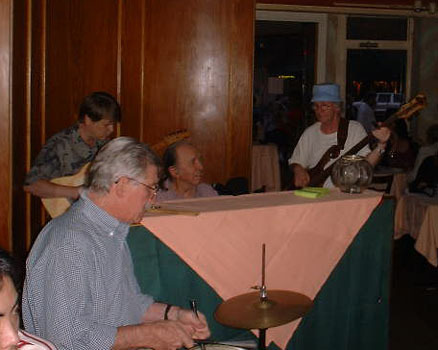 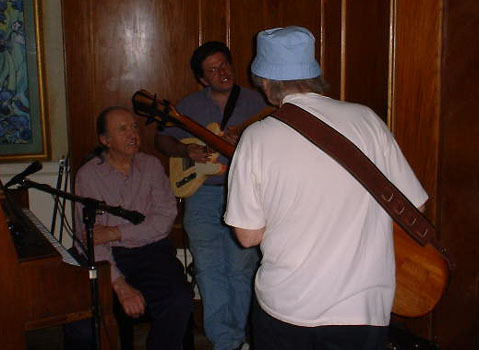 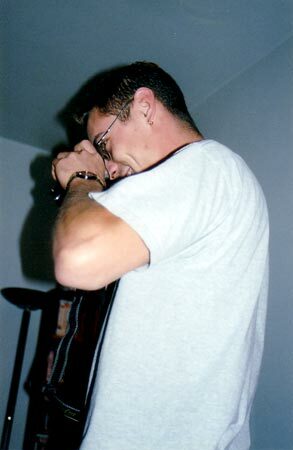 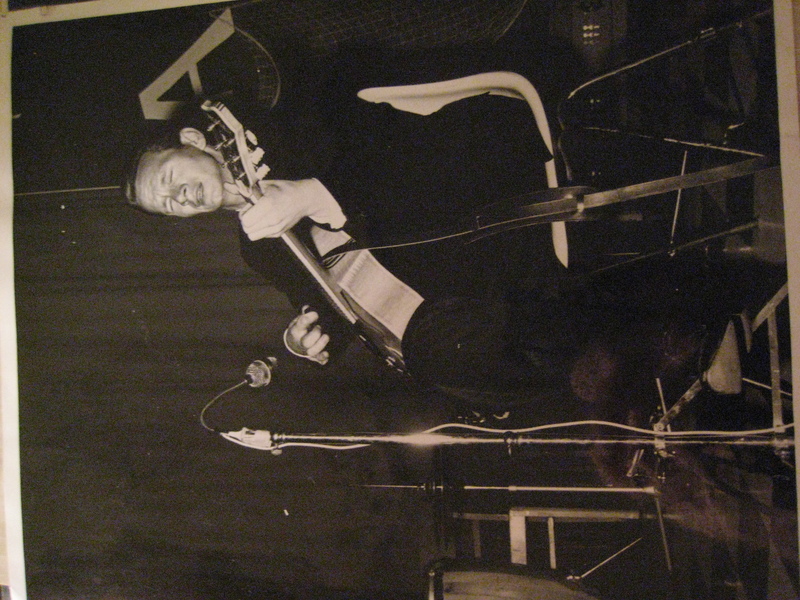 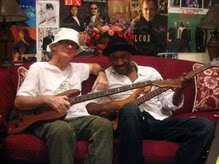 Carl spent several years playing guitar for Billy Ward, until his career was interrupted by the draft. 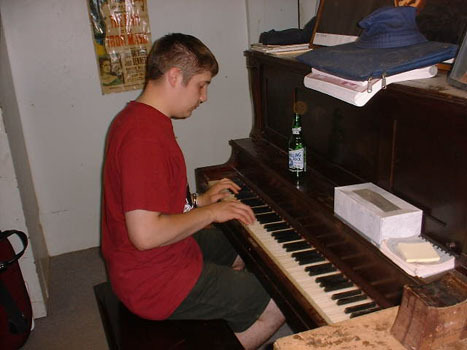 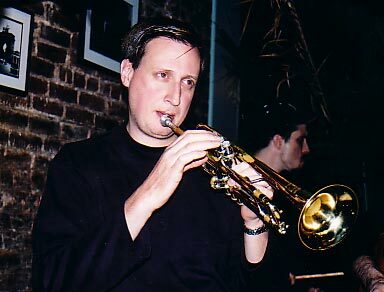 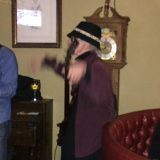 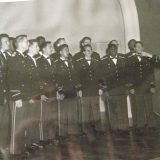 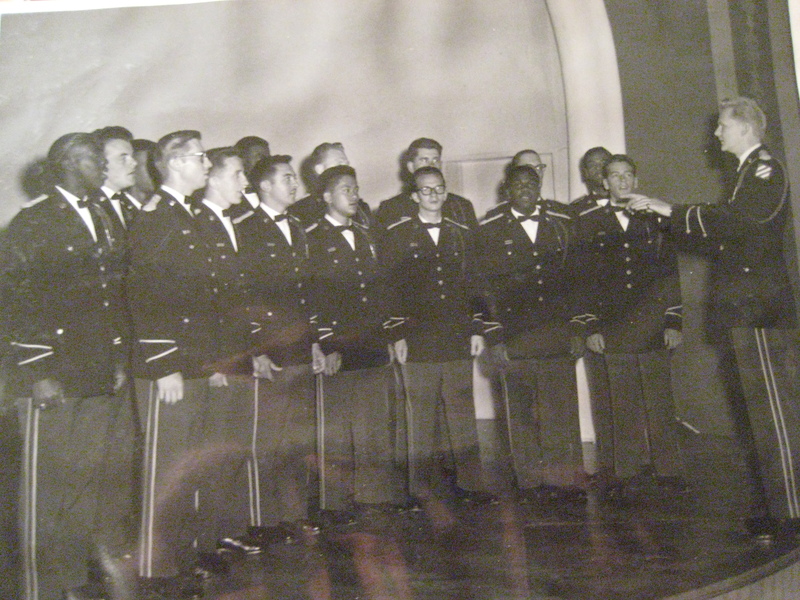 Once in the military, Carl’s reputation earned him the job of Assistant Musical Director and he spent his 2 enlisted years traveling the world and entertaining troops. 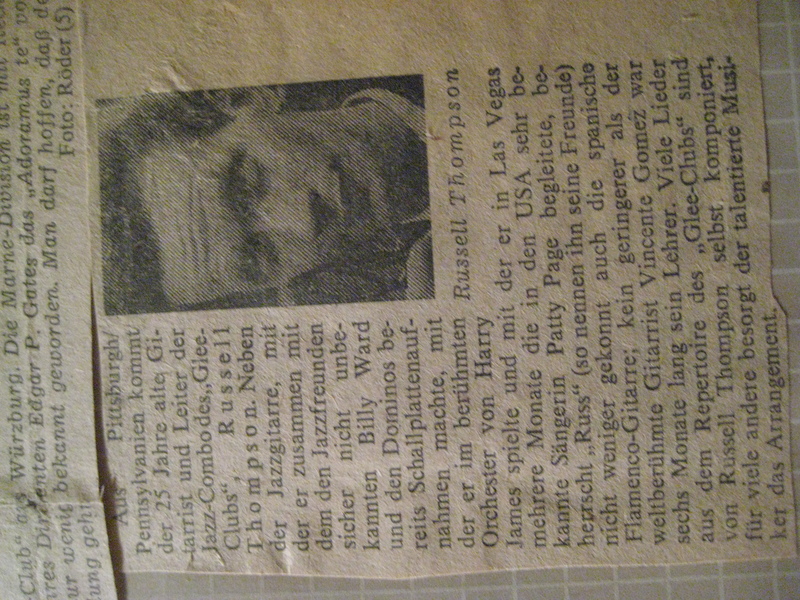 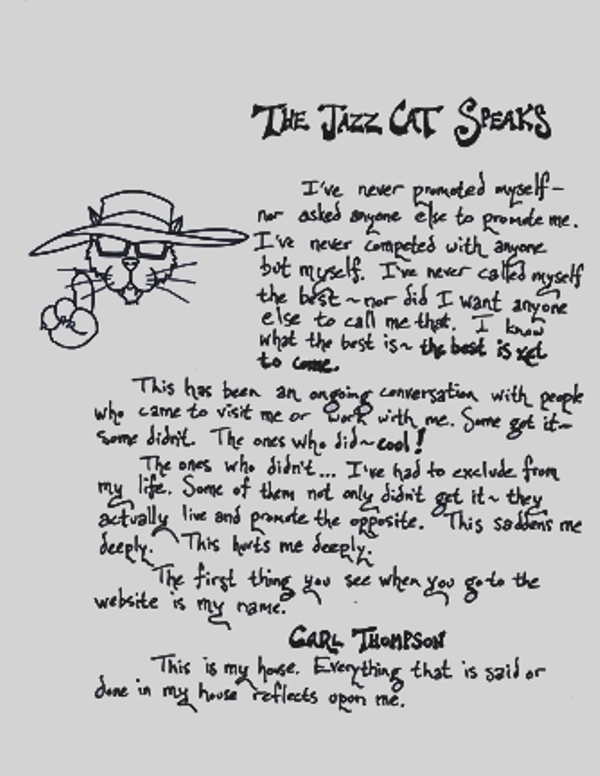 Upon his return from duty, Carl’s good friend and studio musician Russell George encouraged him to move to New York. 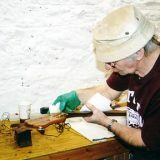 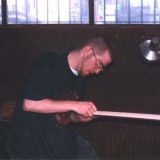 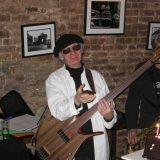 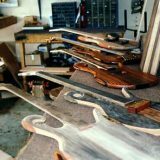 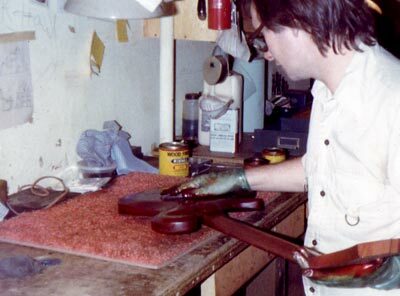 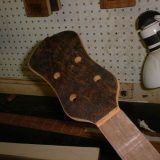 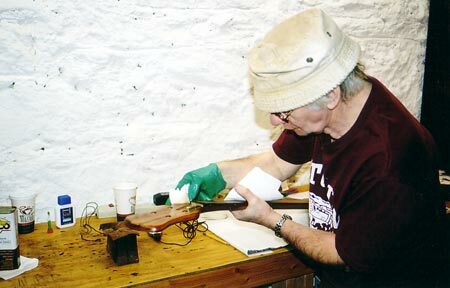 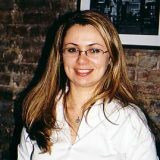 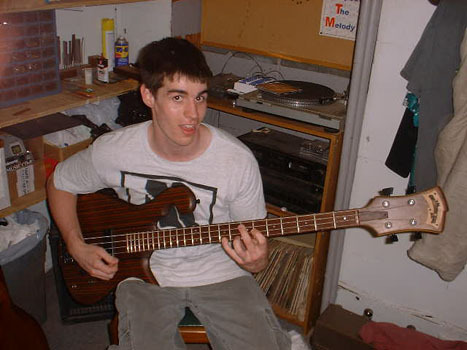 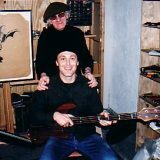 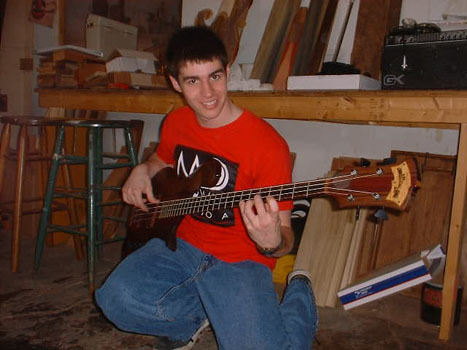 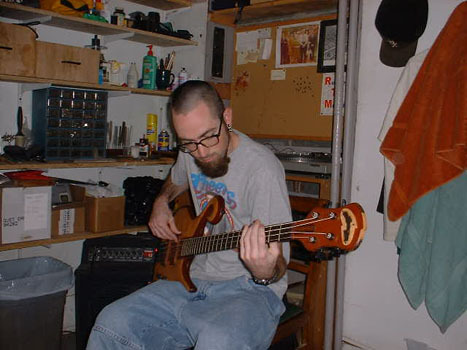 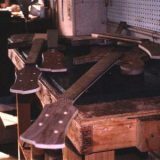 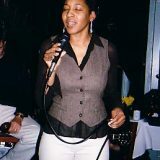 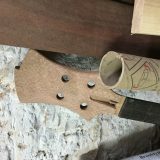 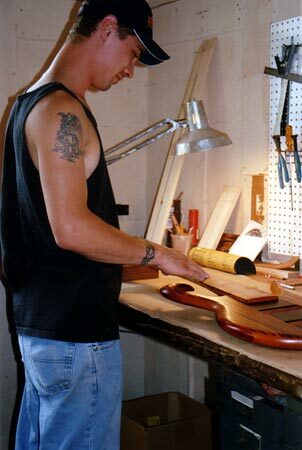 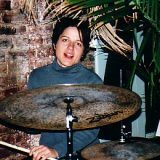 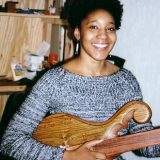 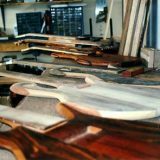 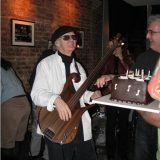 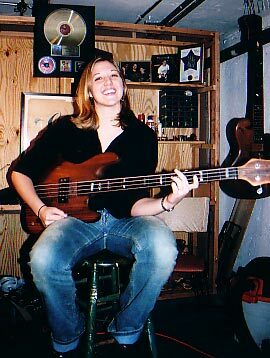 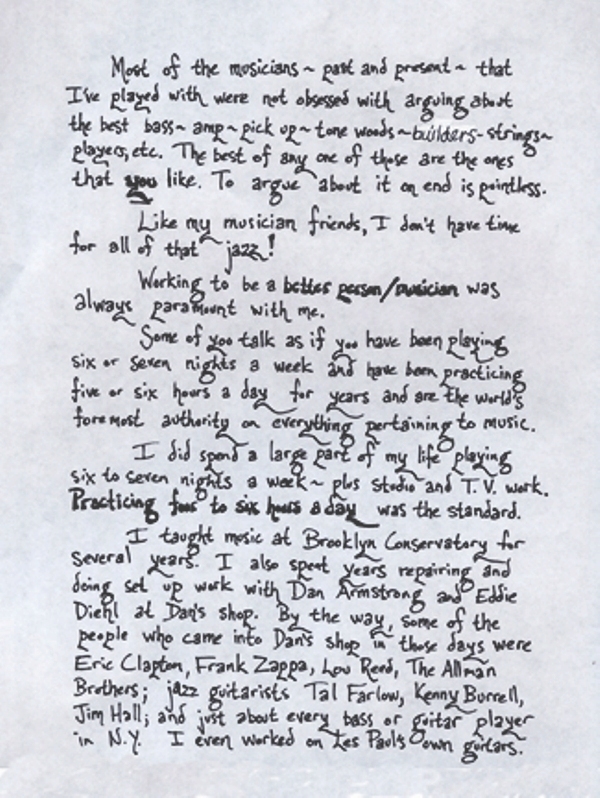 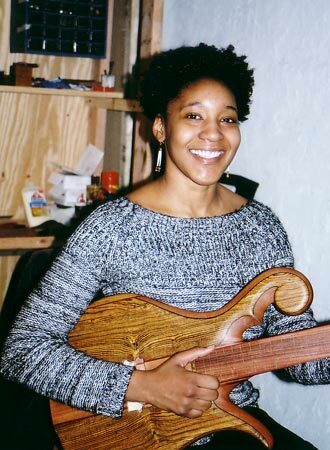 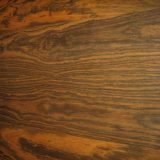 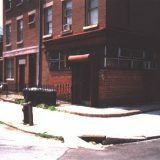 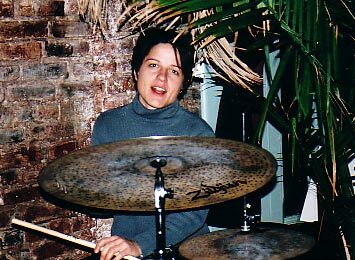 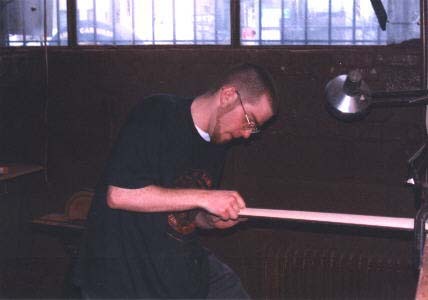 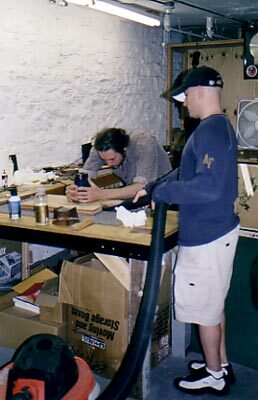 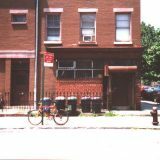 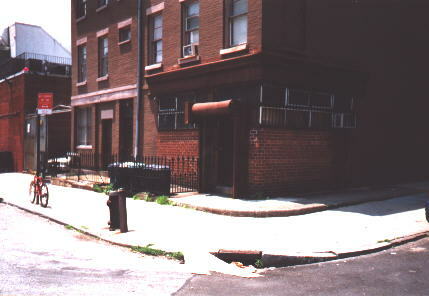 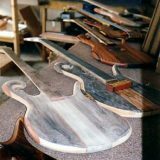 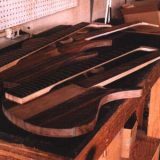 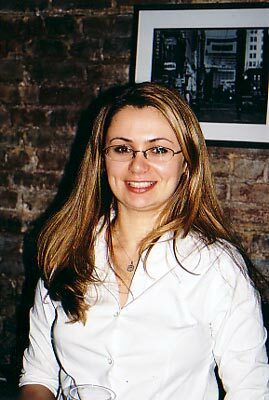 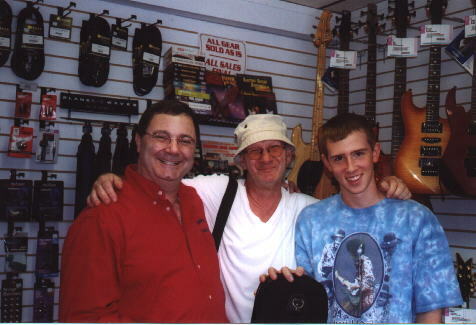 In New York Carl was hired at Dan Armstrong’s guitar shop where he honed his skills repairing and maintaining guitars and basses for top name musicians. 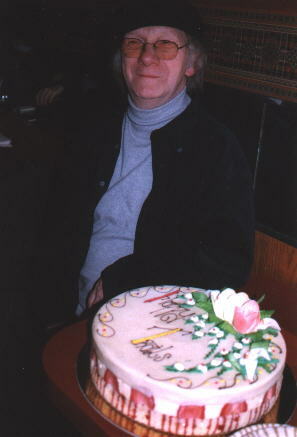 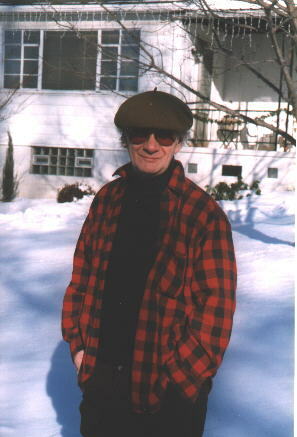 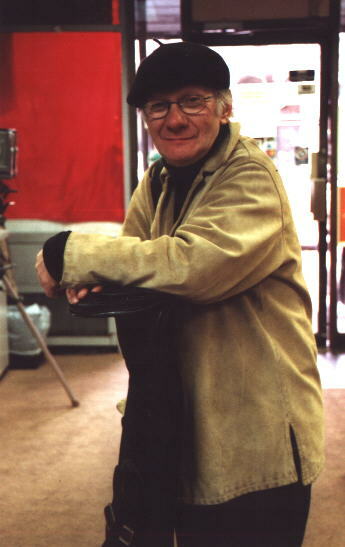 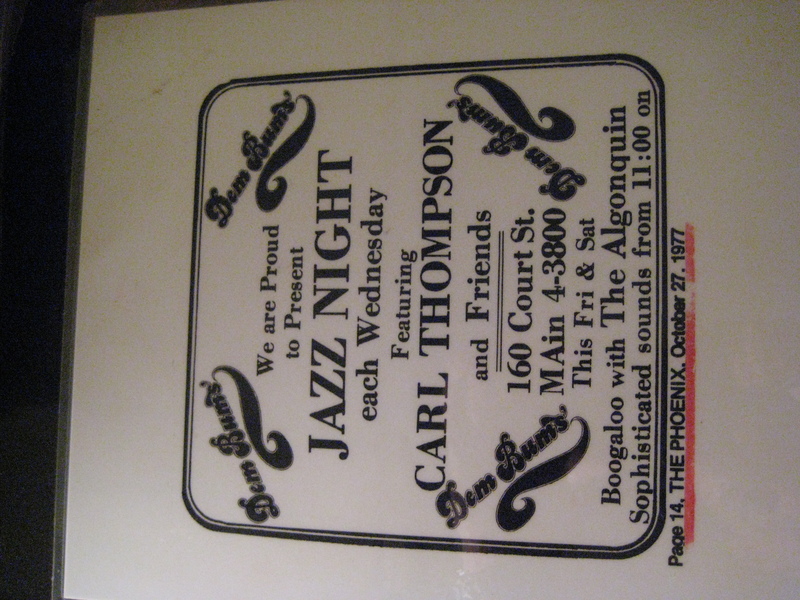 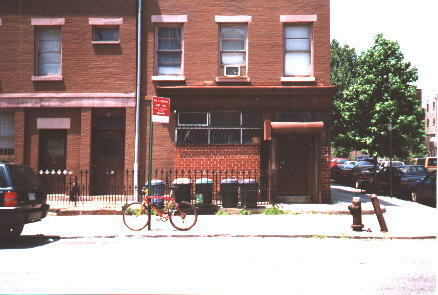 After his stint with Dan Armstrong, Carl opened his own shop in the early 1970s. 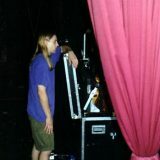 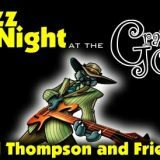 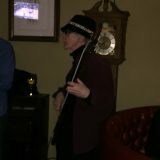 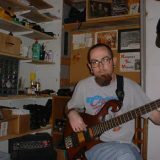 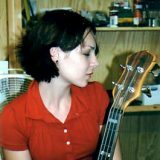 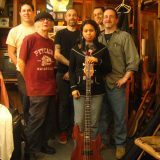 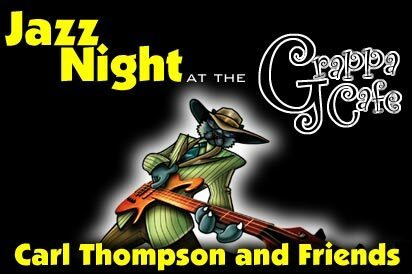 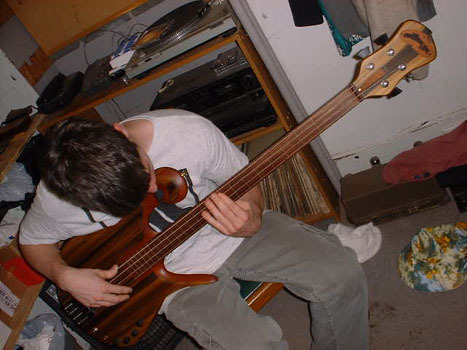 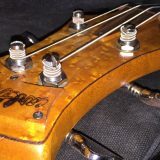 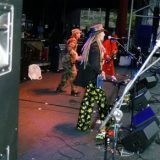 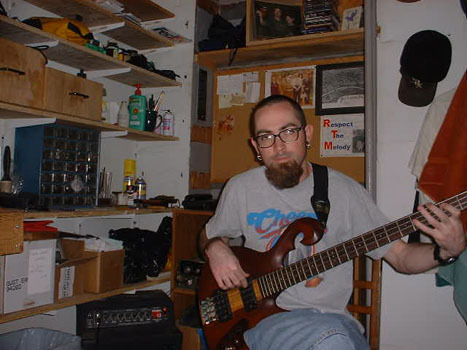 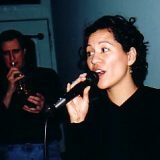 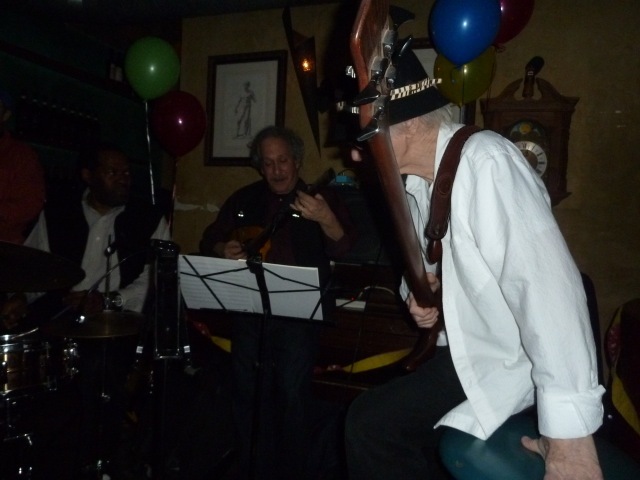 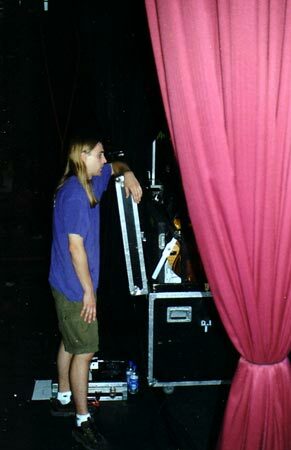 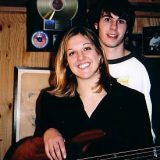 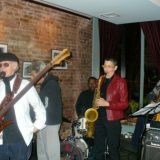 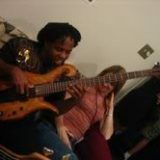 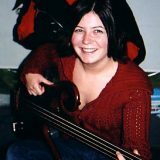 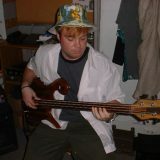 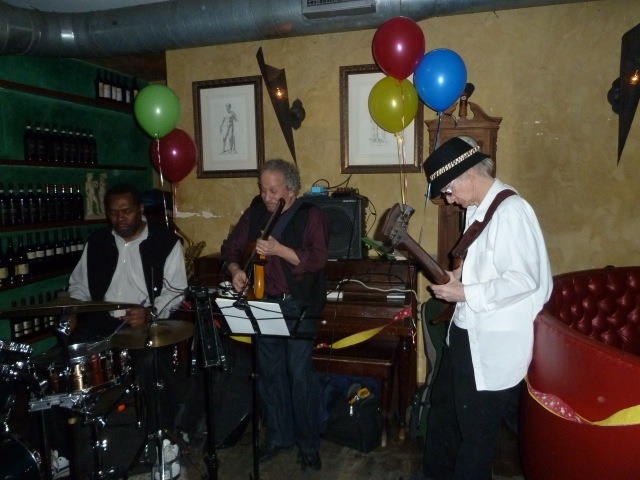 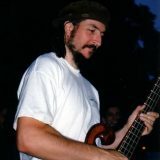 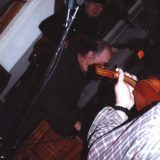 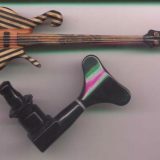 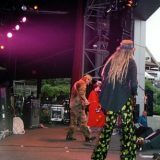 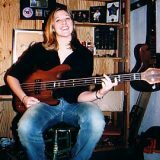 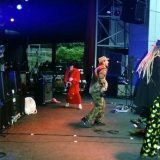 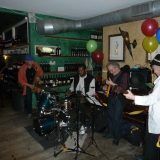 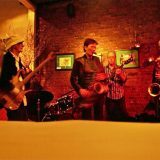 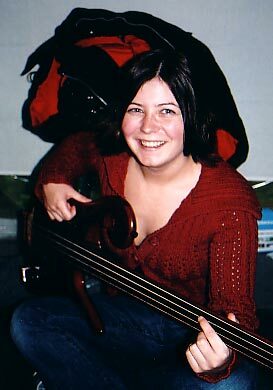 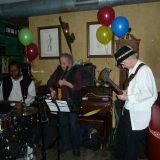 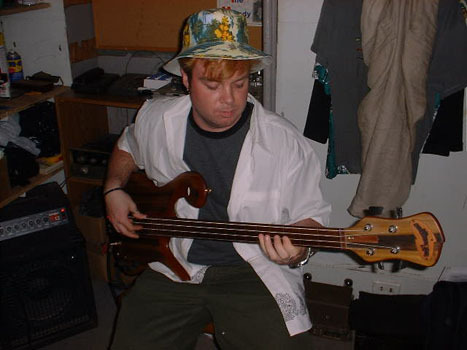 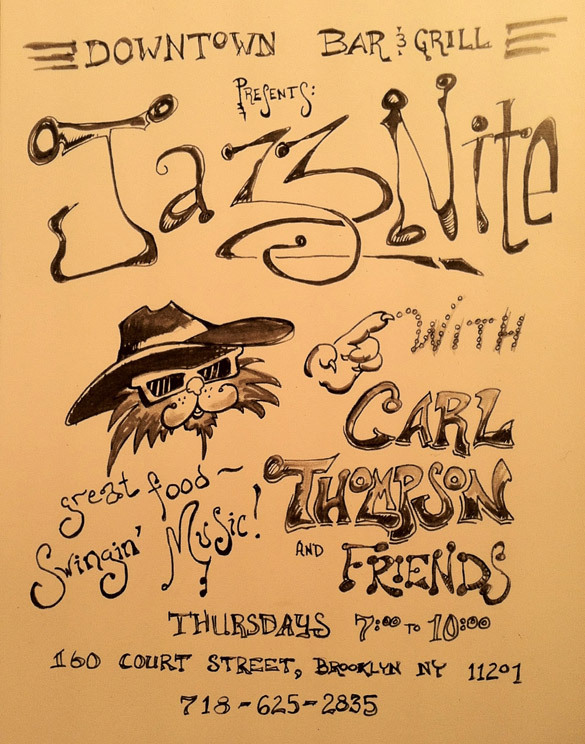 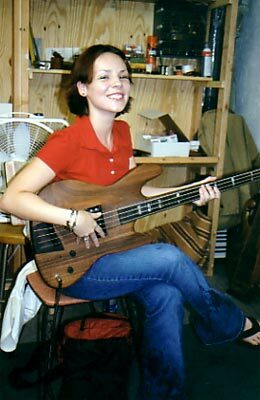 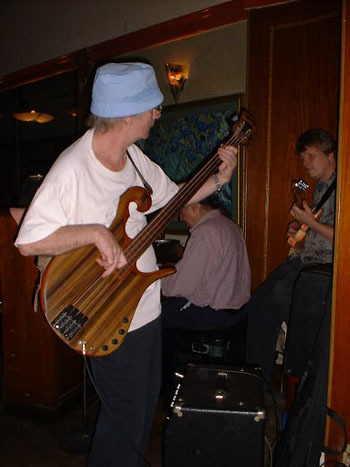 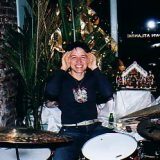 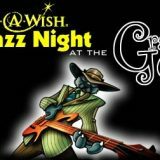 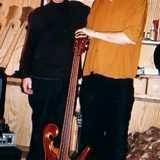 One night Carl was asked to fill in on bass during a friend’s gig and noticed several problems with balance and playability in the basses available at that time. 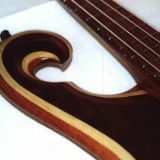 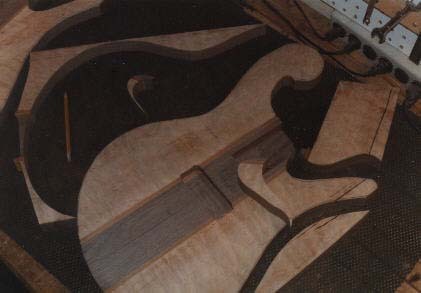 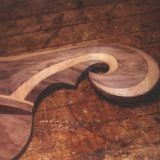 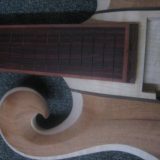 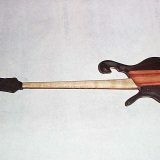 His desire to improve upon those problems led to his impressive career building some of the best and most unique instruments in the world. 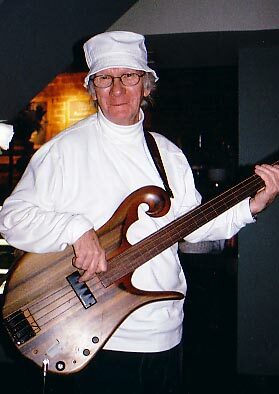 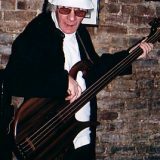 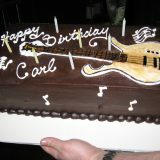 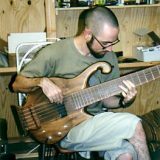 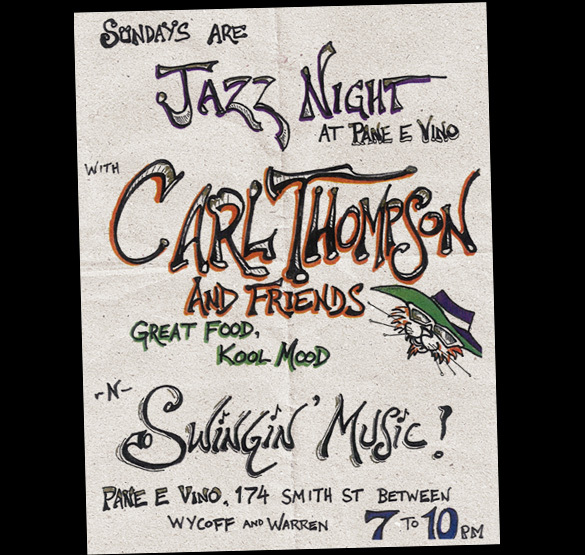 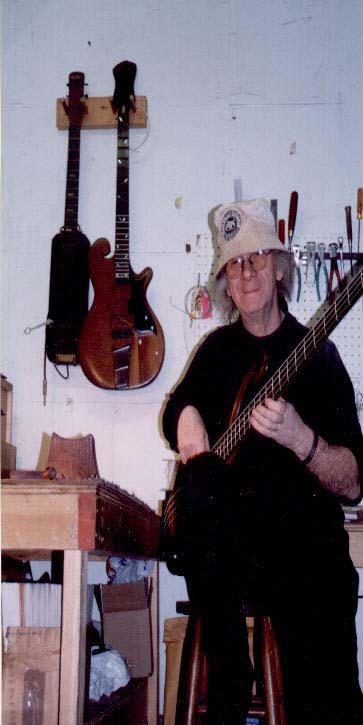 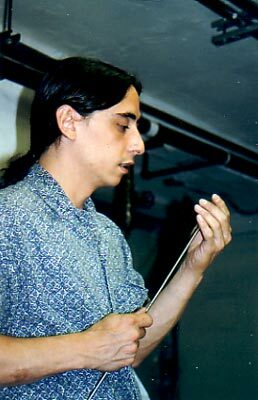 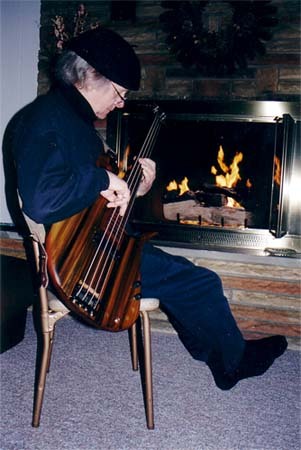 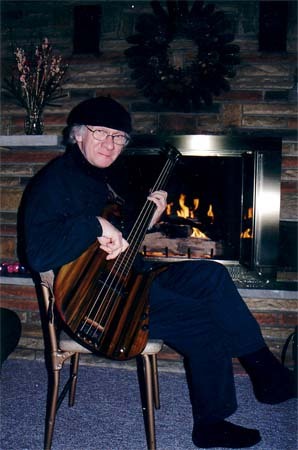 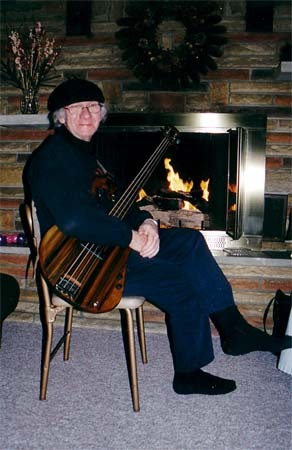 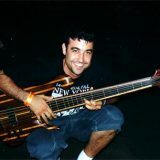 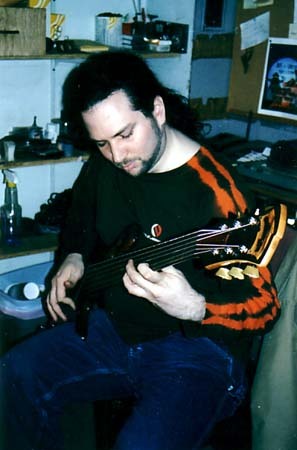 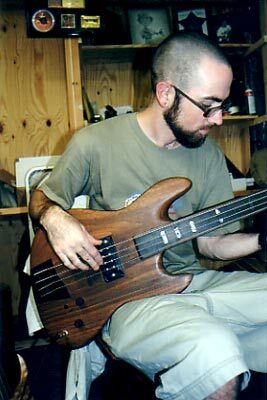 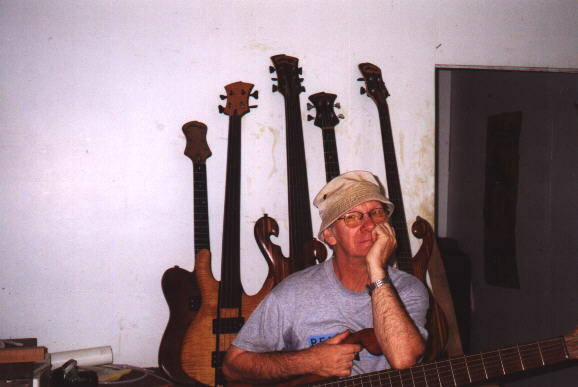 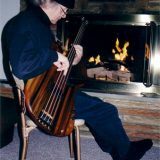 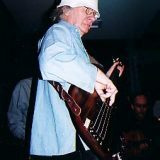 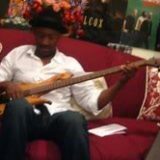 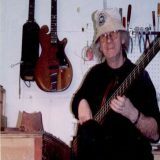 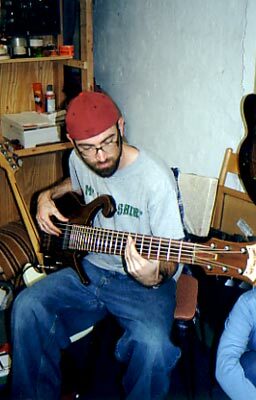 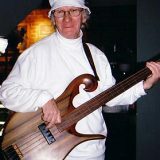 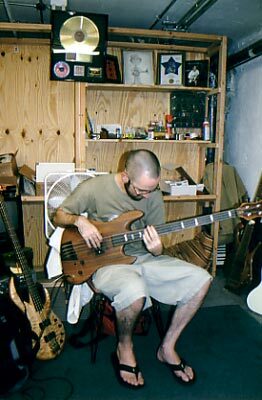 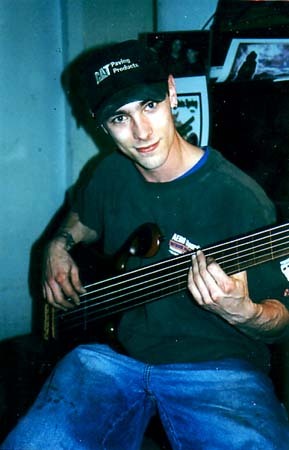 During his career Carl has been responsible for many innovations such as the first 6-string bass guitar and the first Piccolo bass. 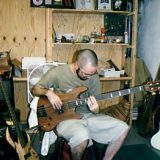 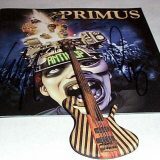 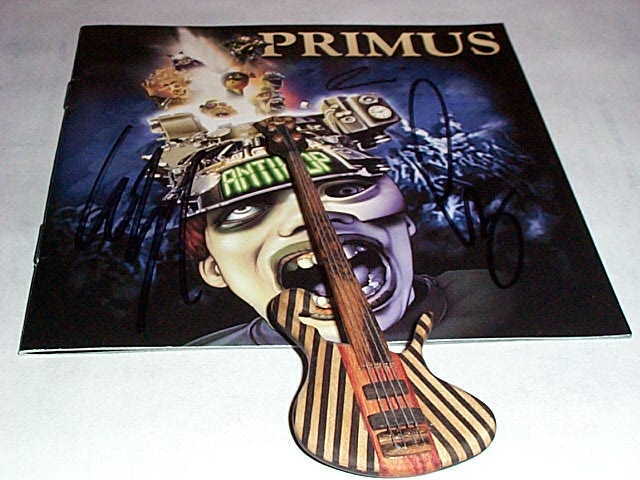 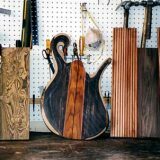 He has built instruments for incredible musicians such as Stanley Clarke and is well known for producing all of Les Claypool’s instruments. 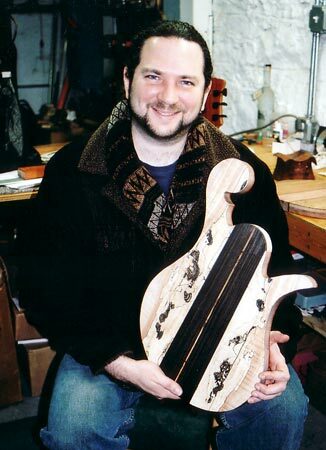 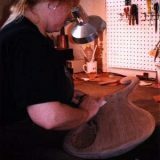 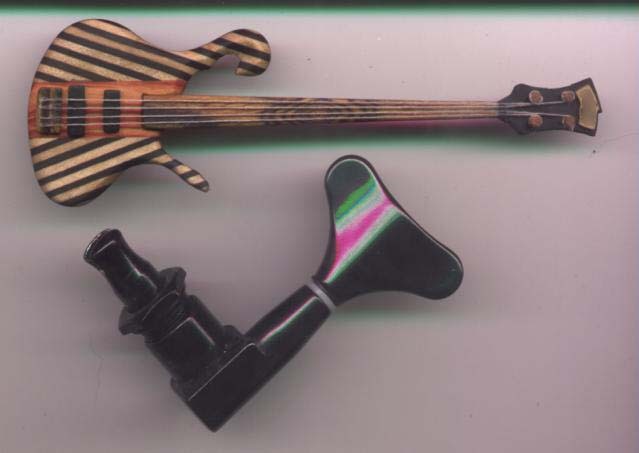 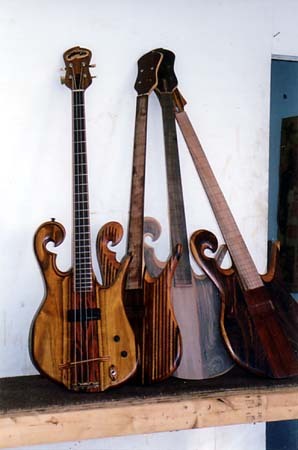 He continues to innovate and influence the design and building of instruments to this day. 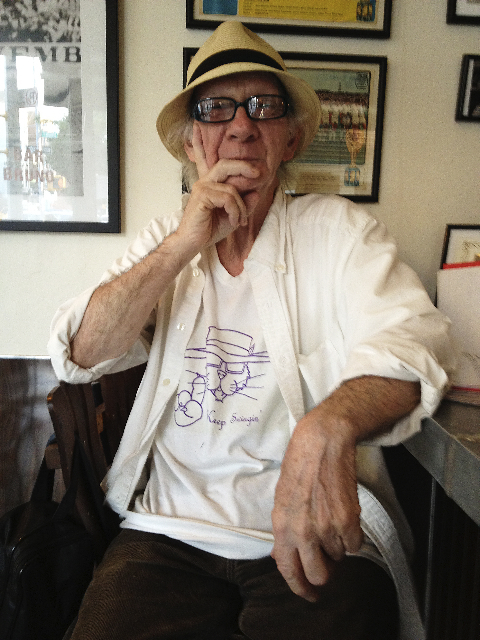 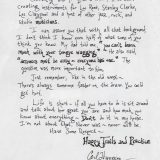 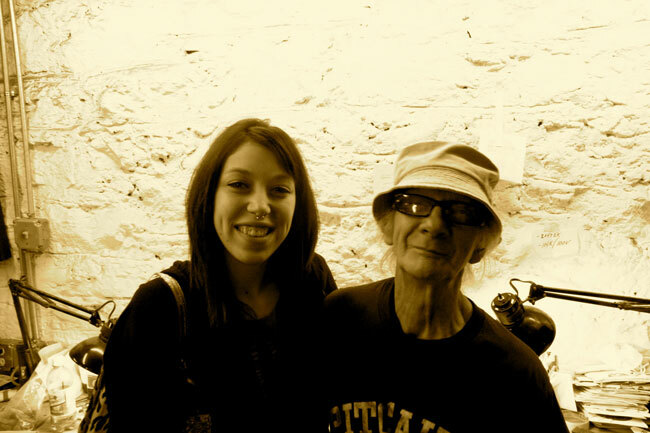 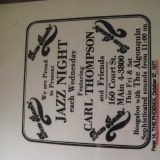 Please have a look around to learn more about Carl’s gigs, the shop and friends. 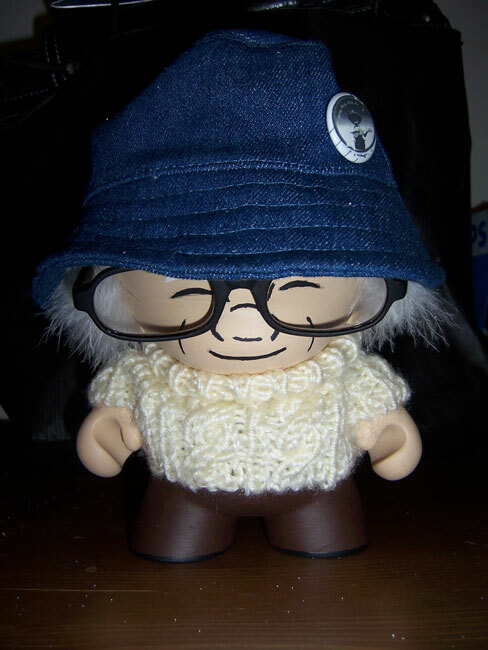 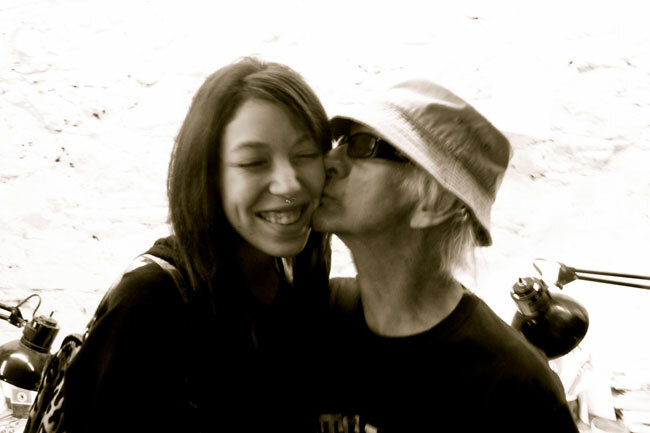 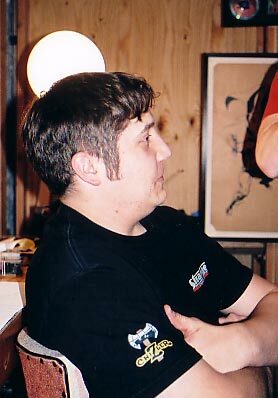 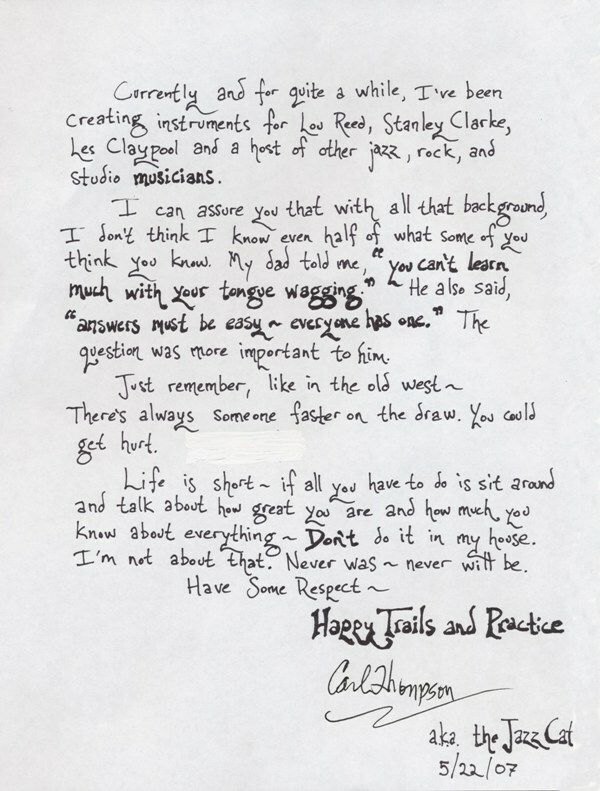 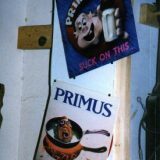 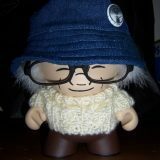 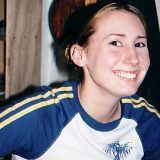 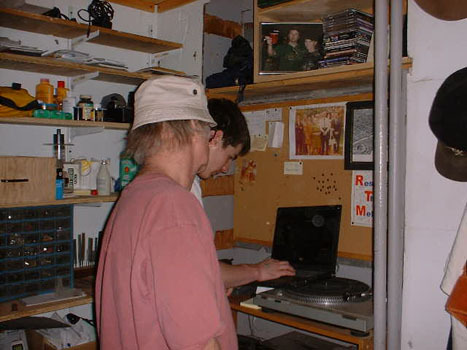 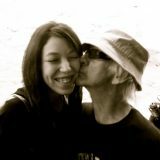 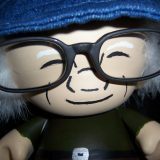 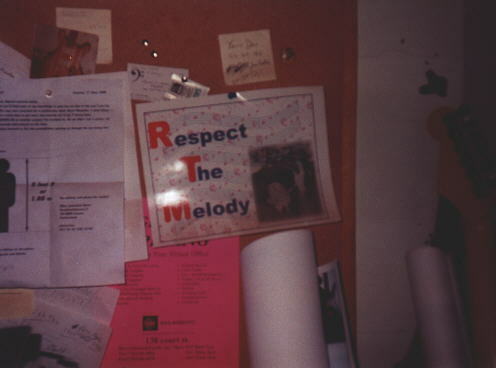 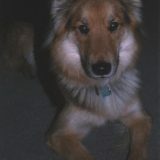 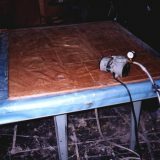 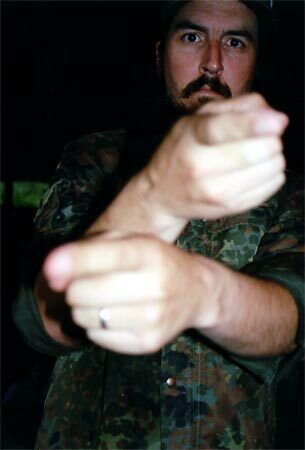 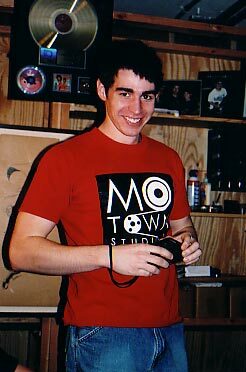 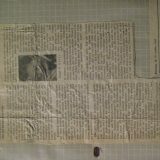 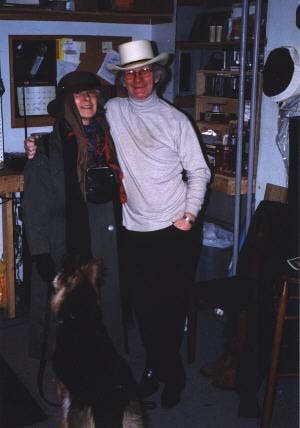 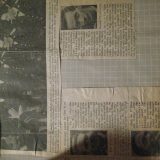 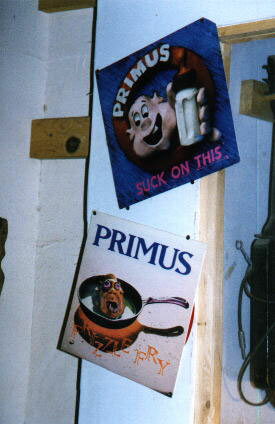 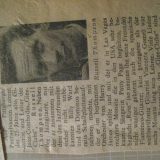 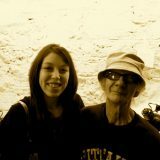 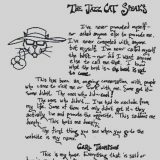 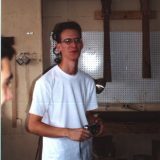 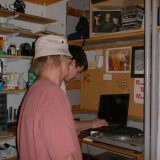 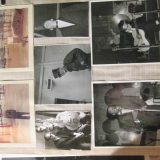 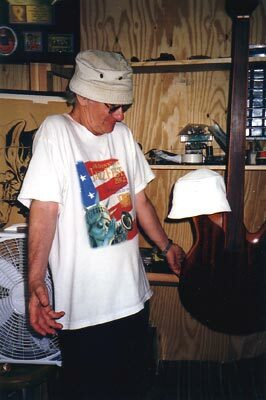 A collection of photos and art from Carl’s life. 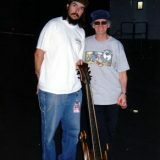 Carl and his wife Linda, and Zeke the dog. 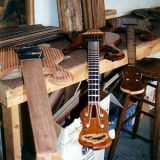 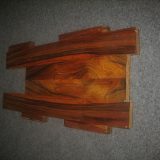 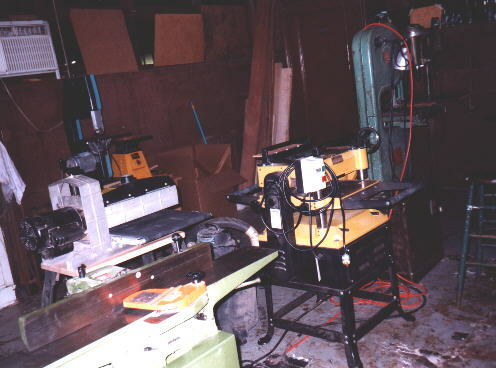 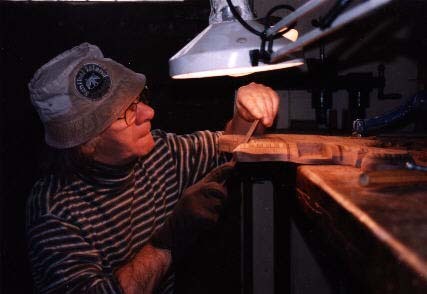 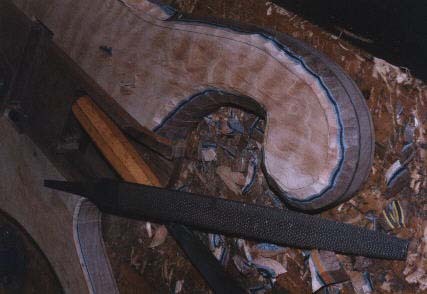 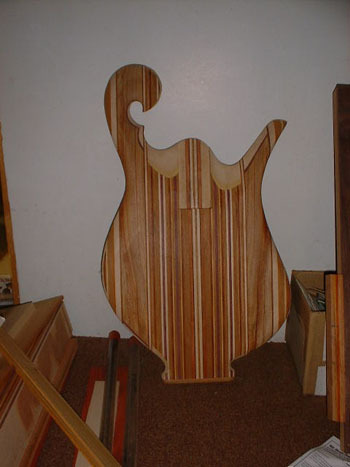 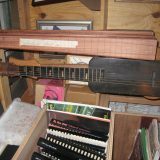 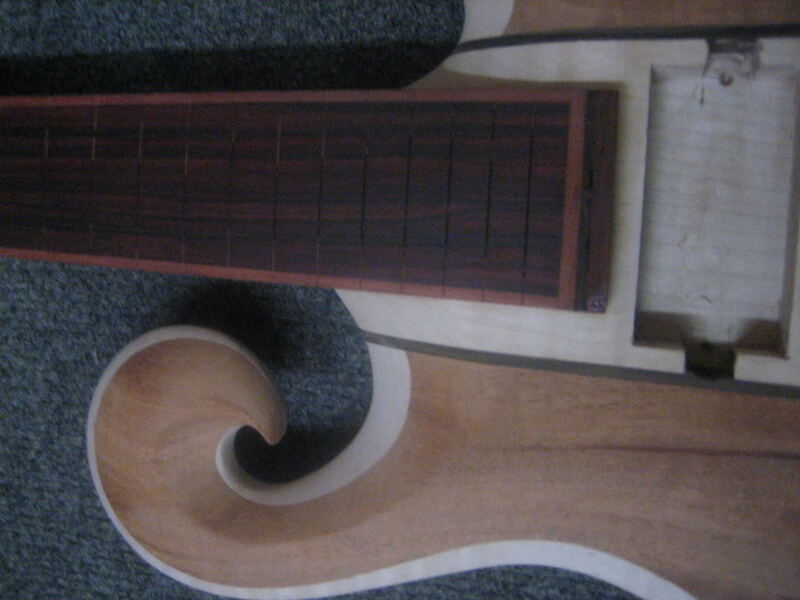 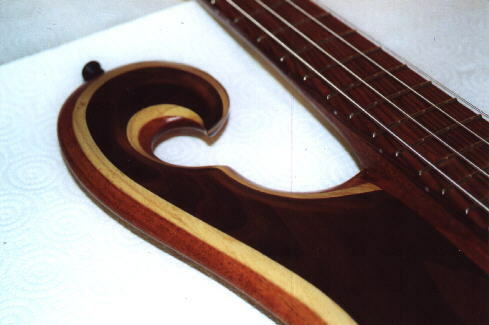 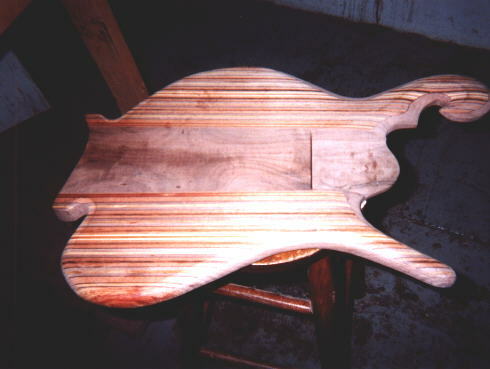 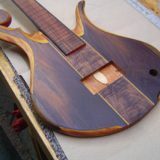 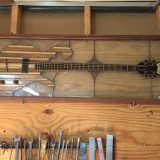 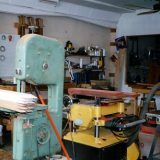 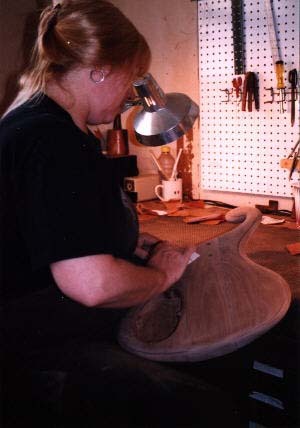 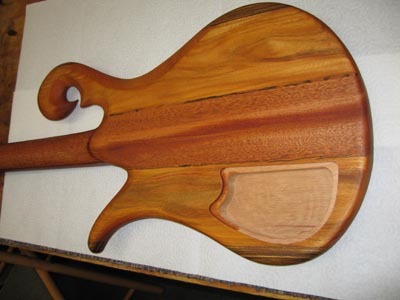 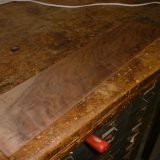 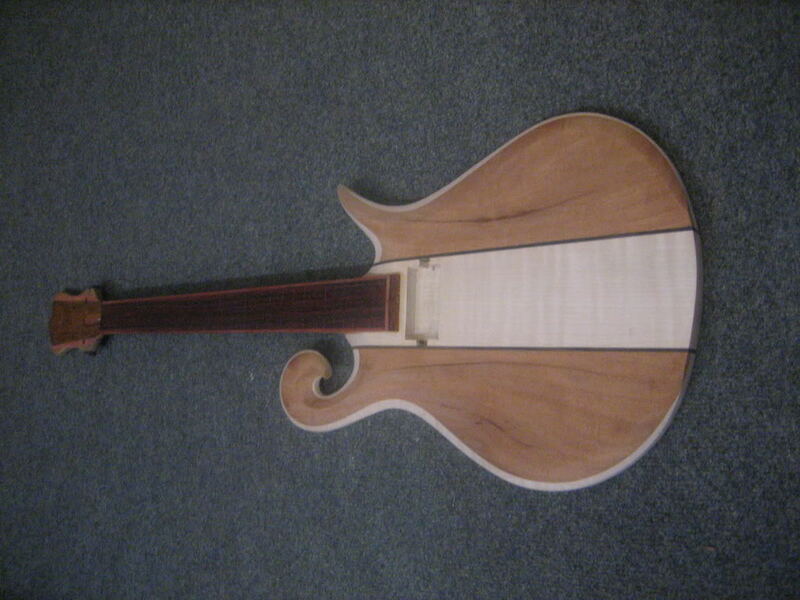 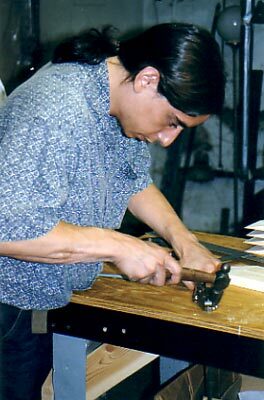 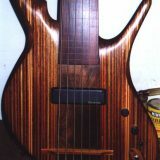 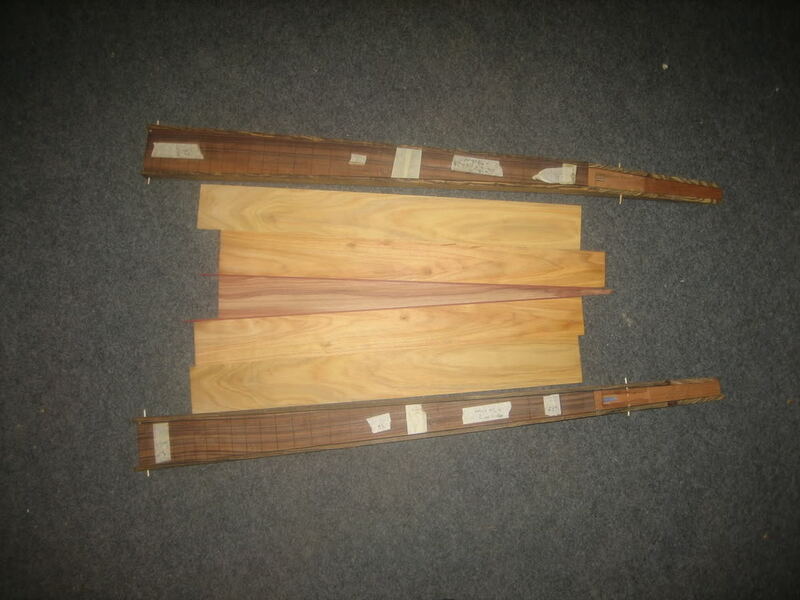 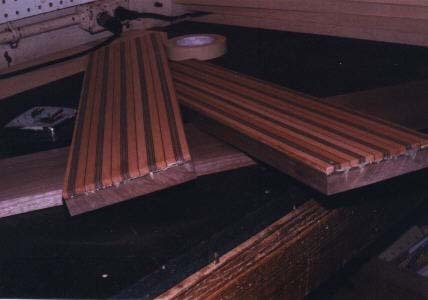 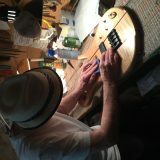 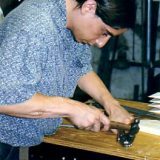 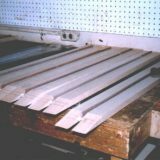 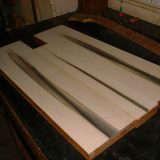 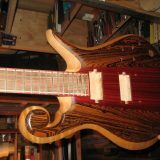 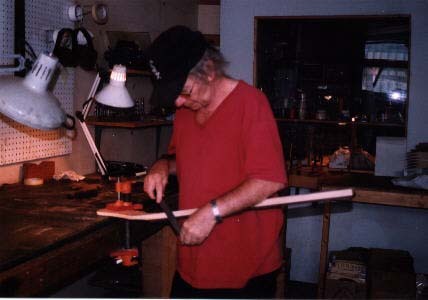 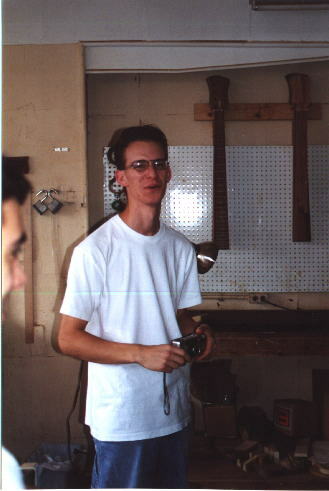 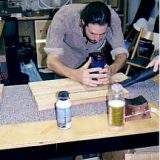 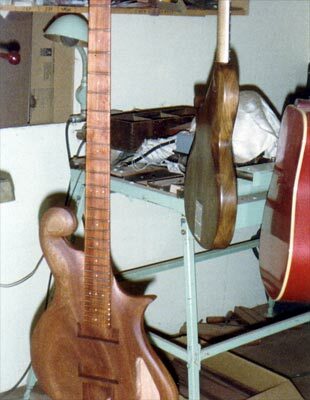 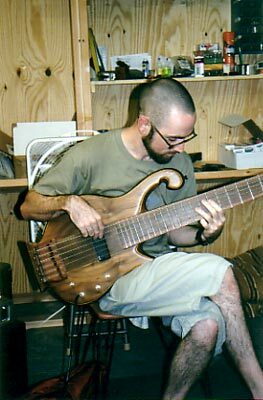 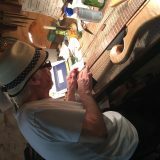 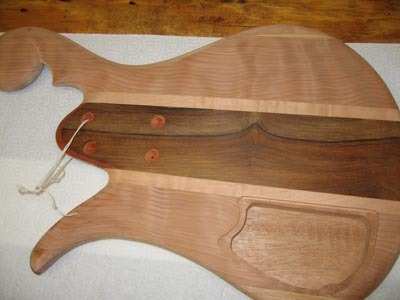 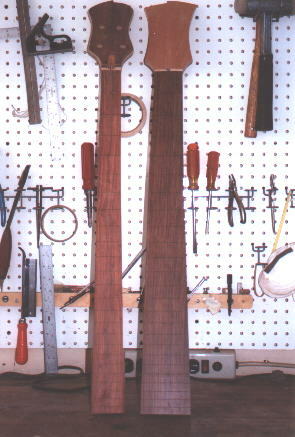 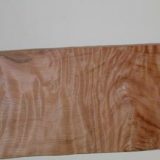 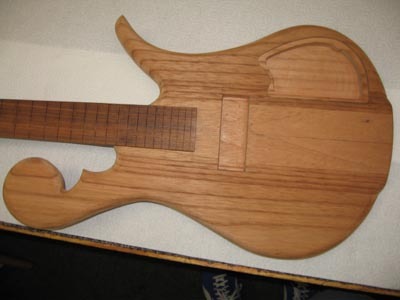 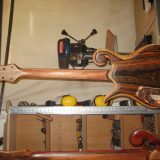 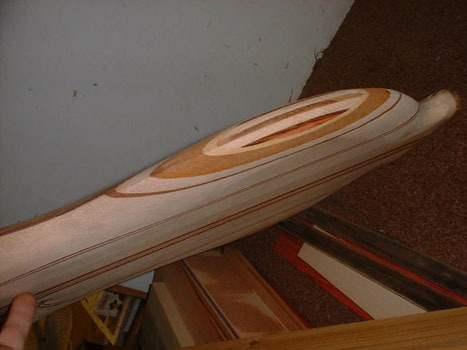 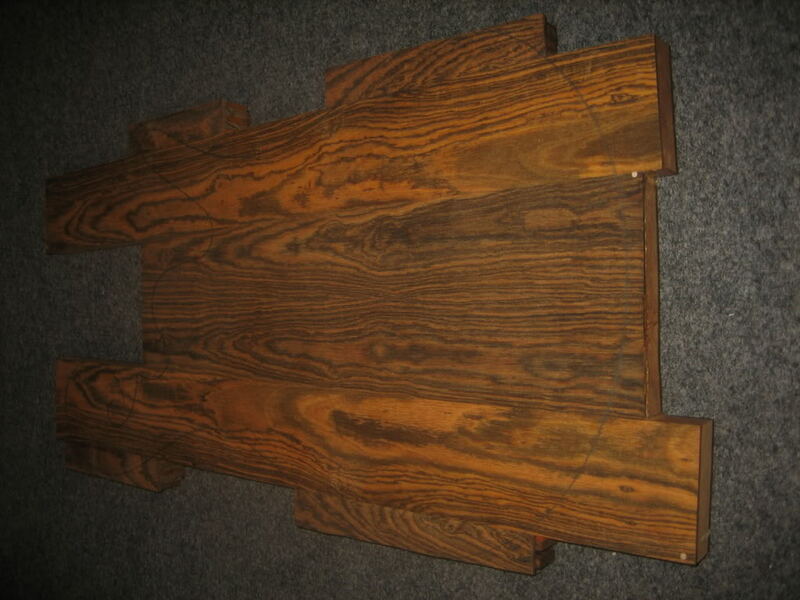 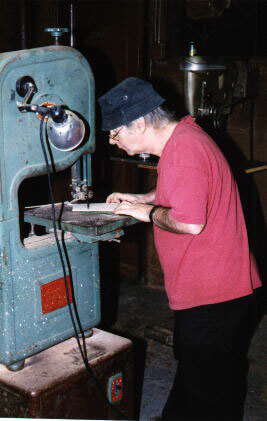 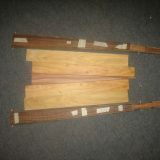 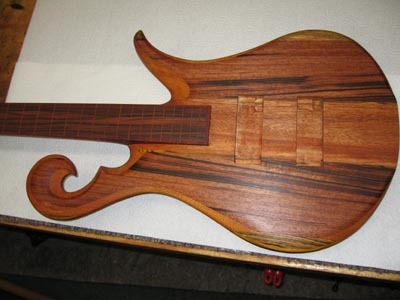 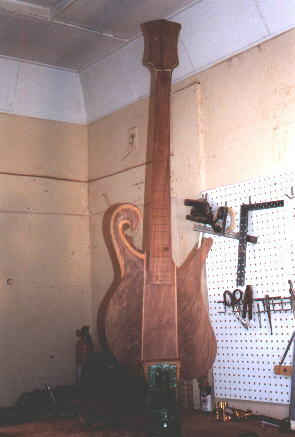 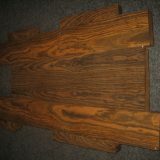 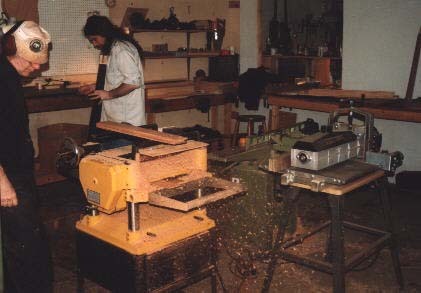 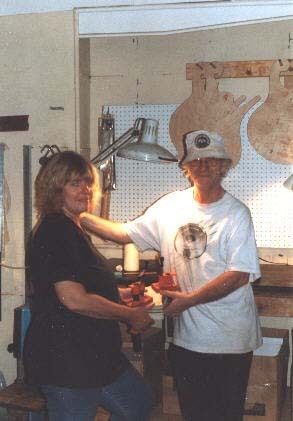 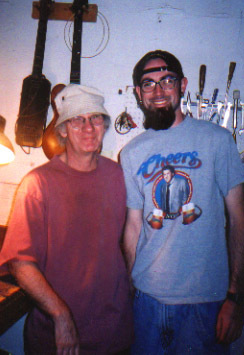 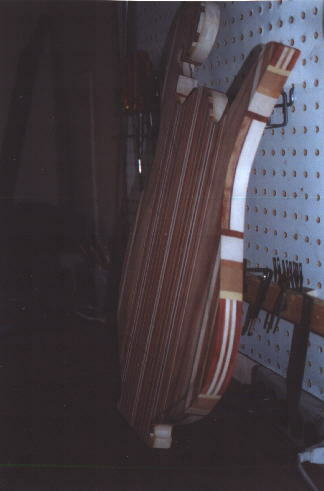 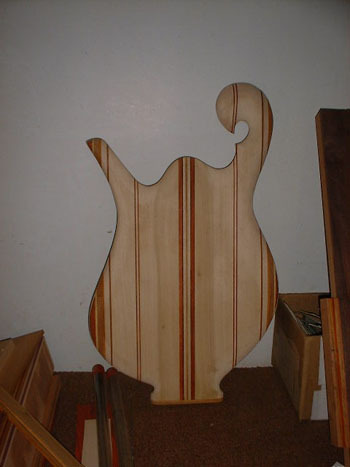 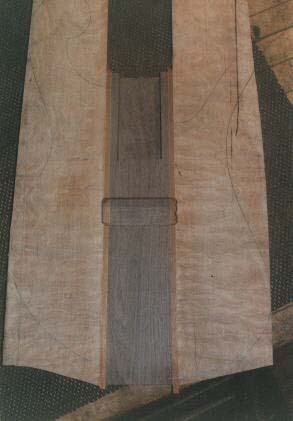 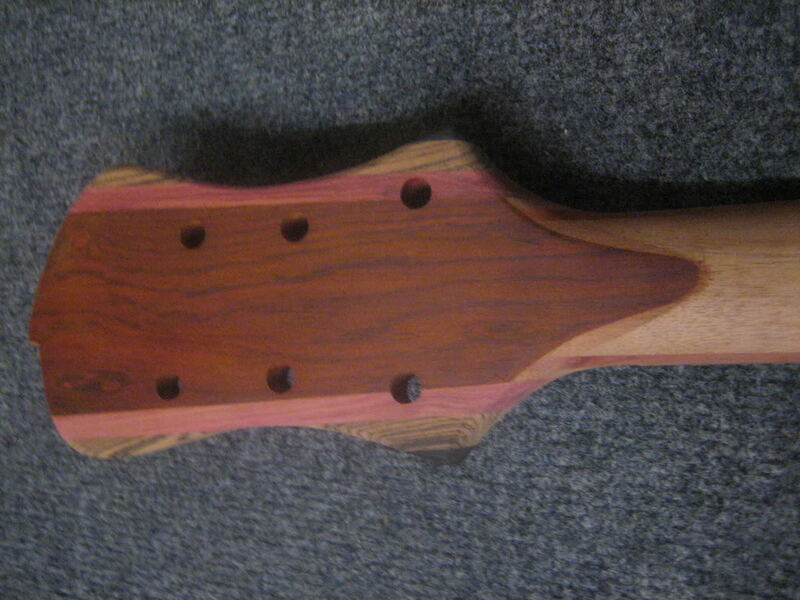 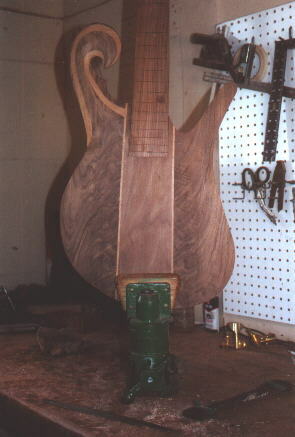 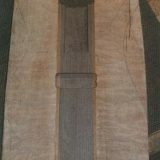 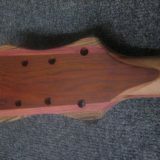 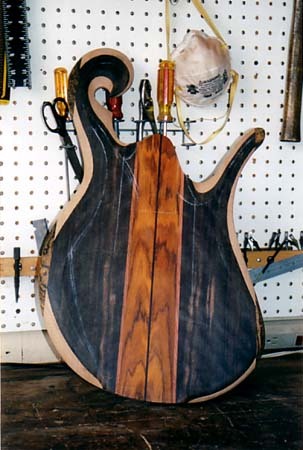 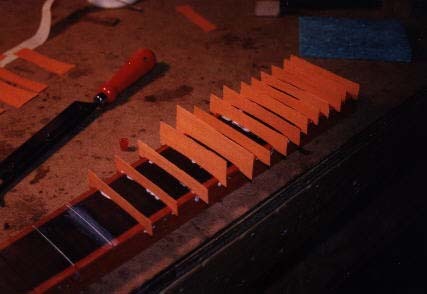 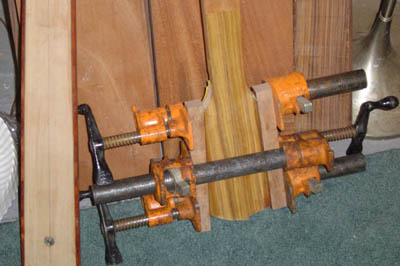 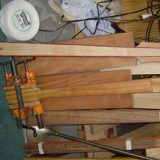 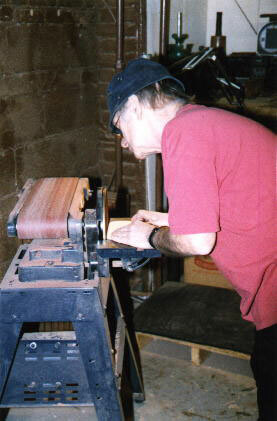 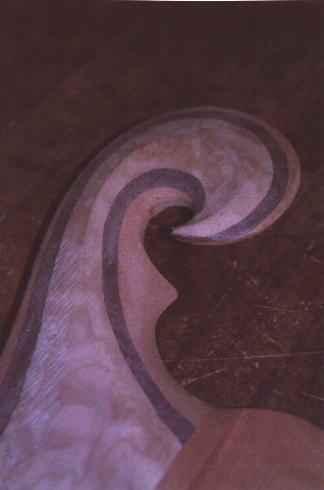 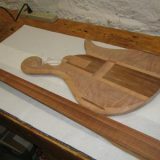 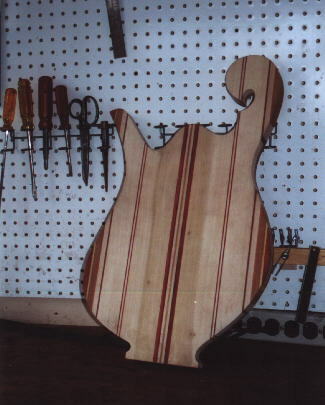 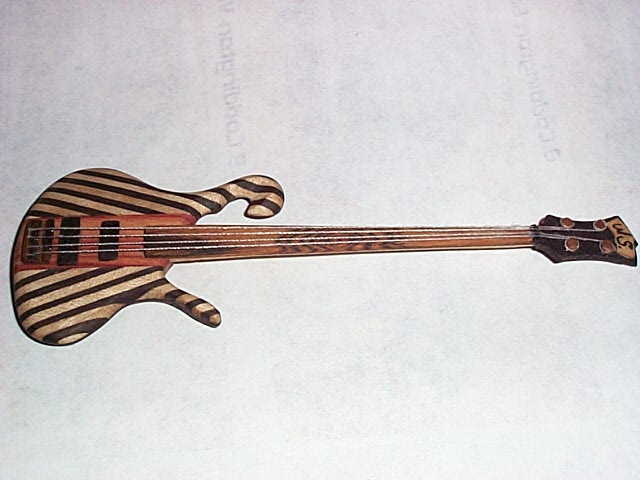 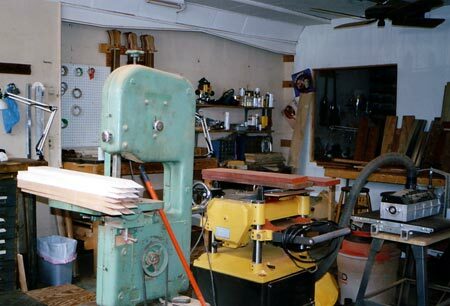 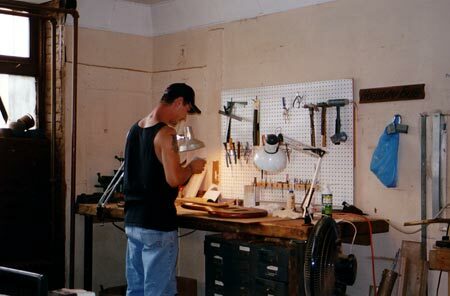 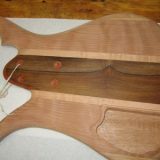 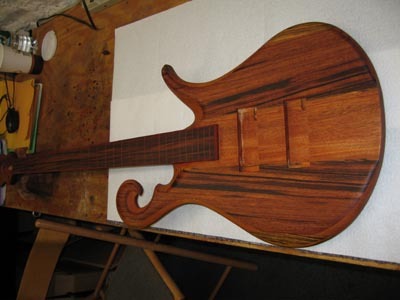 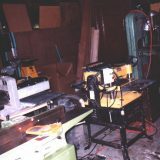 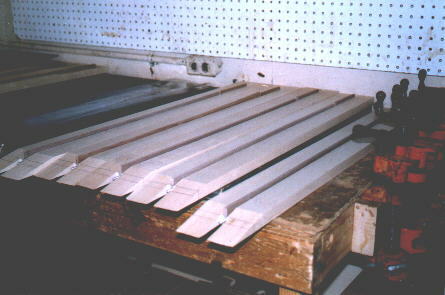 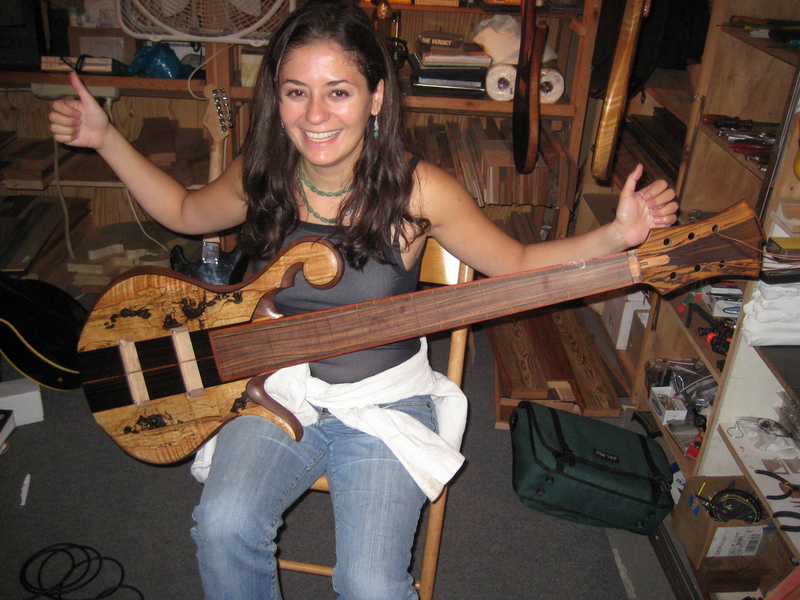 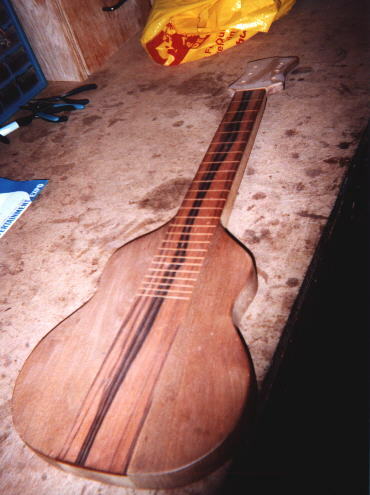 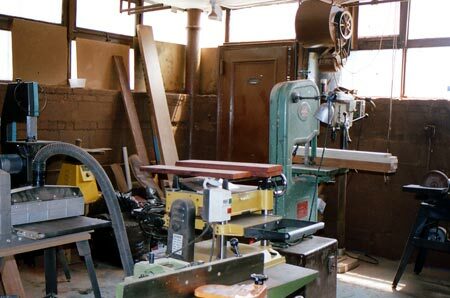 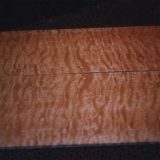 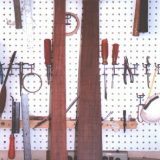 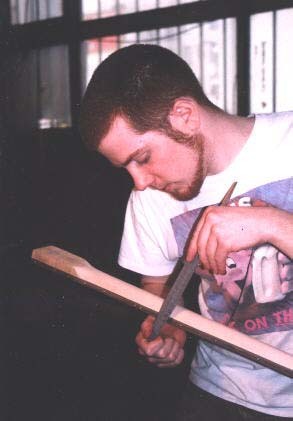 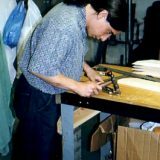 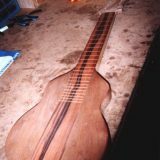 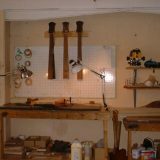 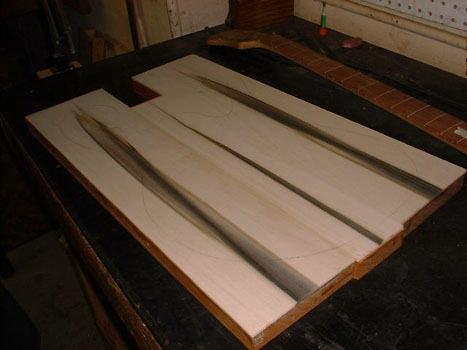 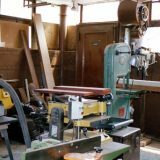 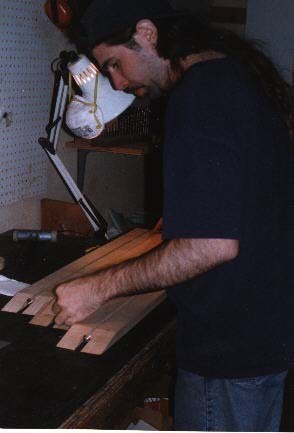 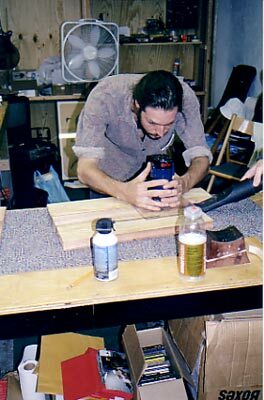 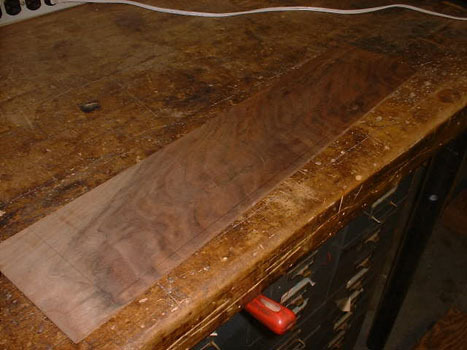 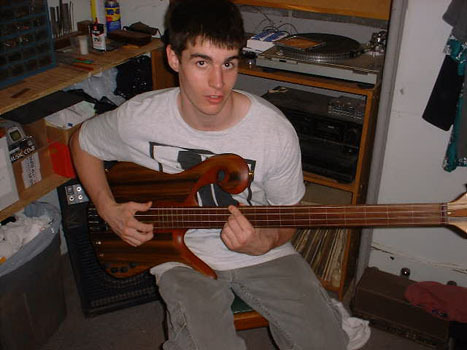 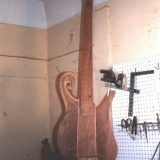 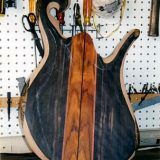 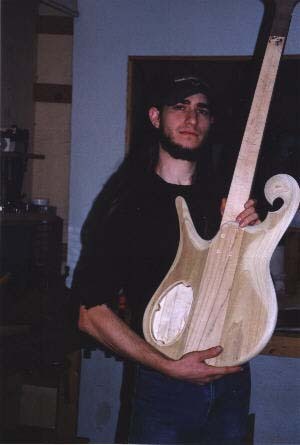 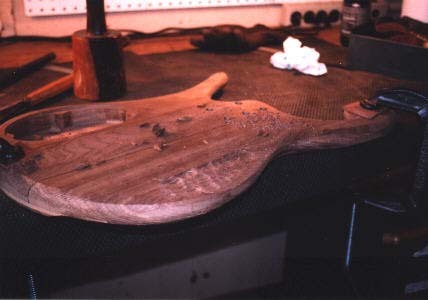 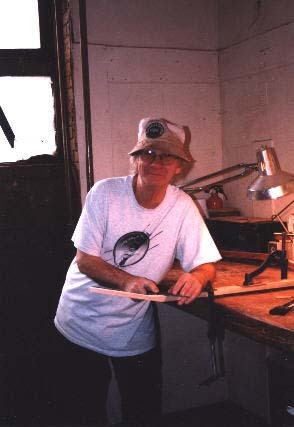 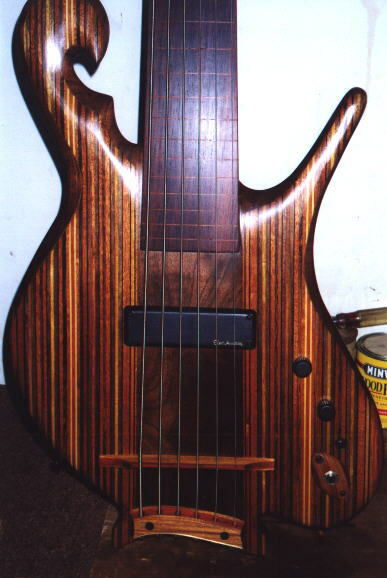 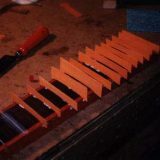 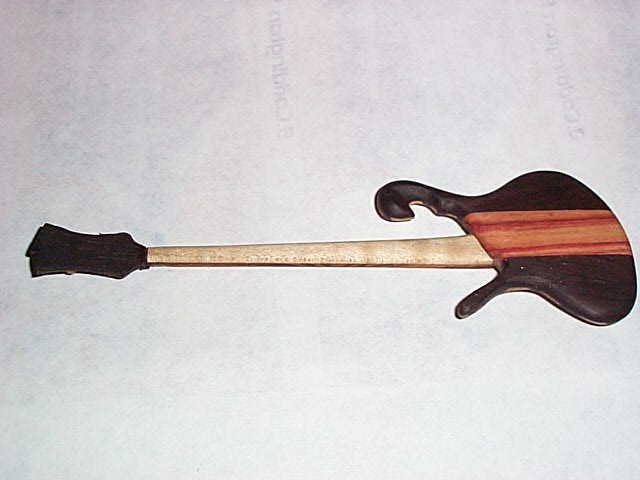 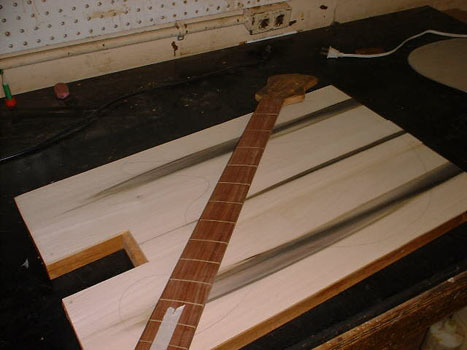 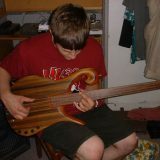 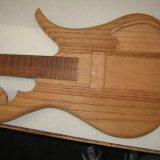 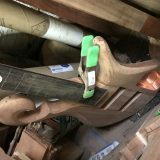 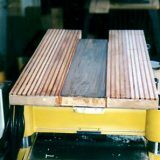 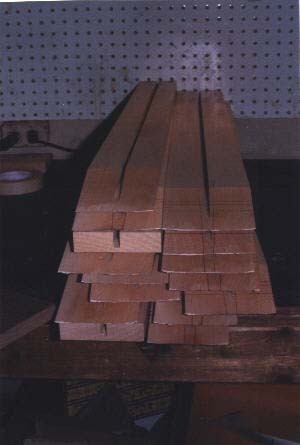 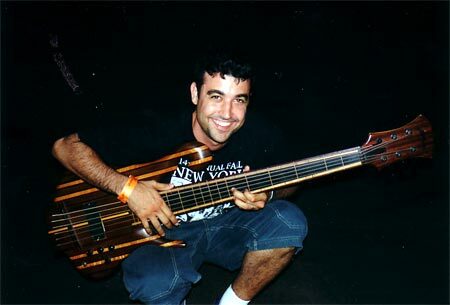 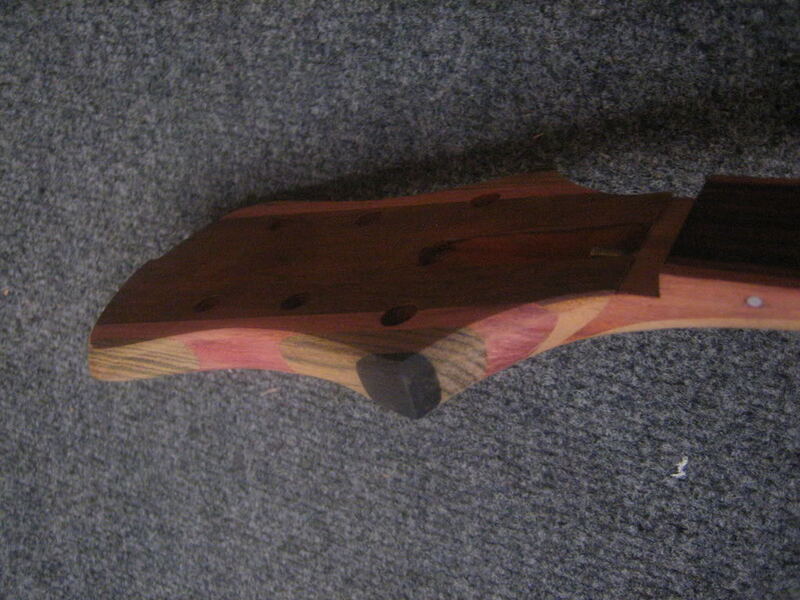 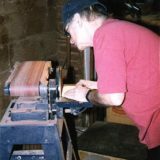 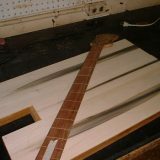 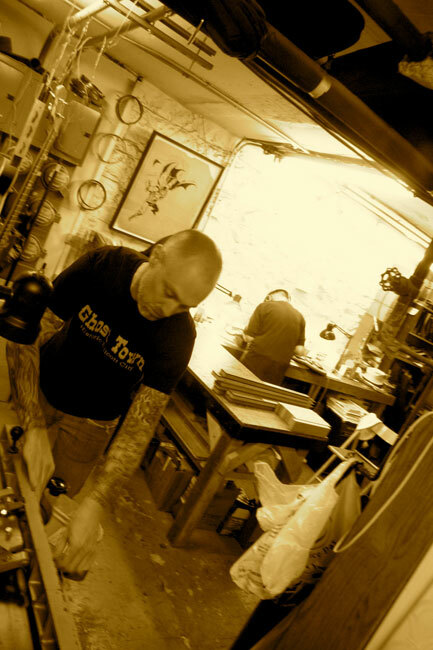 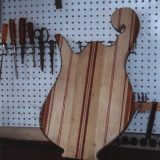 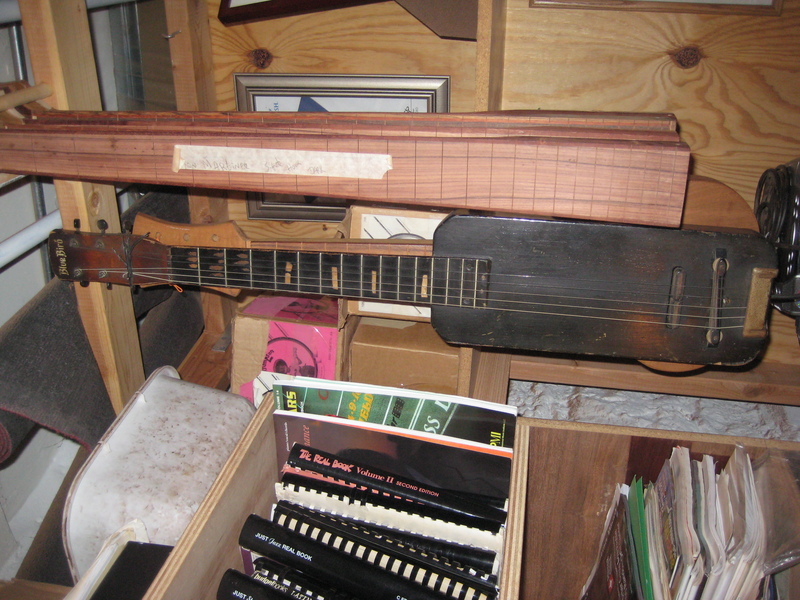 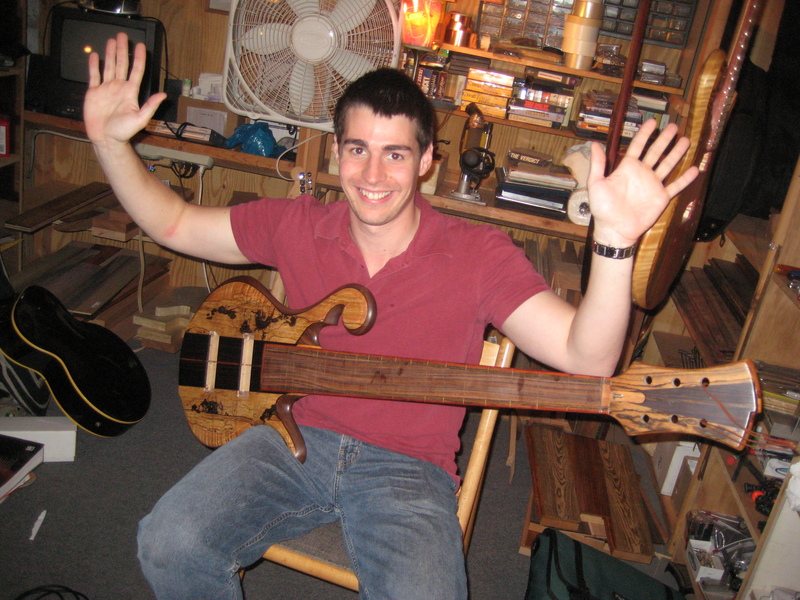 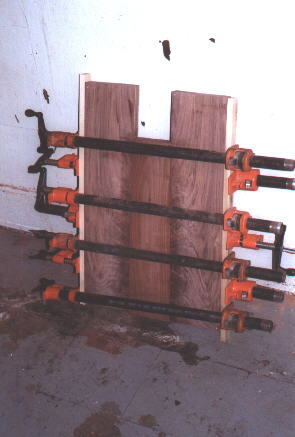 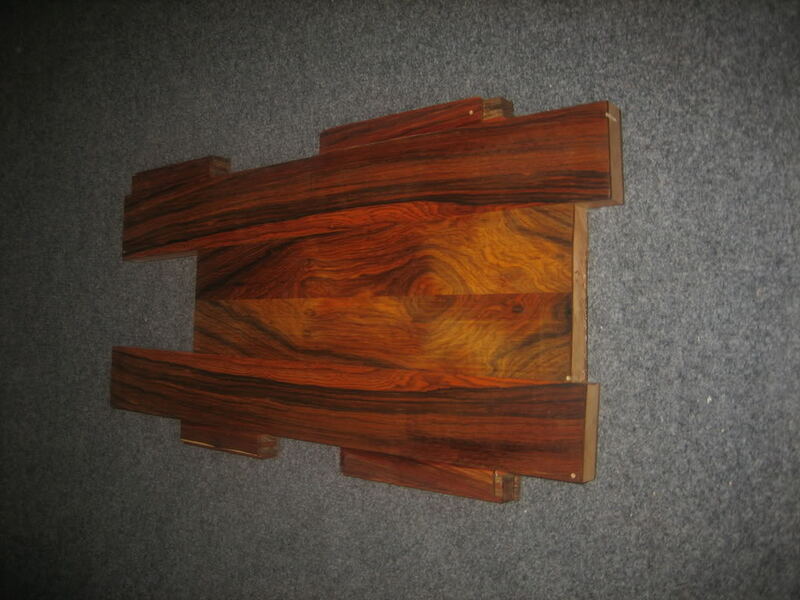 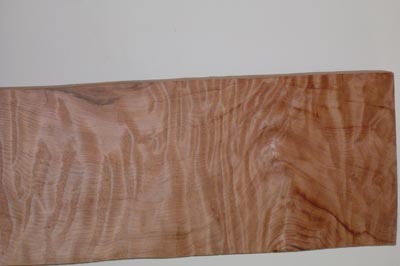 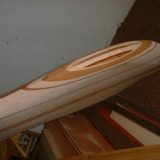 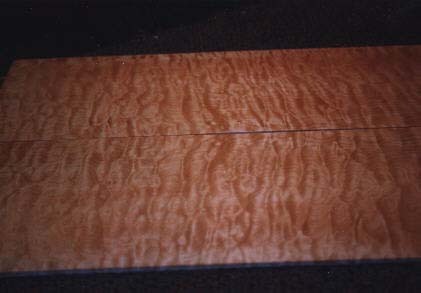 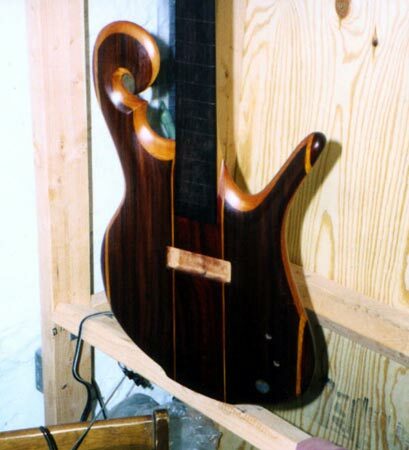 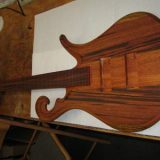 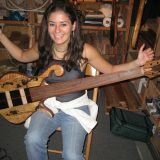 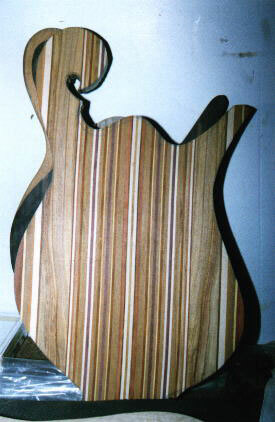 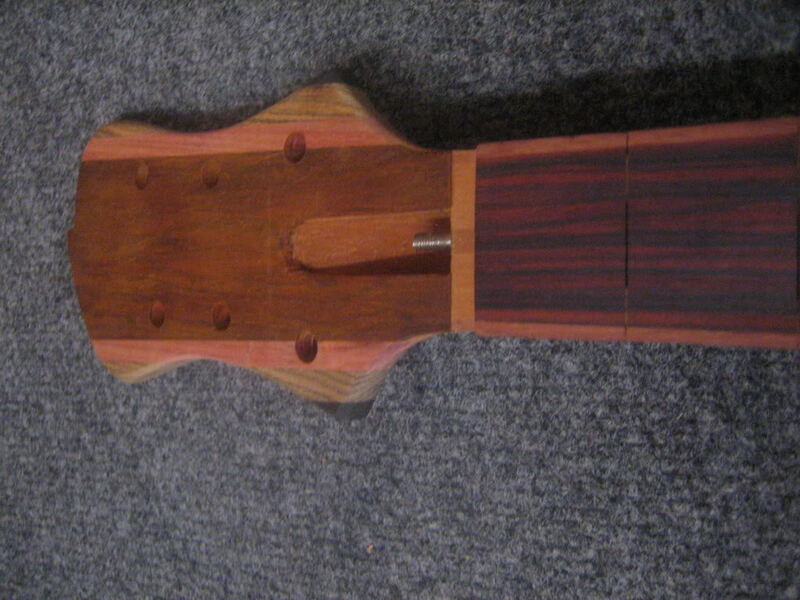 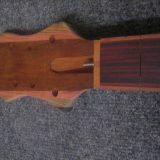 A lapsteel Carl was building for his father before he passed away. 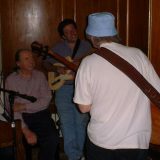 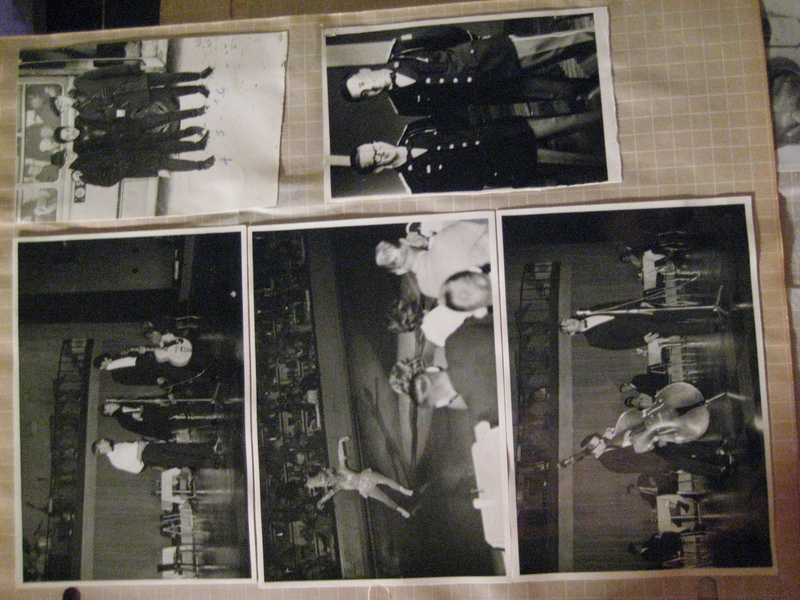 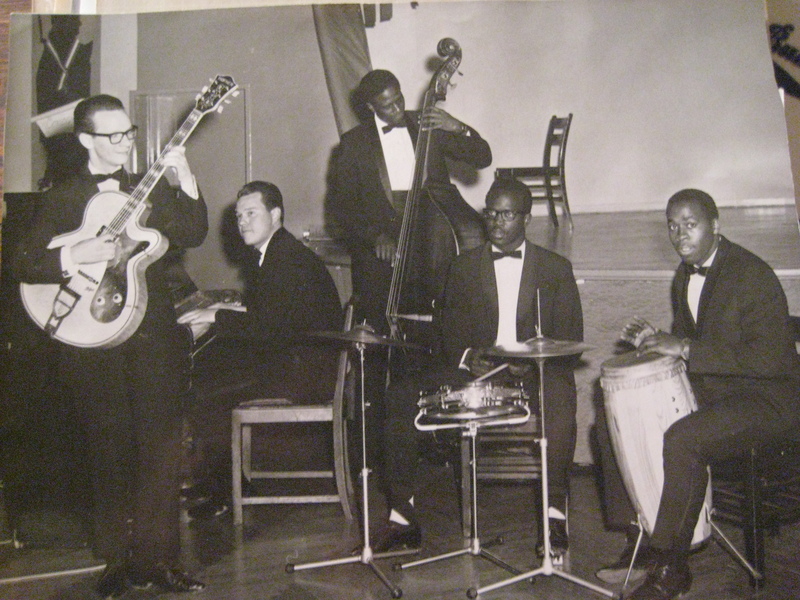 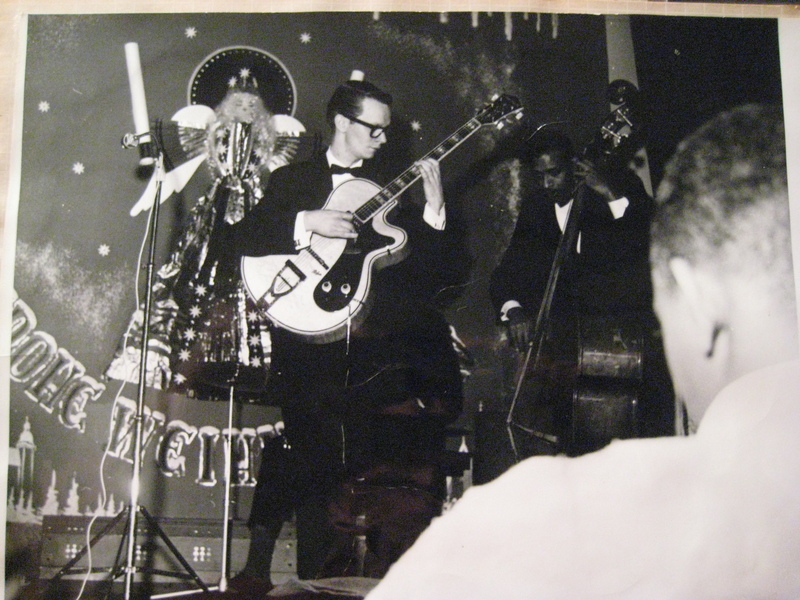 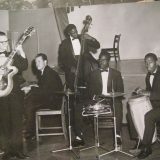 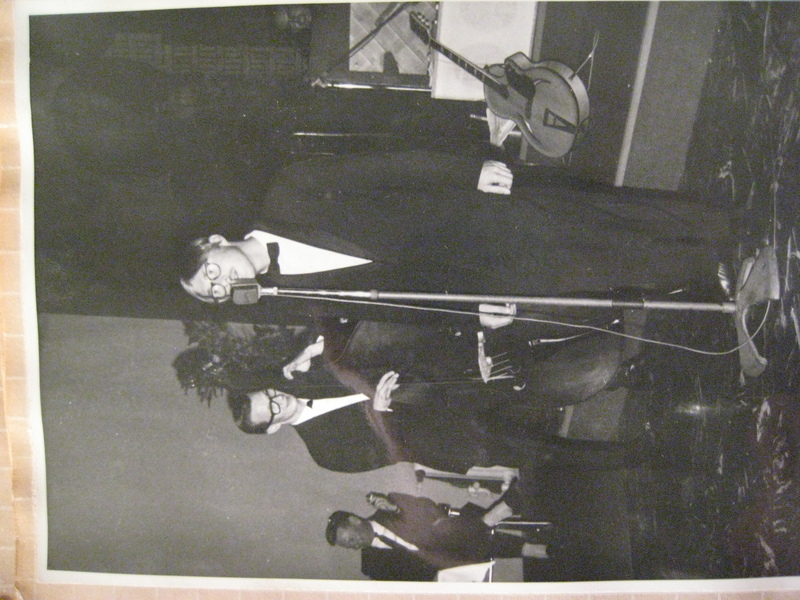 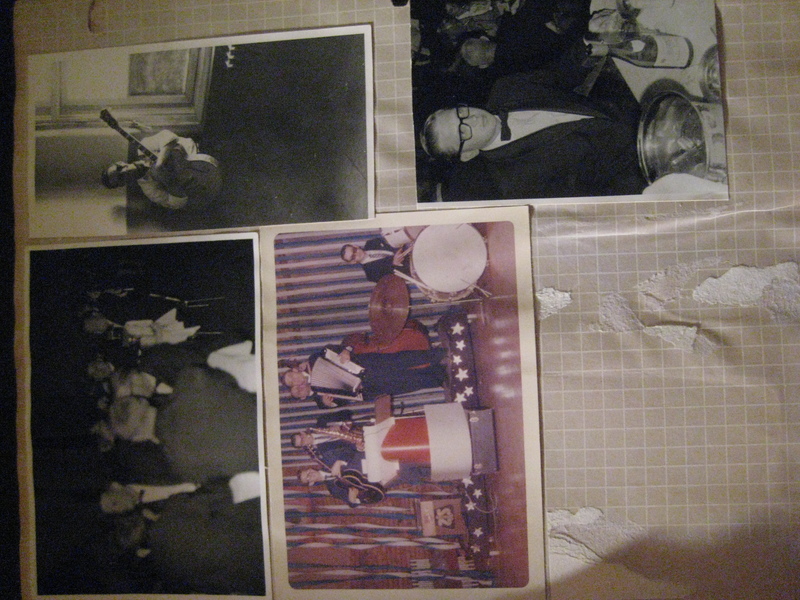 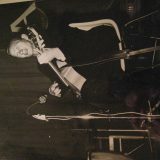 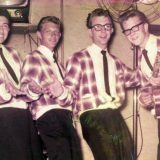 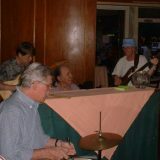 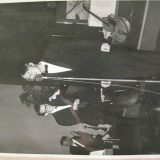 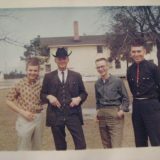 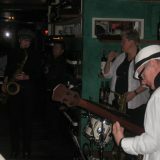 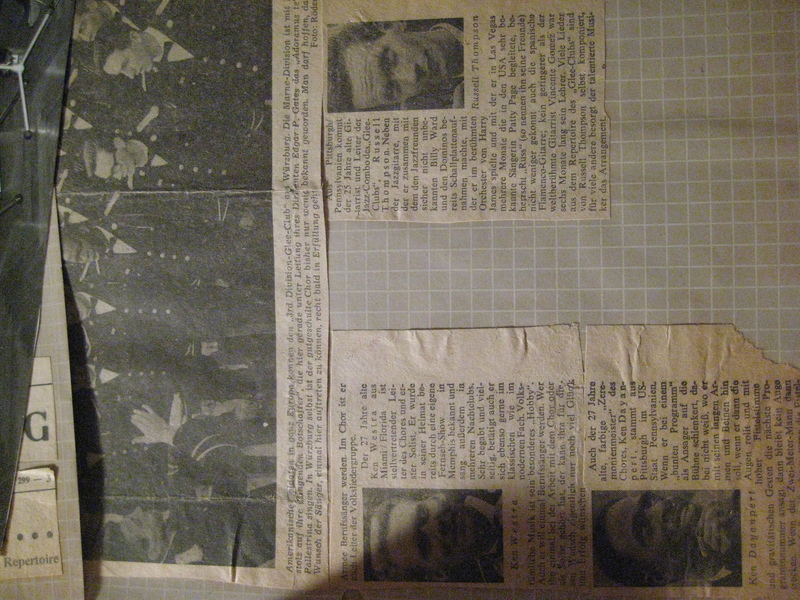 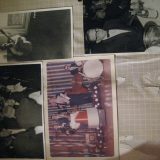 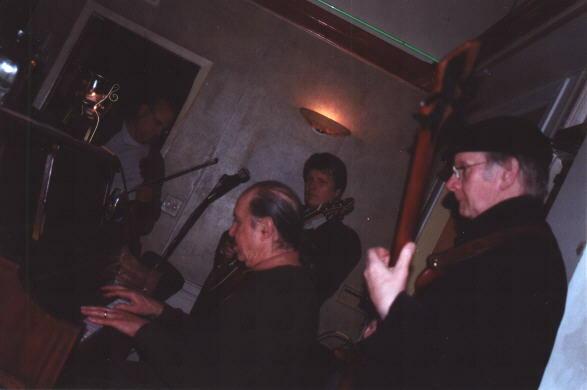 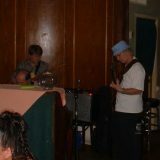 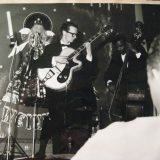 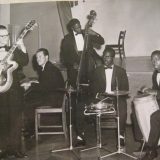 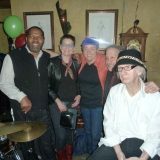 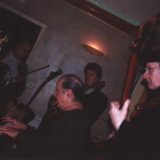 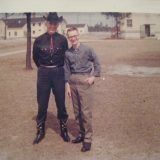 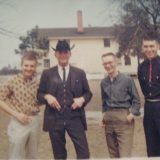 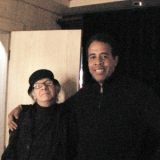 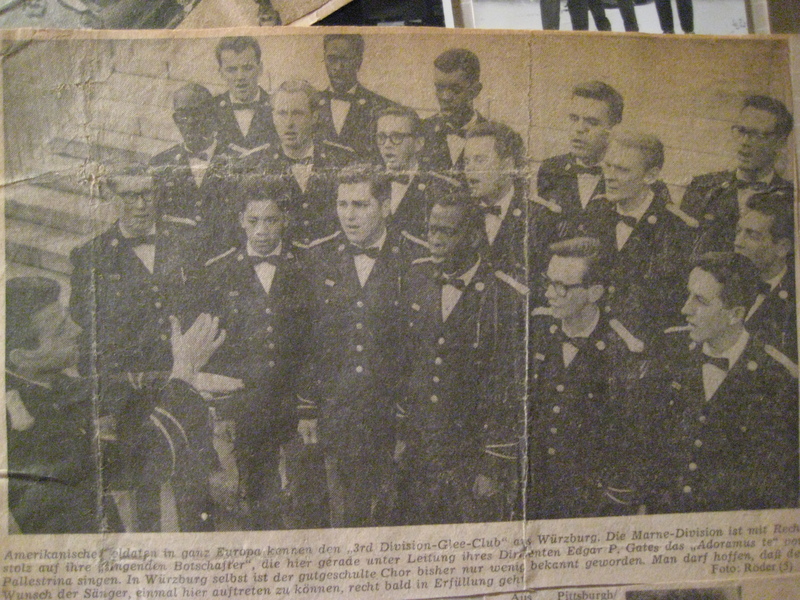 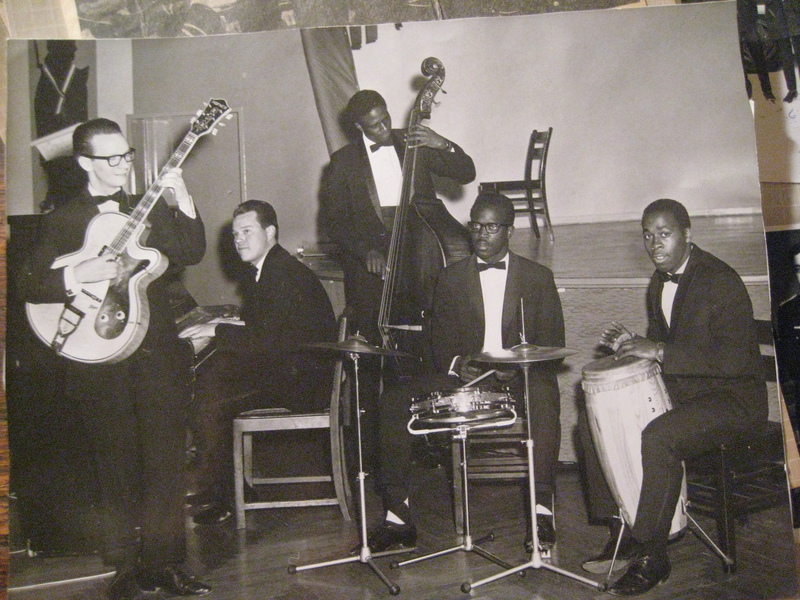 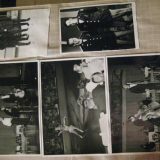 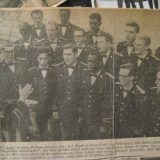 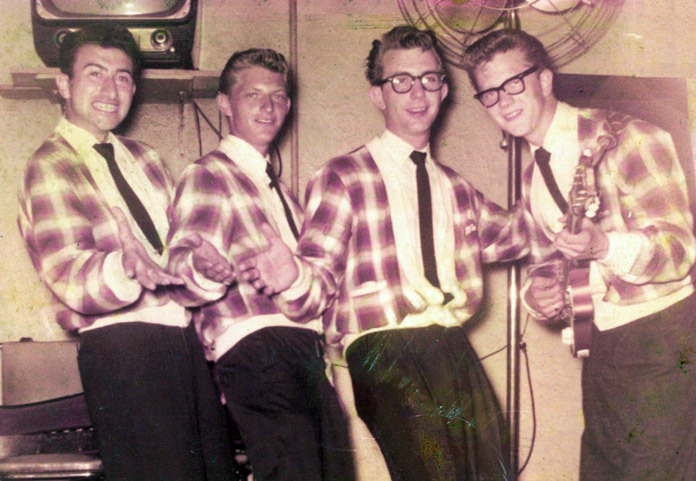 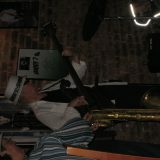 See the one of a young Carl with Sonny Krupar in a band together back in the 50’s in Pennsylvania. 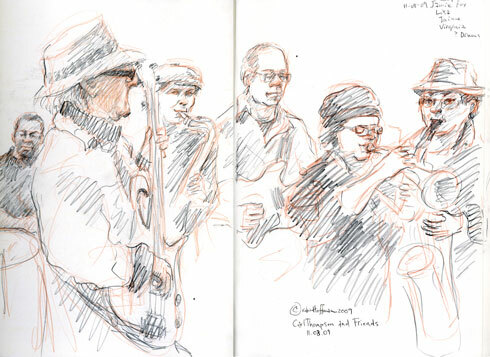 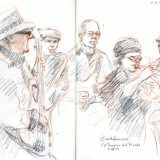 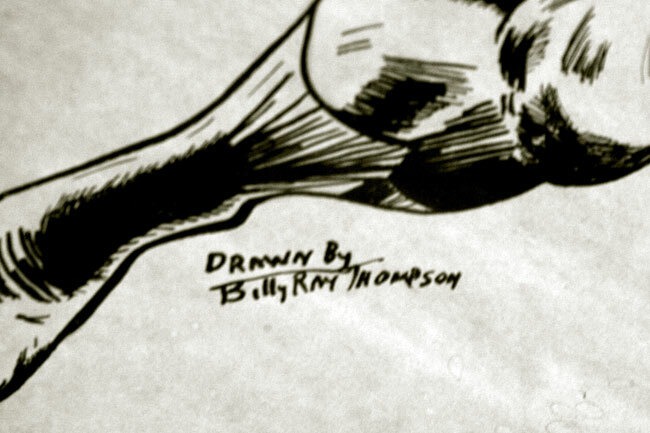 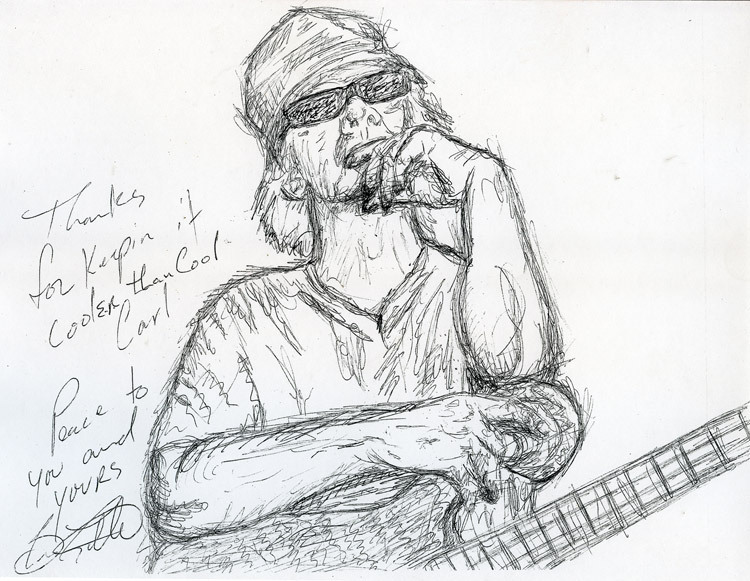 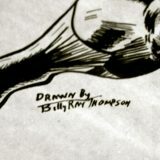 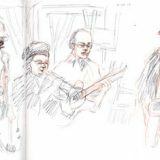 Sketches are by Robin Hoffman. 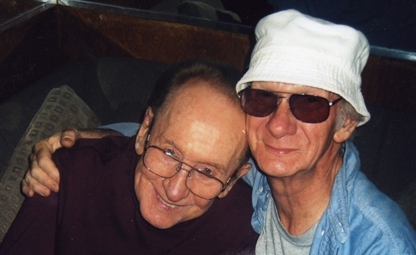 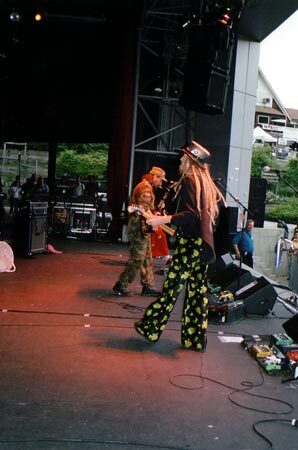 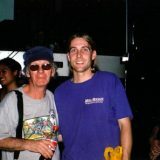 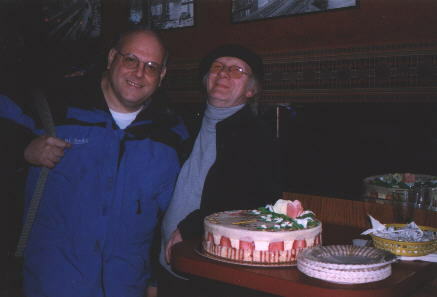 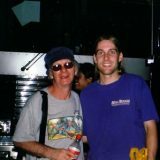 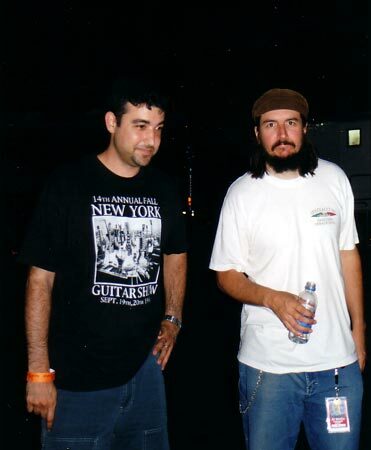 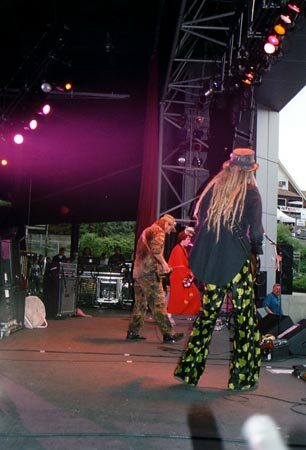 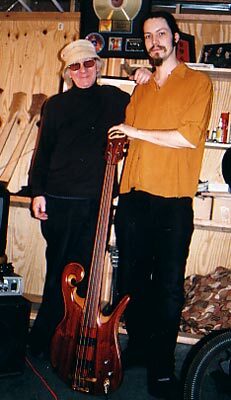 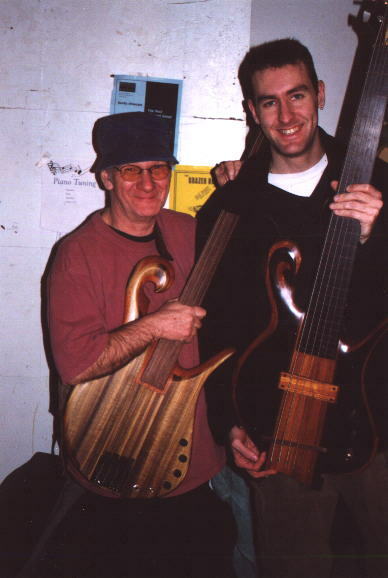 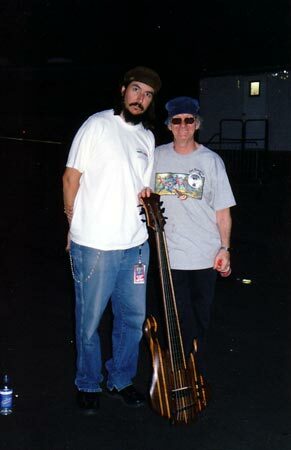 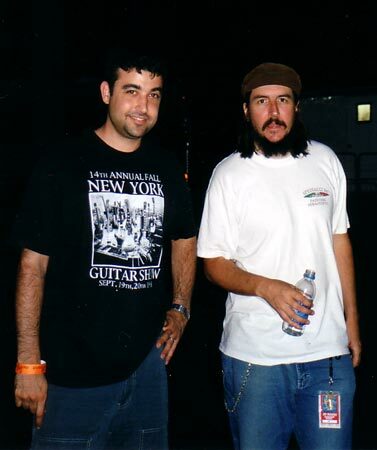 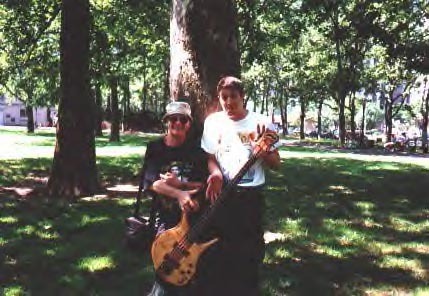 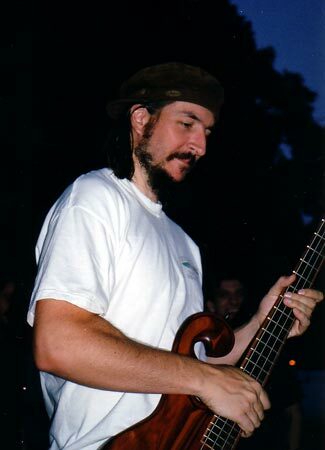 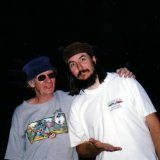 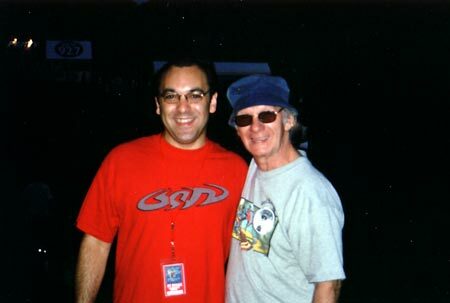 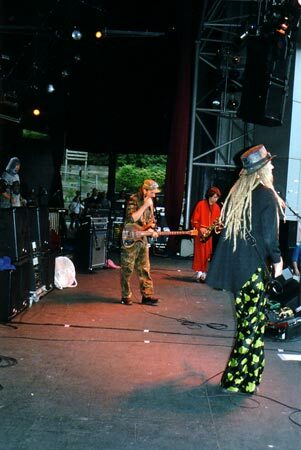 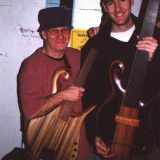 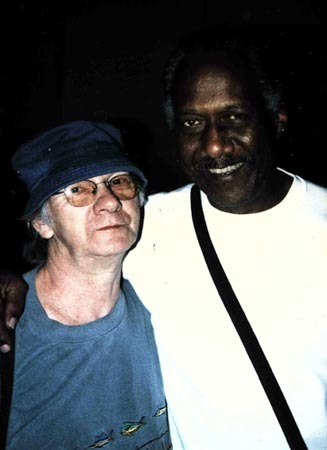 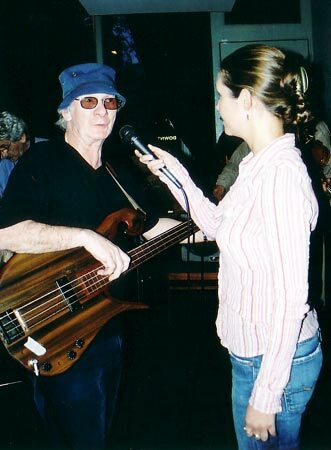 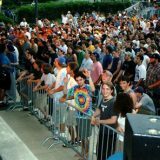 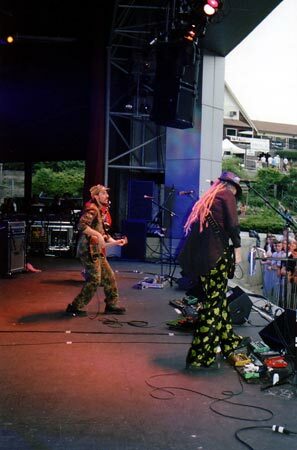 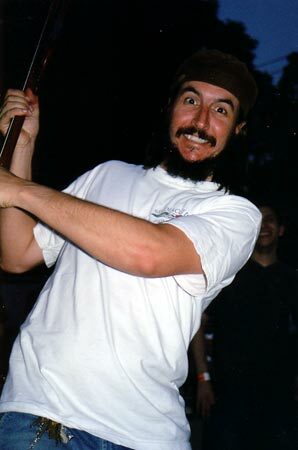 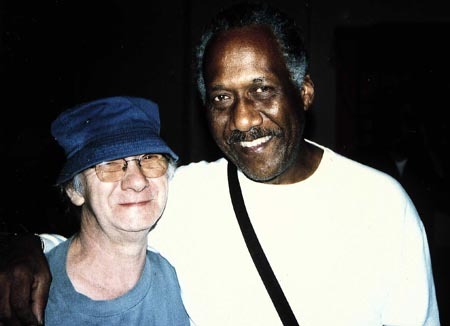 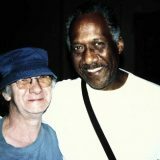 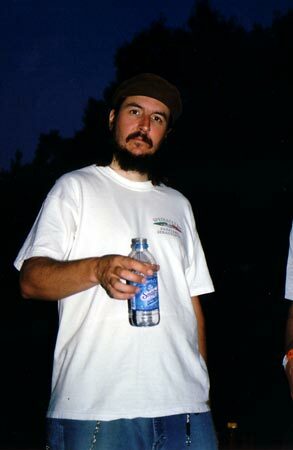 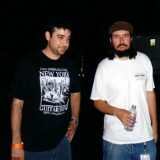 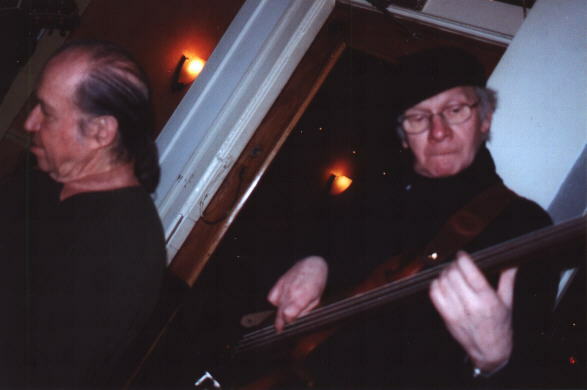 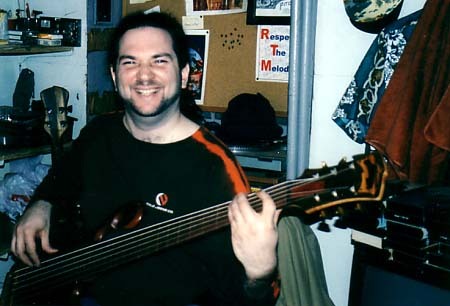 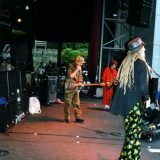 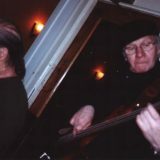 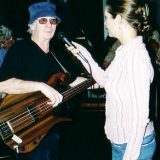 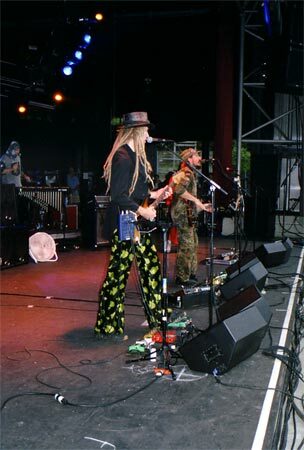 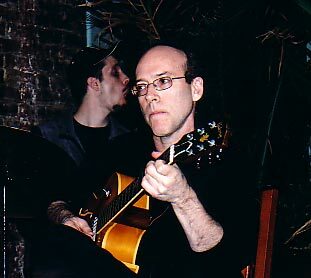 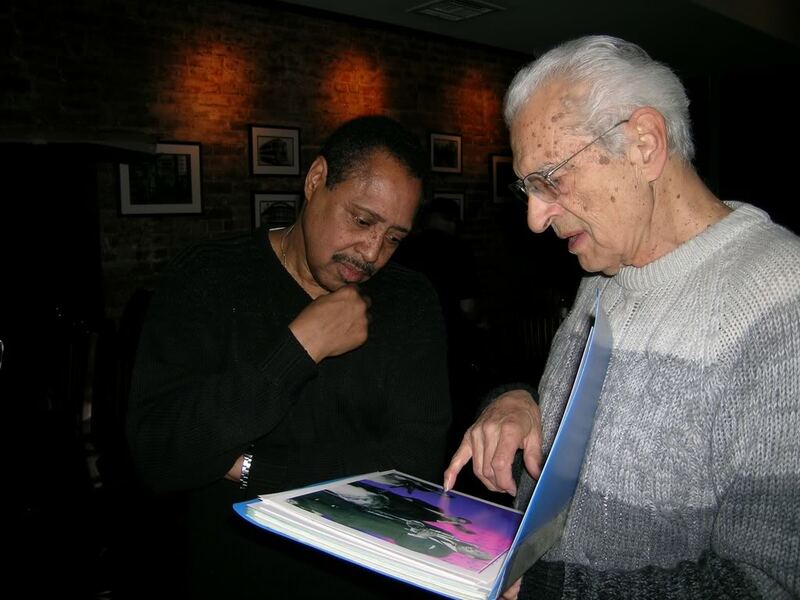 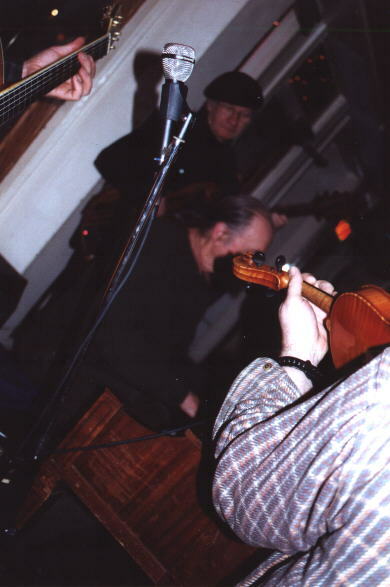 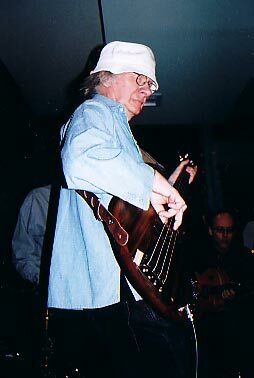 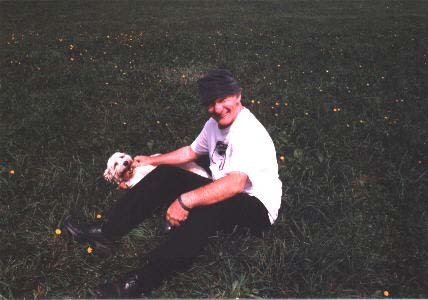 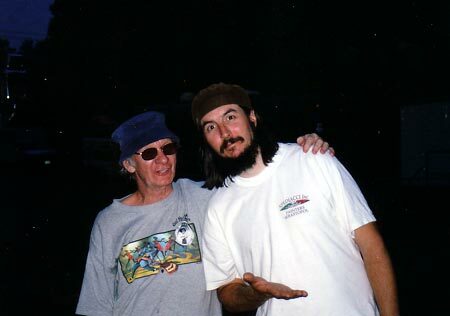 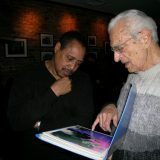 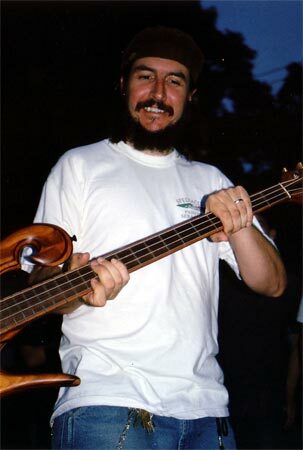 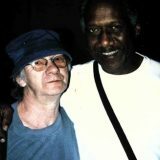 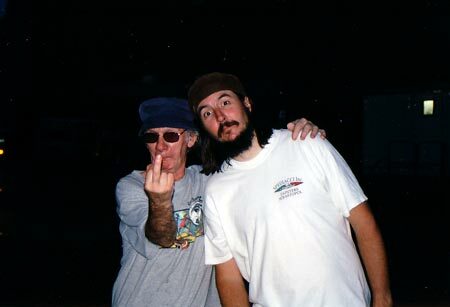 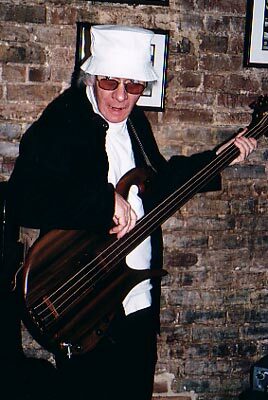 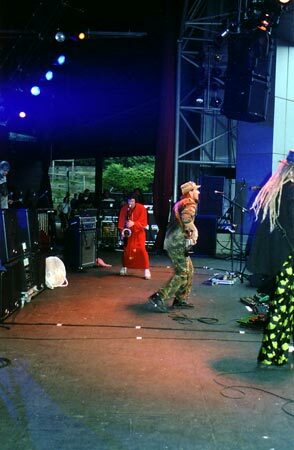 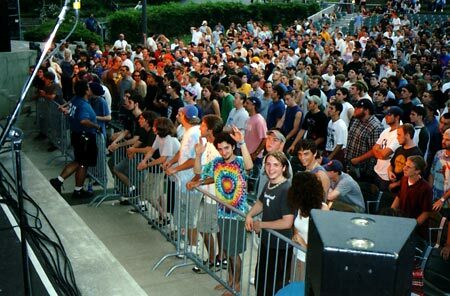 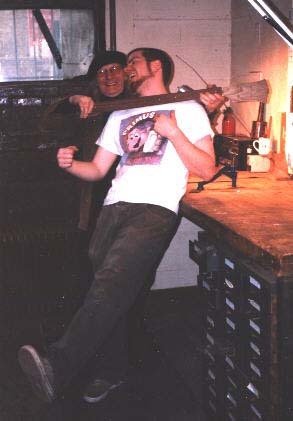 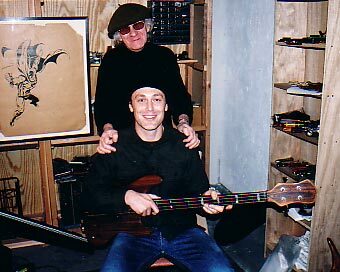 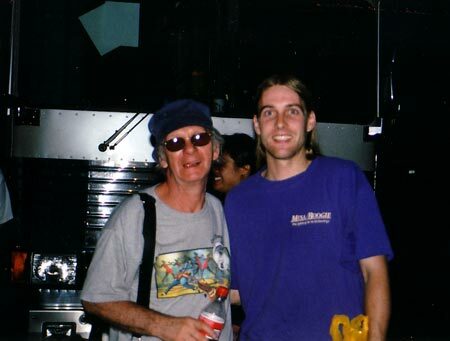 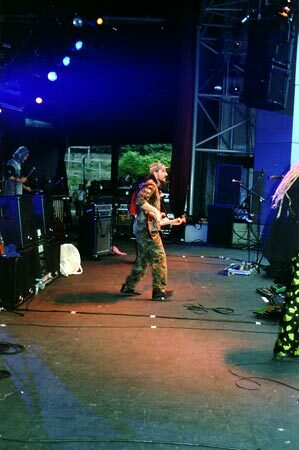 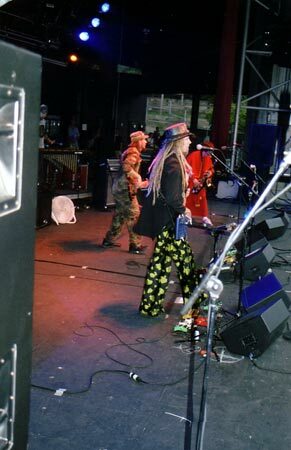 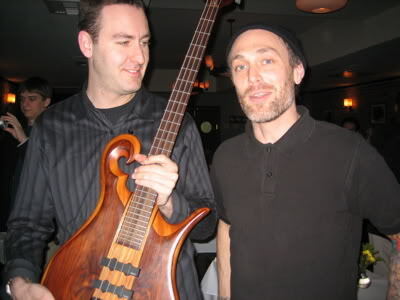 Carl with Chuck Rainey at Bass Day ’99, photos courtesy Dieter Heinsohn. 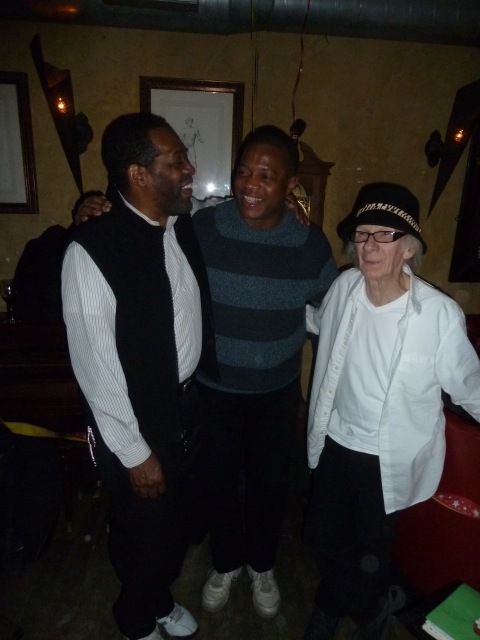 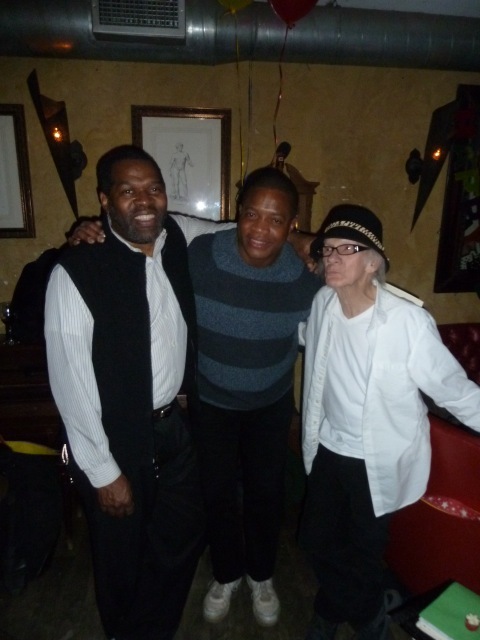 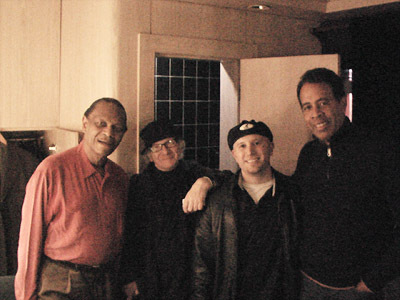 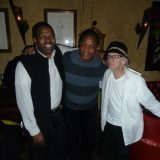 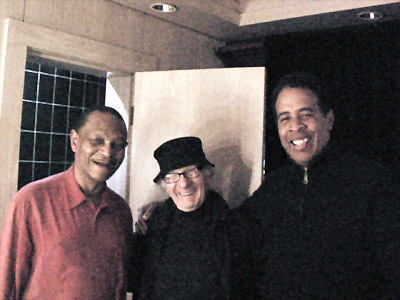 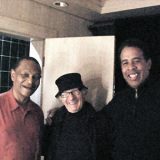 Carl with Billy Cobham, Stanley Clarke, and McCoy Tyner. 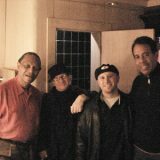 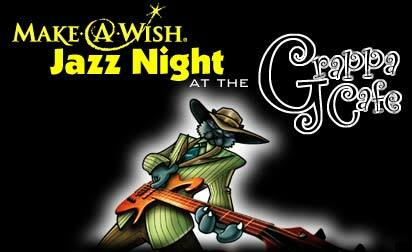 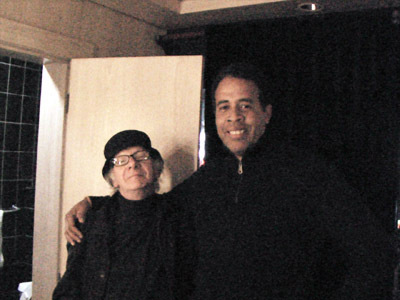 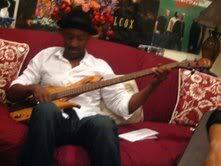 Carl with Stanley Clarke, Victor Wooten and Marcus Miller. 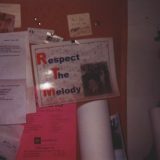 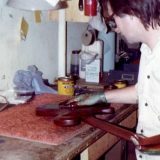 Here is a photo that Carl took from Danny Armstrong’s (early 70’s probably) shop in midtown NYC. 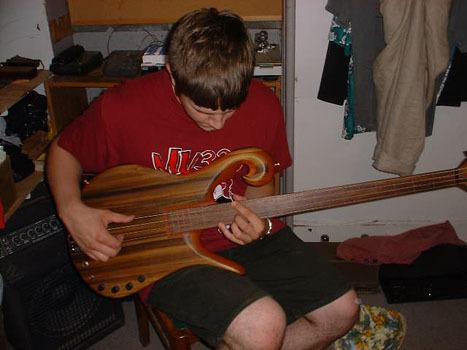 It’s a prototype that Danny himself built. 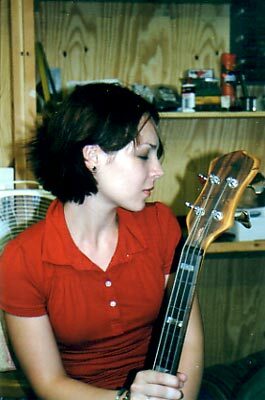 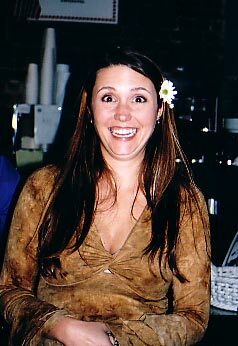 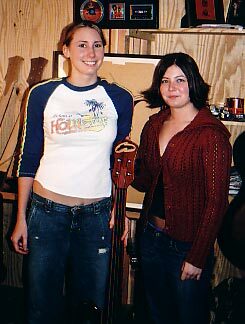 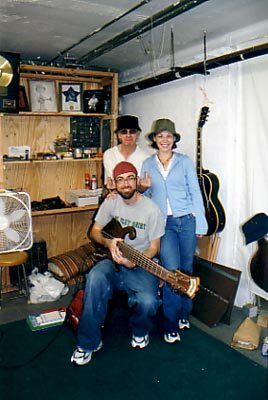 Check out Carl’s guitar resting in the background. 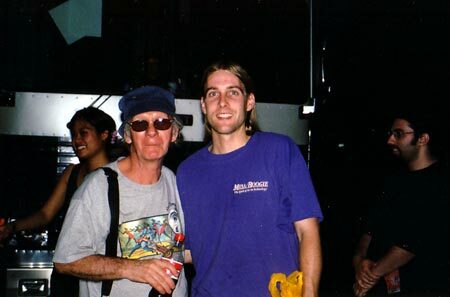 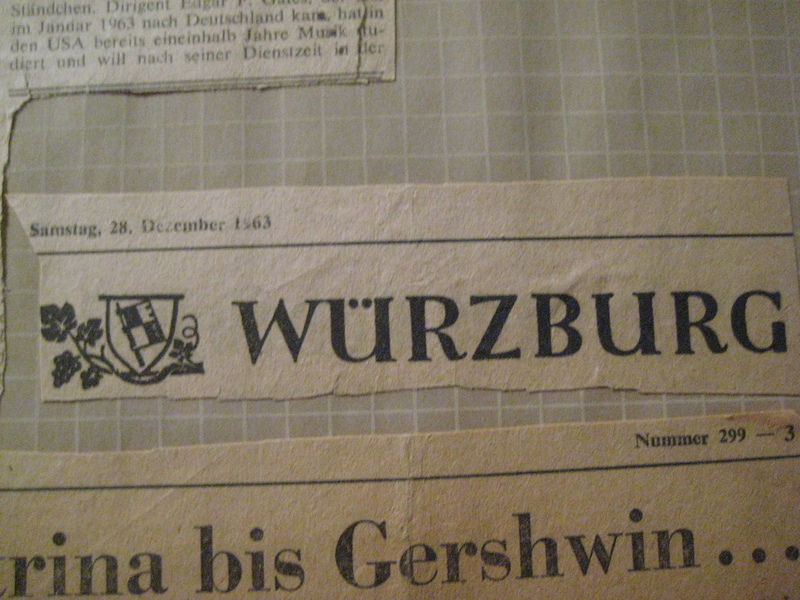 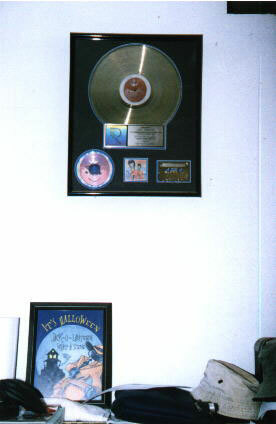 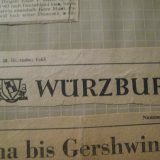 Note: Thanks to Mark Schnoor for sending us this photo. 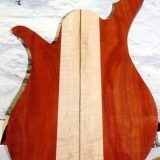 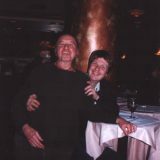 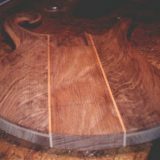 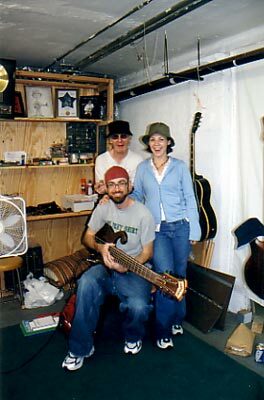 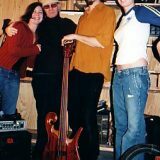 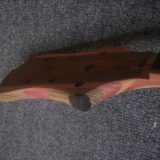 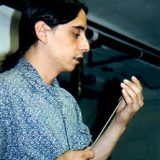 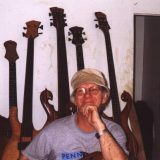 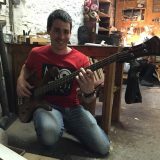 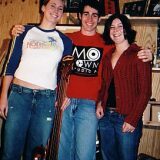 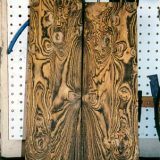 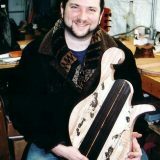 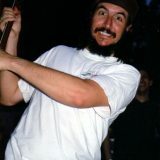 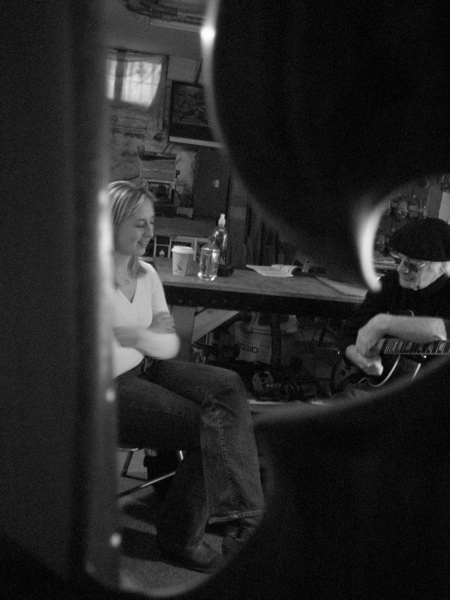 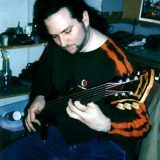 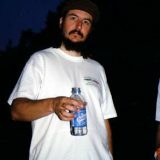 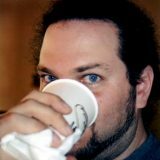 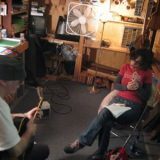 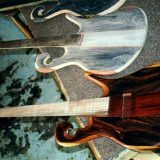 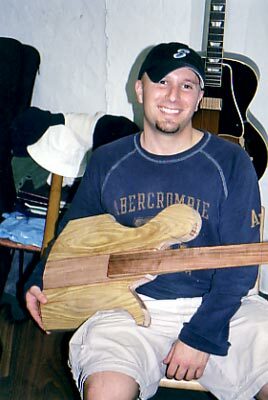 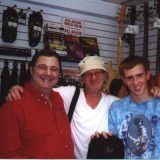 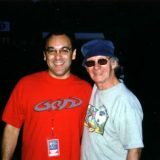 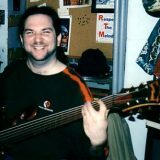 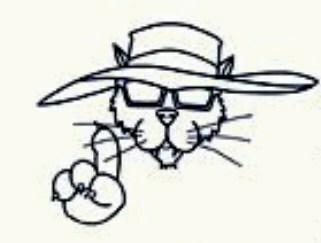 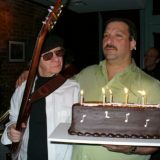 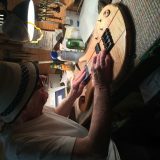 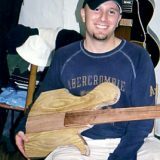 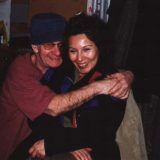 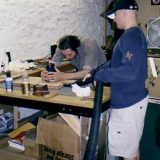 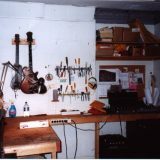 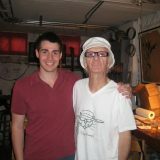 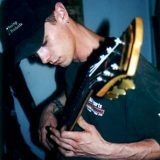 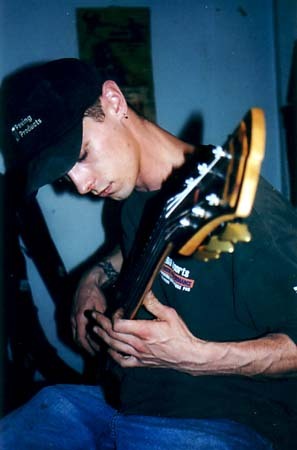 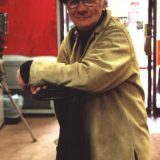 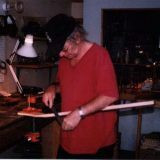 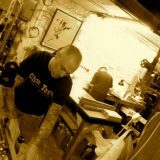 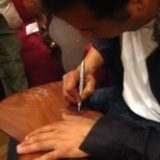 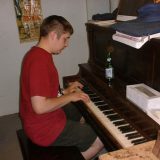 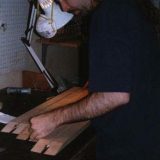 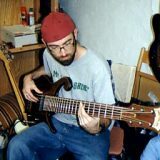 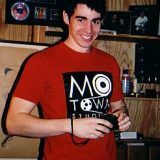 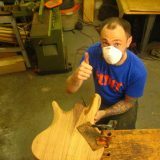 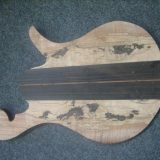 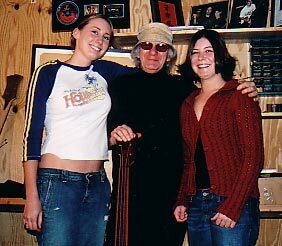 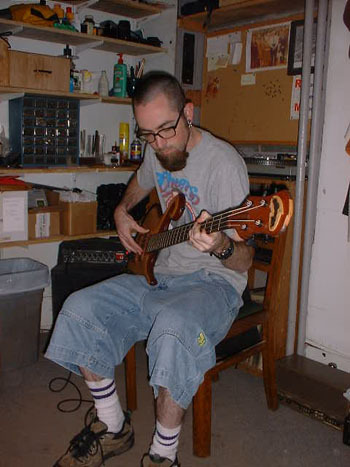 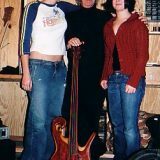 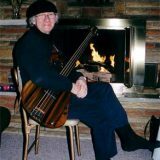 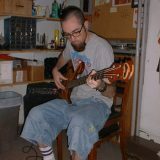 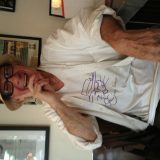 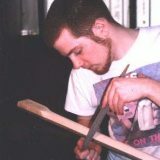 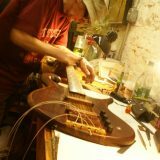 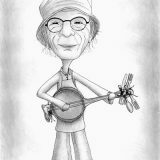 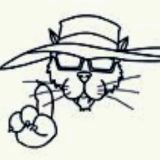 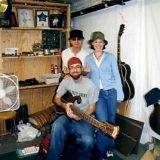 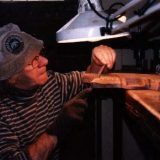 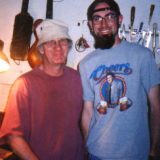 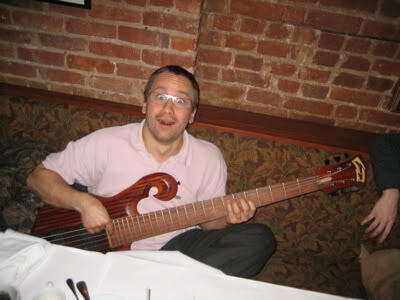 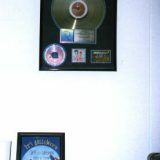 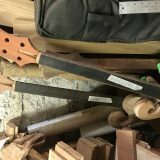 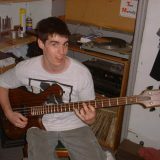 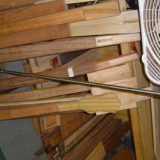 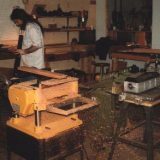 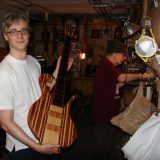 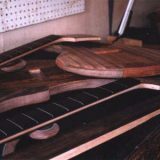 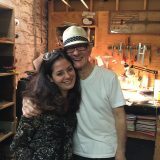 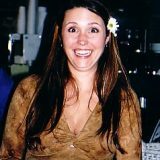 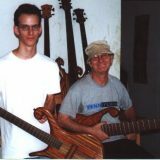 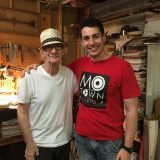 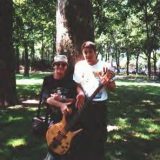 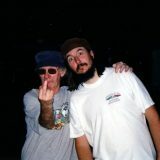 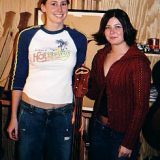 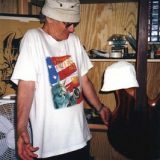 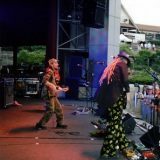 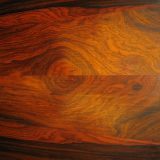 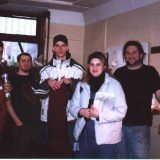 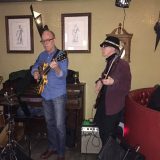 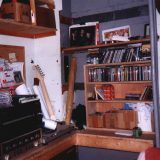 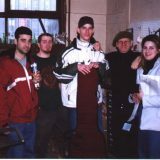 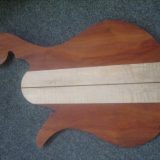 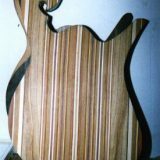 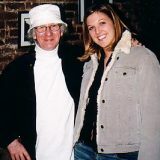 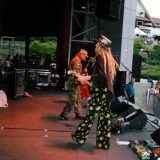 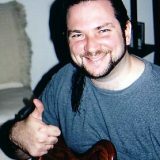 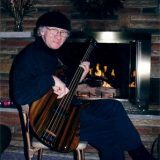 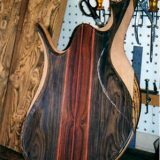 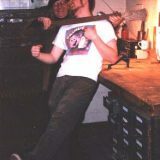 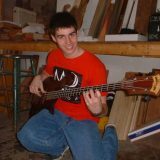 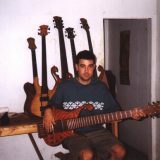 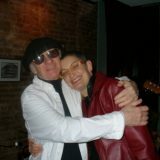 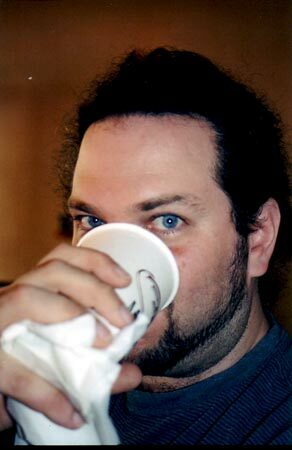 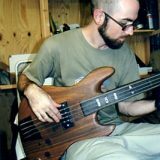 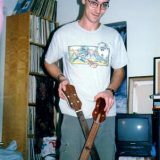 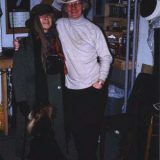 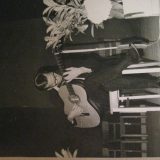 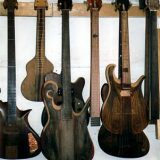 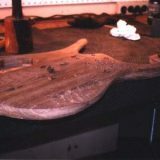 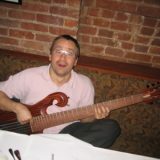 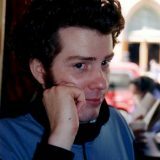 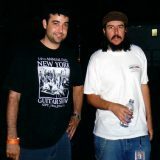 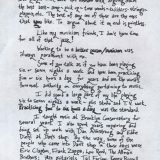 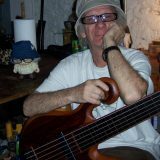 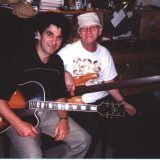 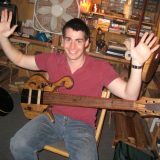 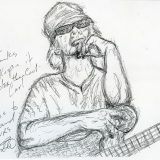 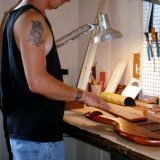 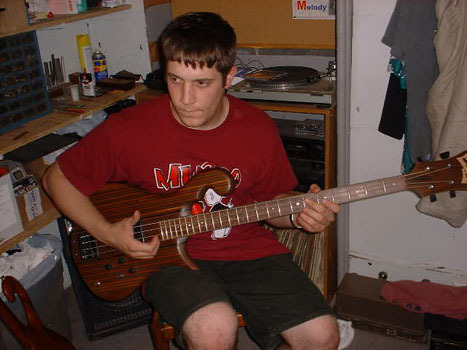 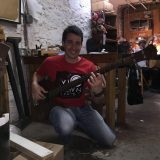 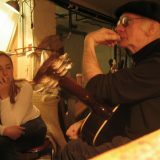 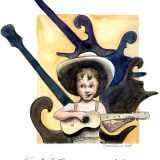 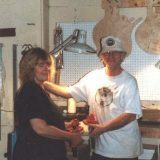 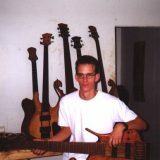 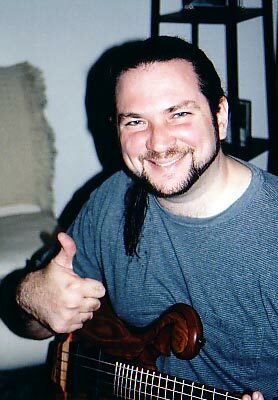 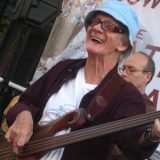 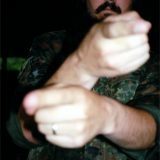 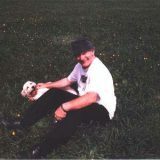 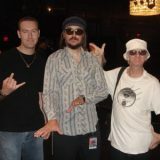 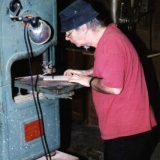 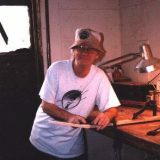 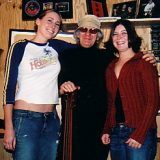 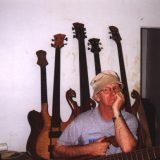 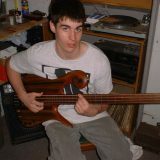 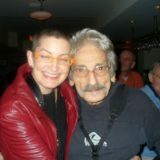 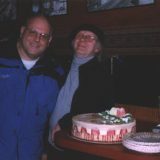 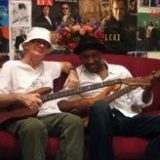 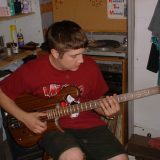 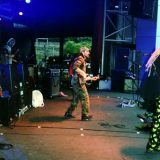 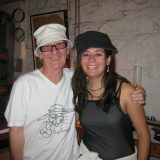 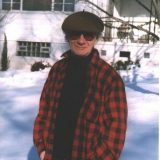 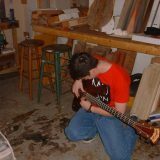 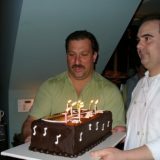 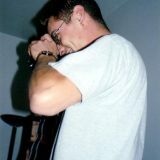 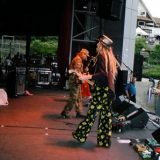 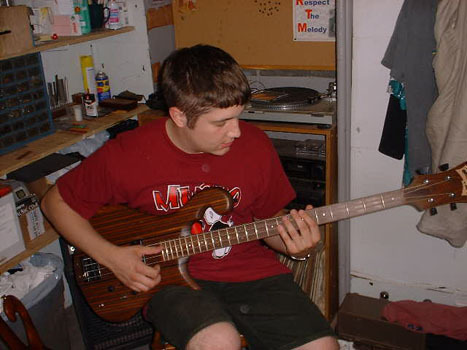 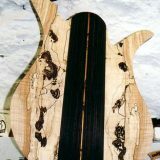 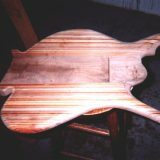 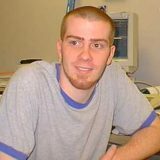 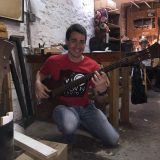 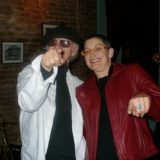 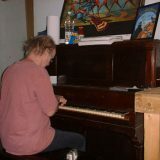 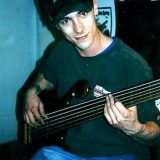 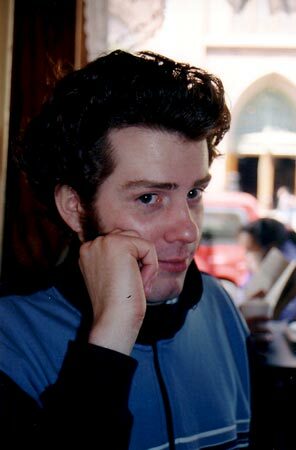 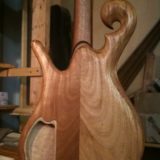 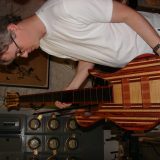 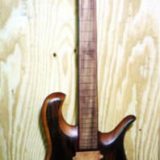 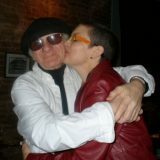 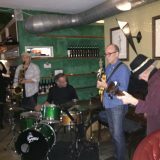 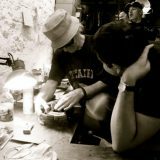 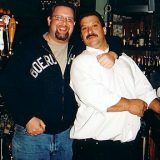 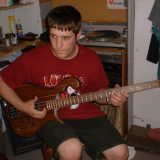 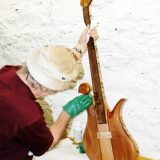 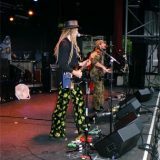 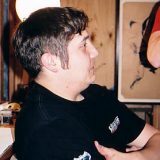 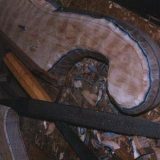 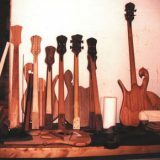 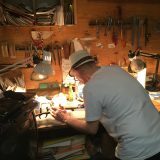 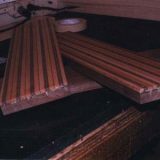 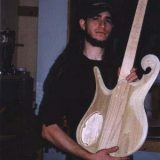 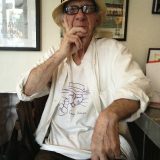 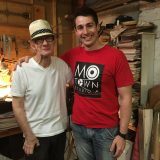 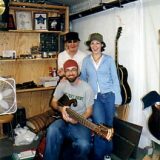 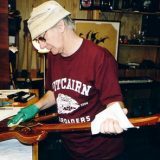 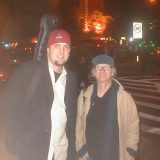 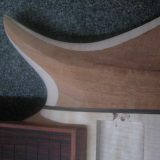 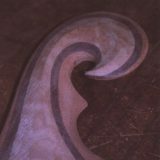 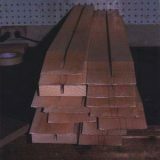 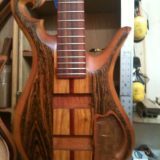 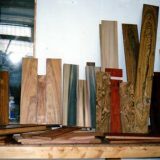 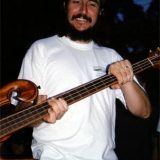 Mark is also the creator of www.danarmstrong.org which provides a wonderful history of Dan Armstrong, “The Man and his Guitars!”. 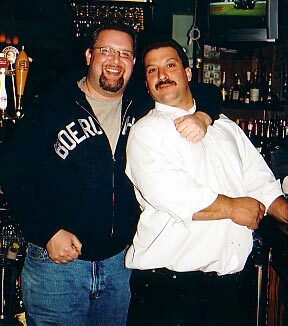 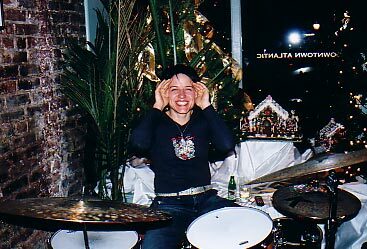 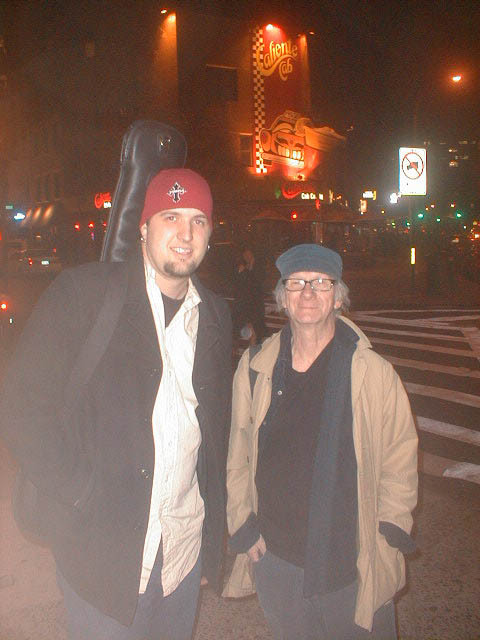 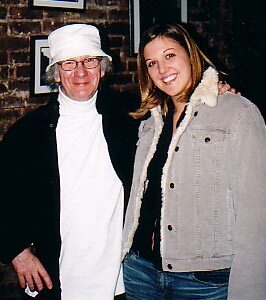 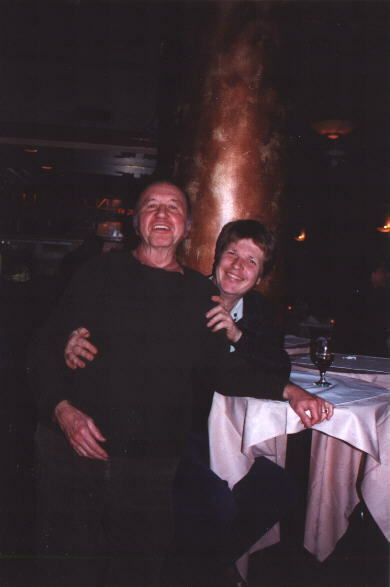 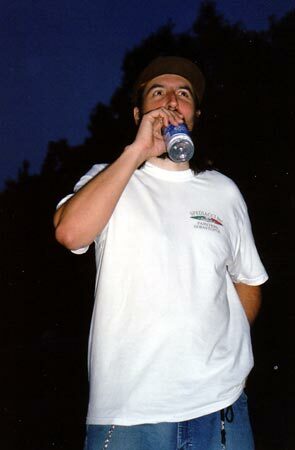 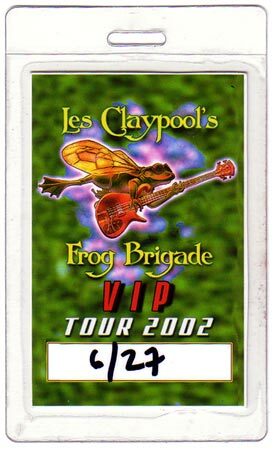 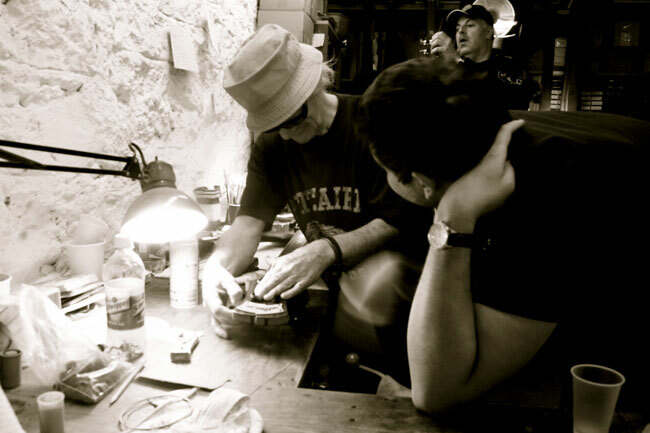 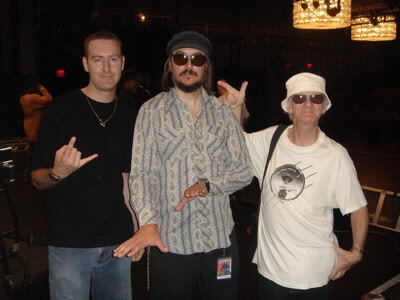 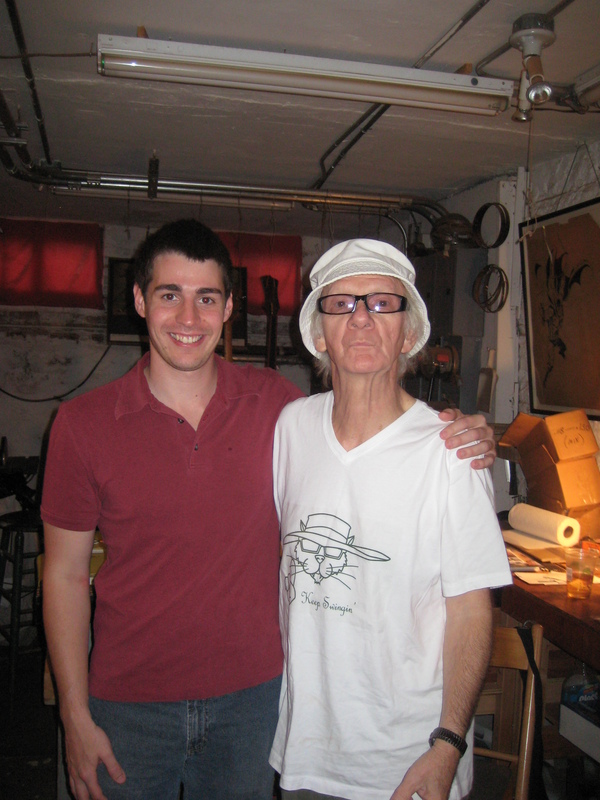 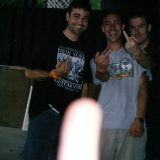 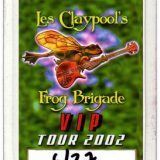 Les was in NY for a show in June of 2002, so Carl and a few friends headed down to hang out. 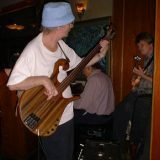 Along for the day were Carl’s good friend Marsha (and her friend Mike), Dave Muntner, Mike Brown and Jeff Frohman. 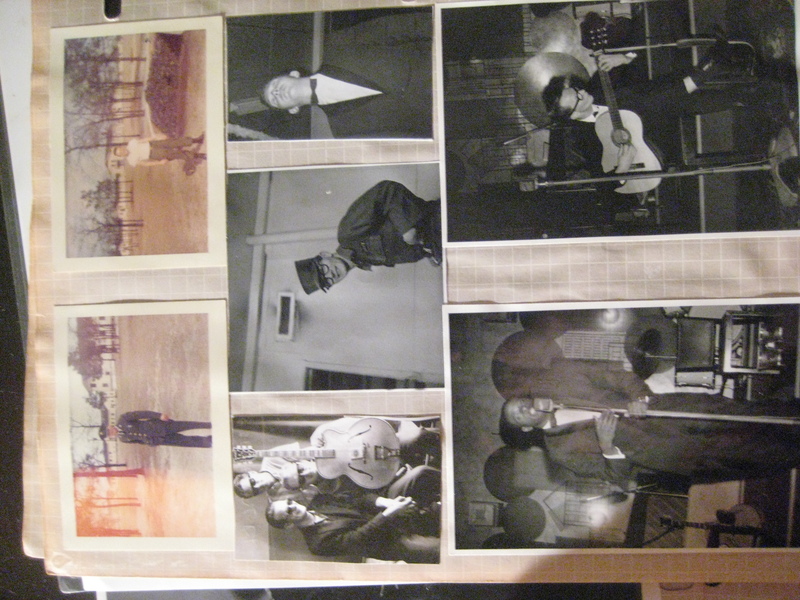 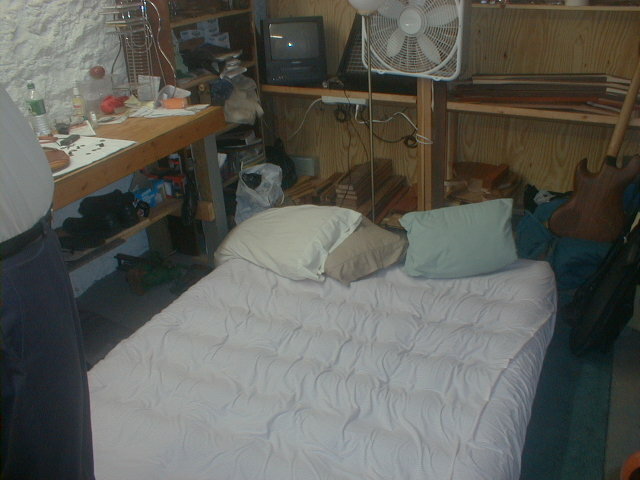 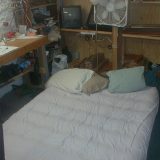 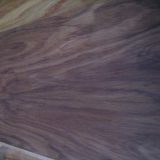 Here are some pictures Carl sent that were taken during the day. 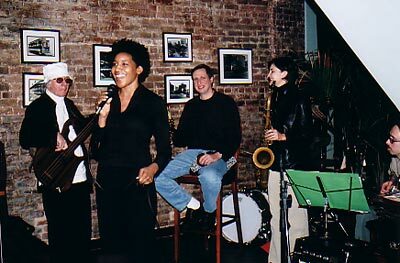 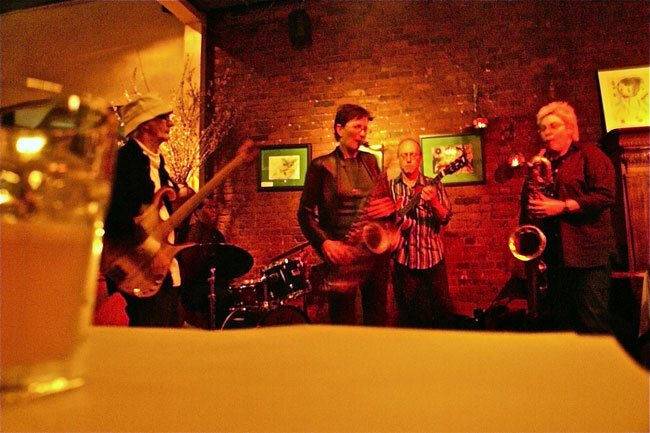 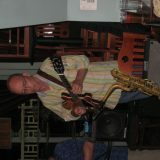 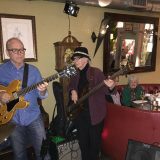 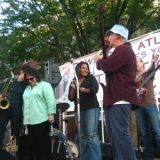 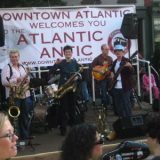 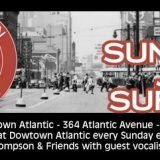 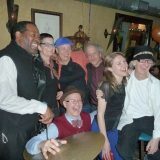 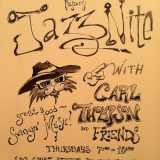 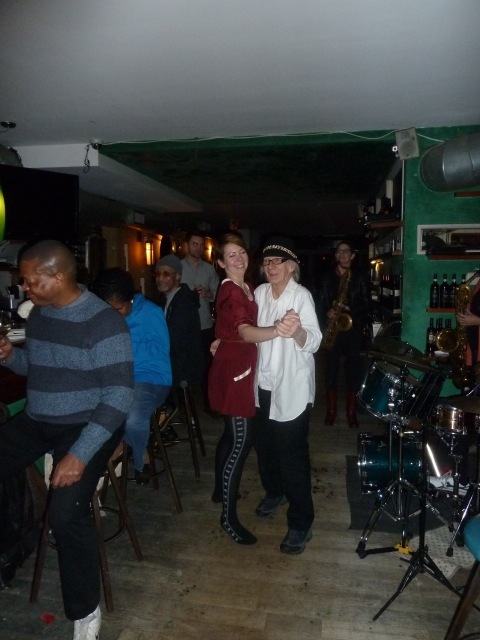 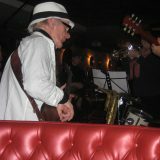 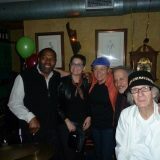 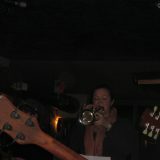 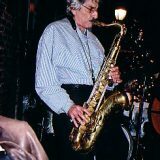 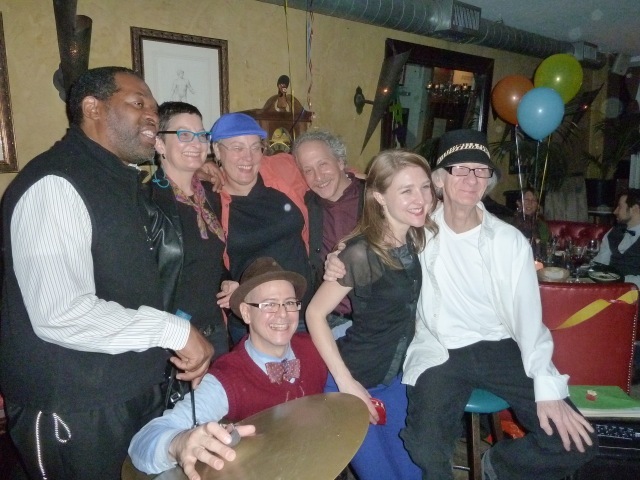 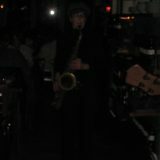 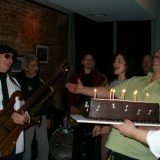 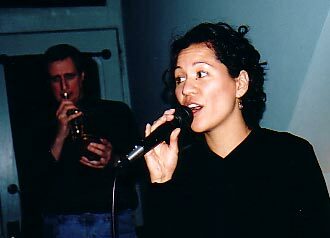 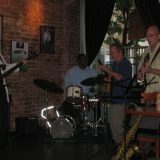 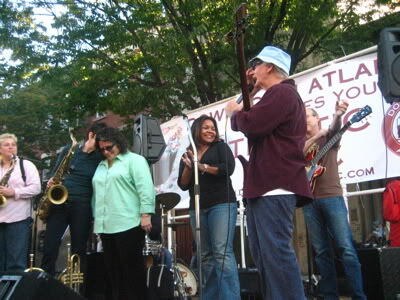 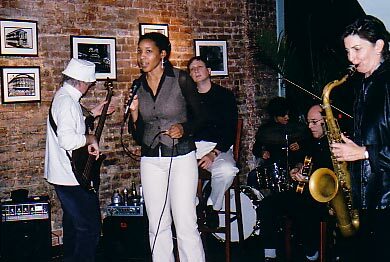 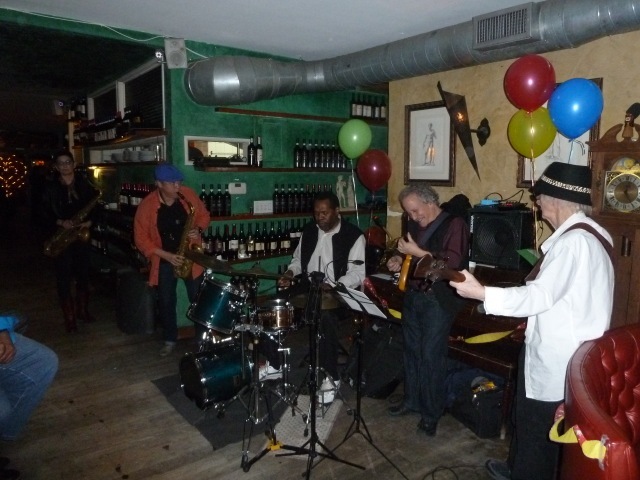 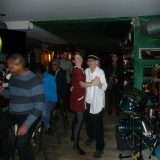 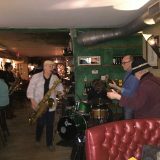 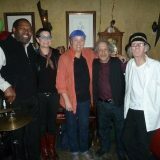 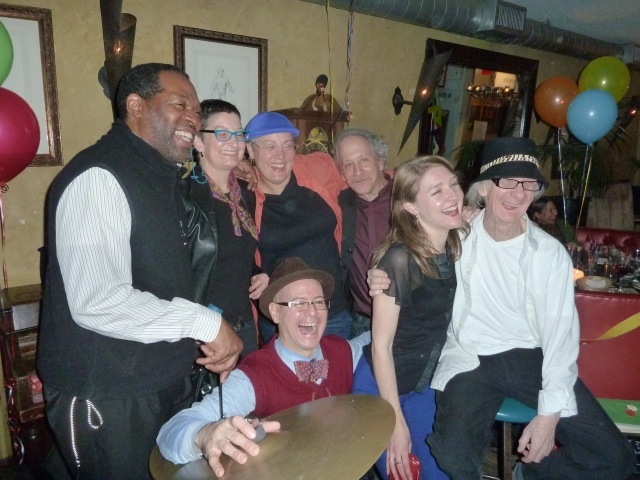 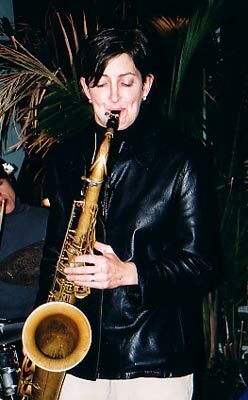 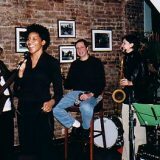 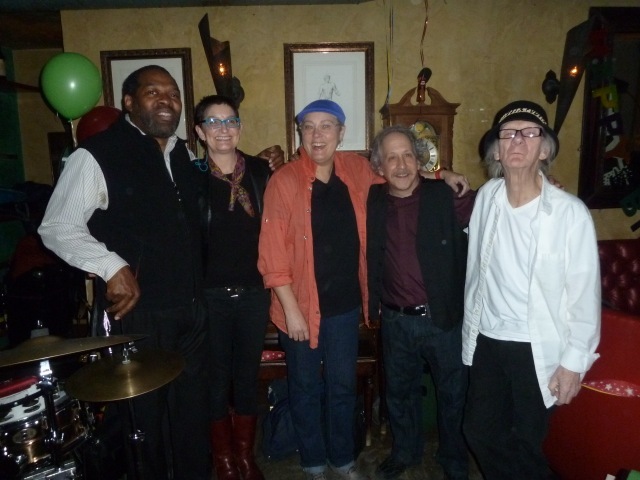 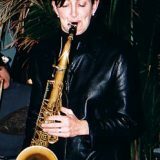 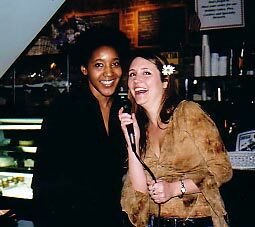 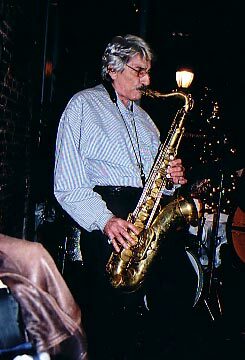 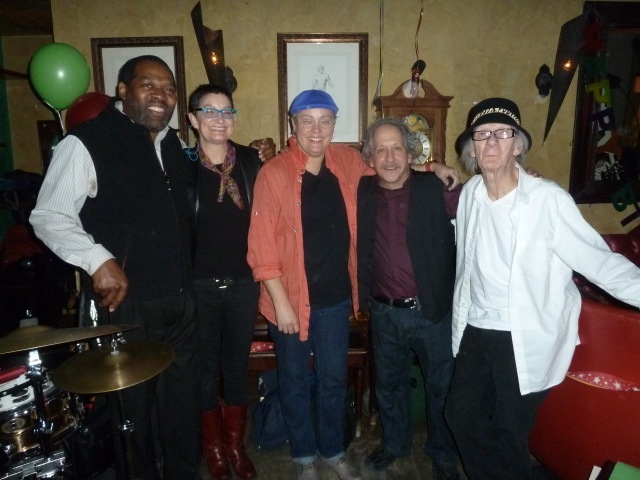 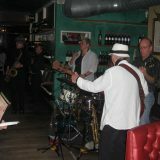 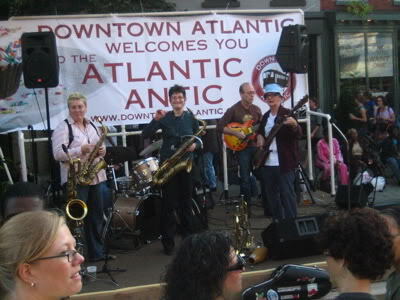 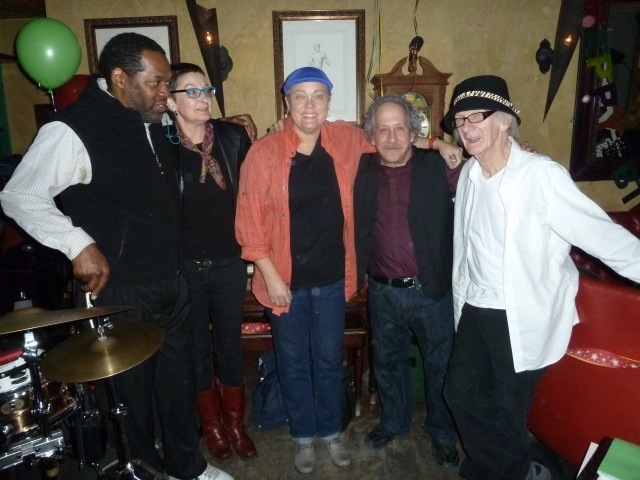 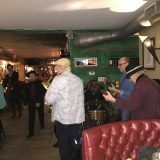 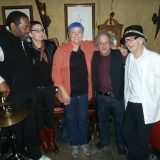 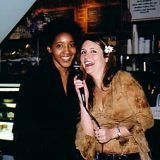 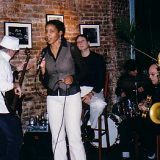 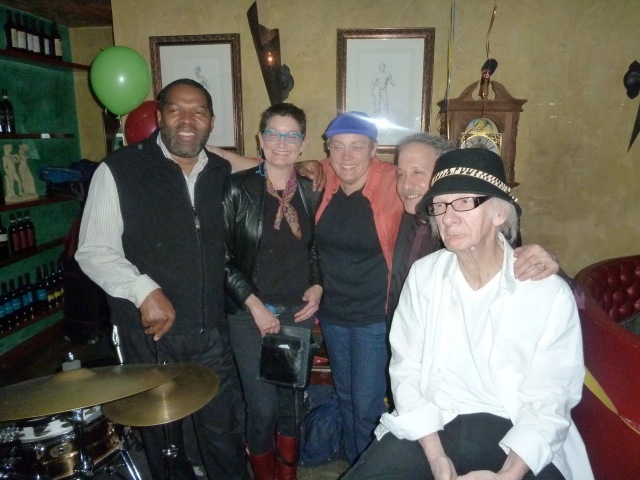 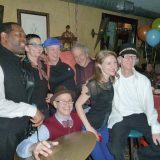 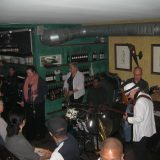 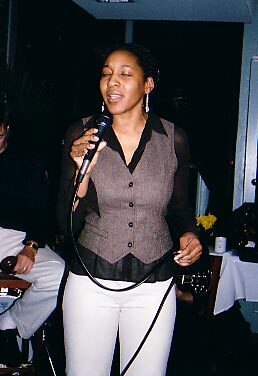 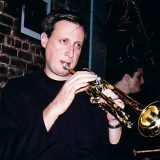 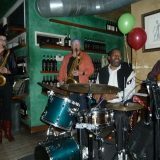 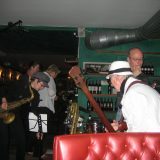 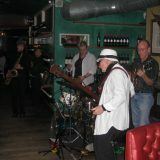 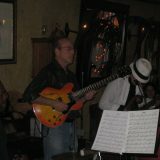 Carl playing at the Downtown Atlantic with Allison Miller, Virginia Mayhew, Akilah, Charlie Caranikos, Jamie Fox, Pam, Russell George, Deb Puku, Frank Vicari and Marta. 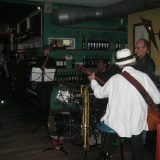 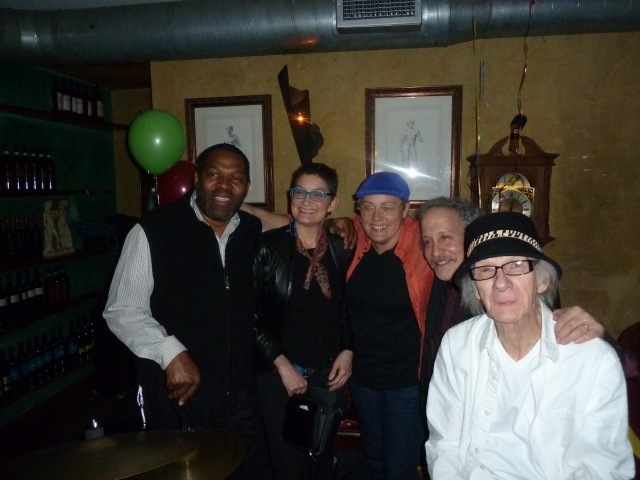 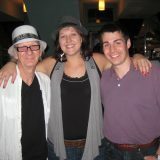 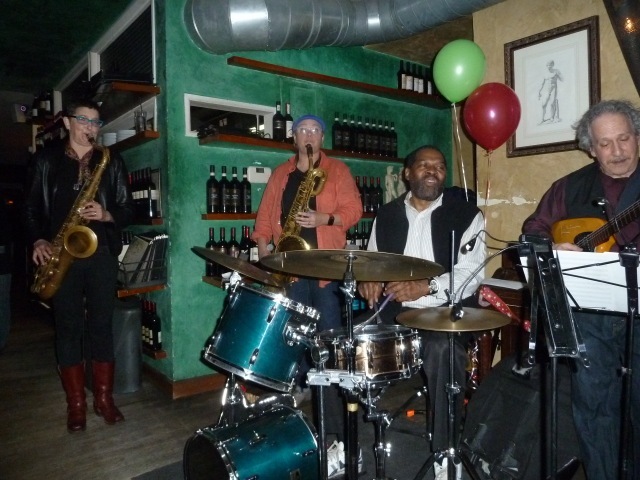 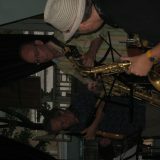 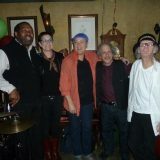 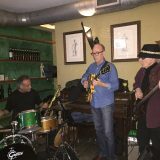 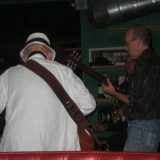 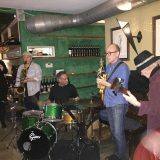 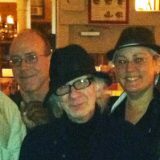 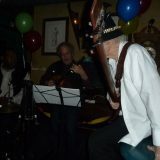 Carl gigging at Ecco Italia with a handfull of friends including Bob Dorough and Stever Berger. 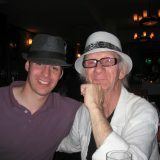 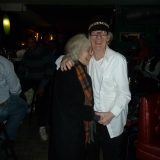 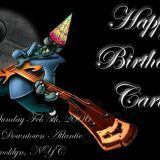 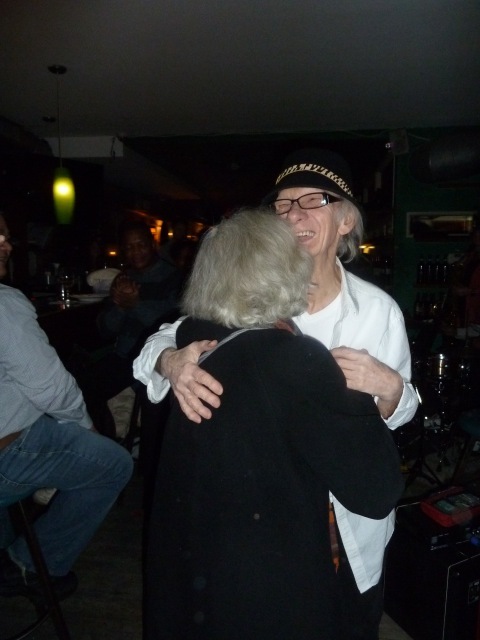 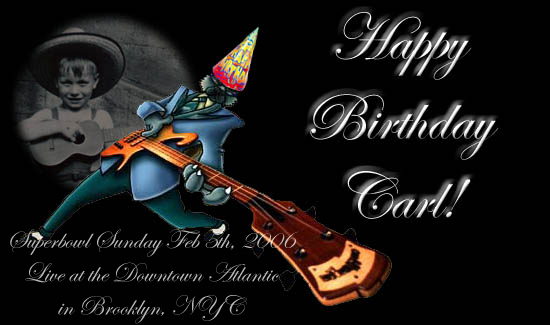 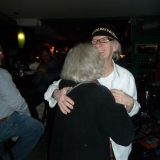 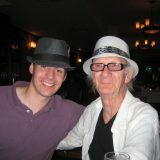 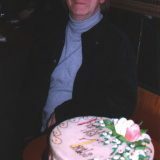 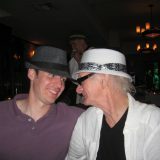 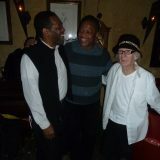 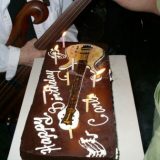 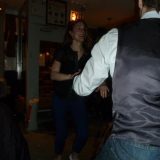 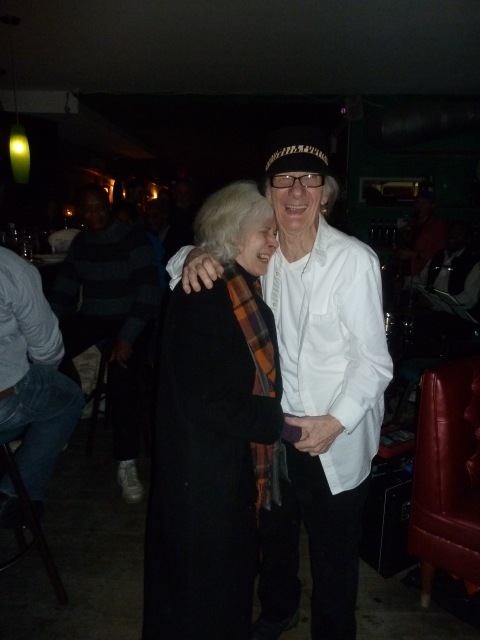 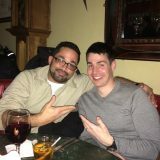 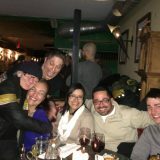 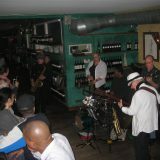 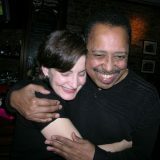 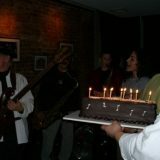 Pictures from Carl’s Birthday at the Downtown Atlantic in Brooklyn. 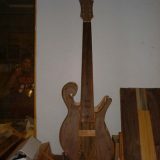 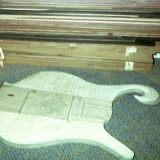 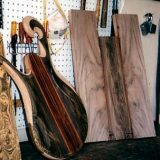 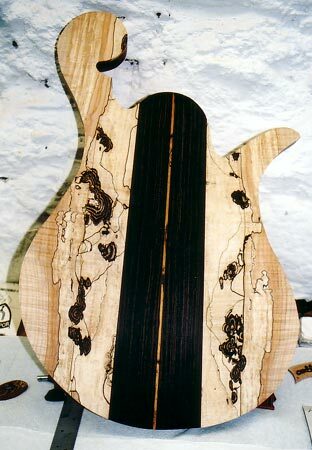 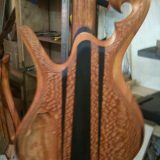 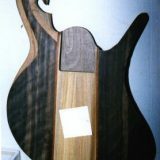 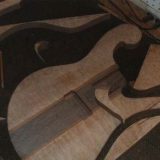 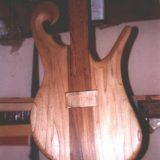 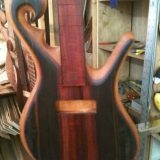 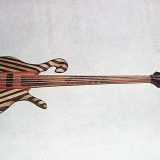 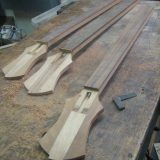 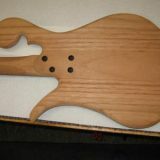 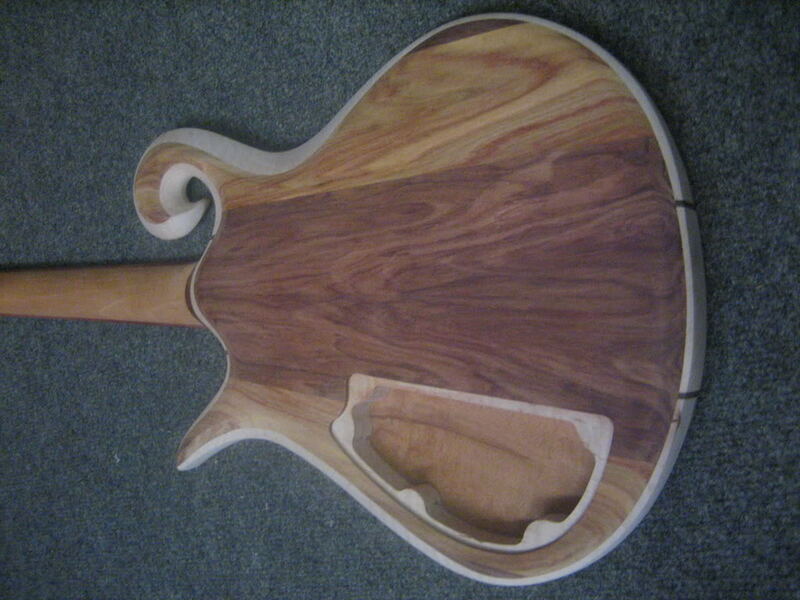 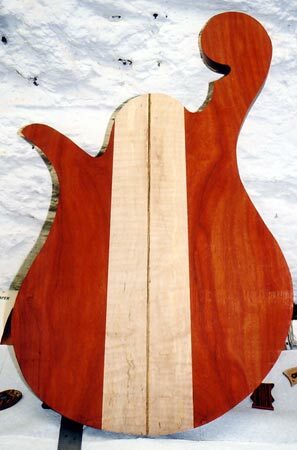 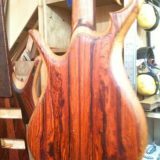 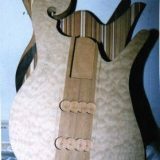 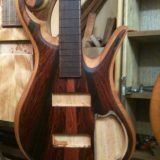 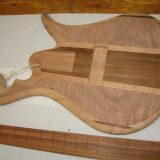 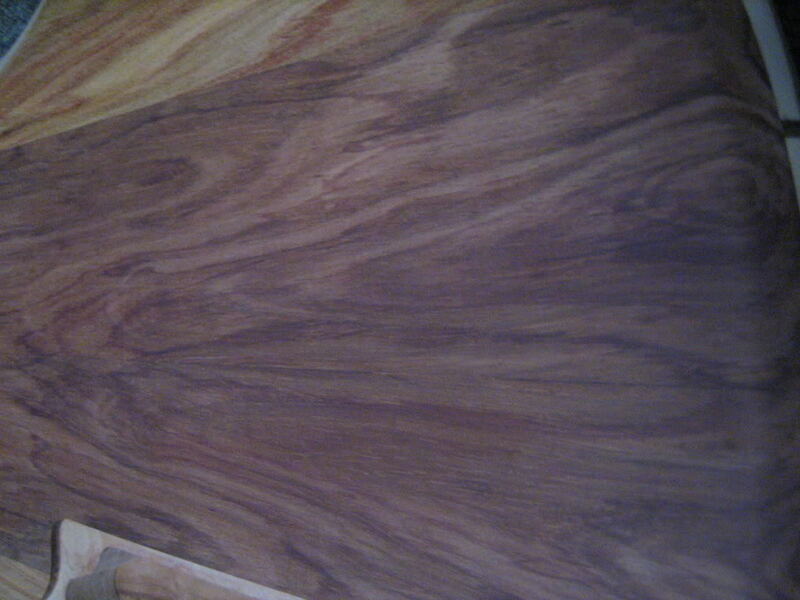 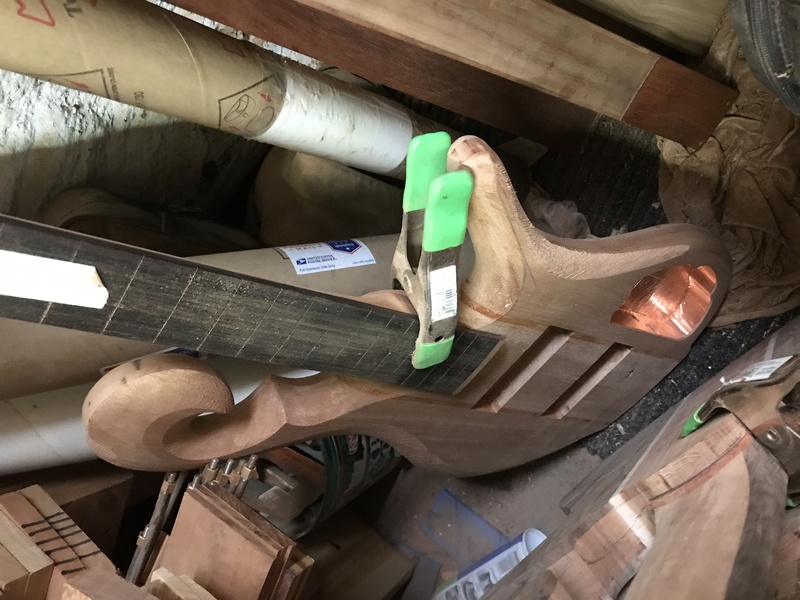 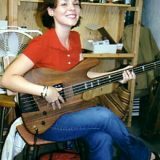 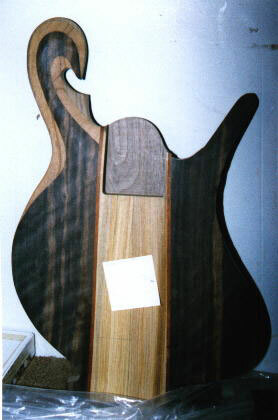 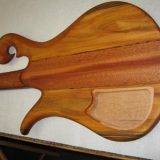 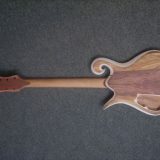 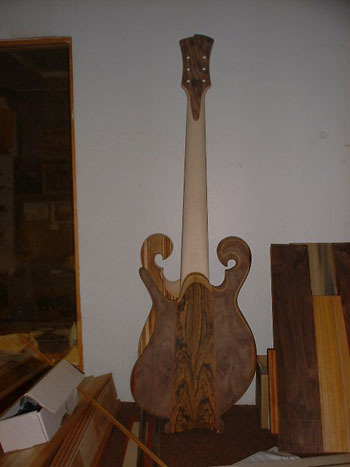 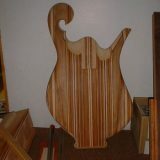 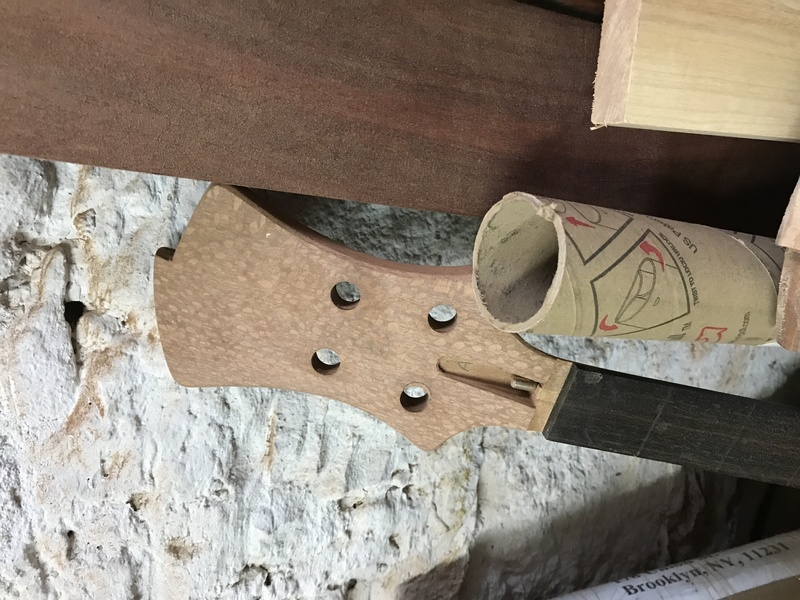 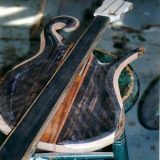 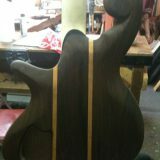 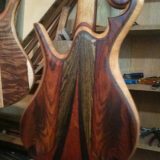 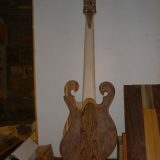 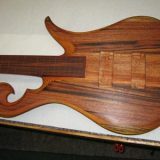 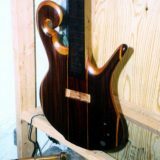 Spy photos of Casey’s bass taken during a brief layover and shop visit in 2017. 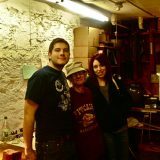 Aaron, Anthony and Gabe clowning around with Carl during a quick visit in 2015. 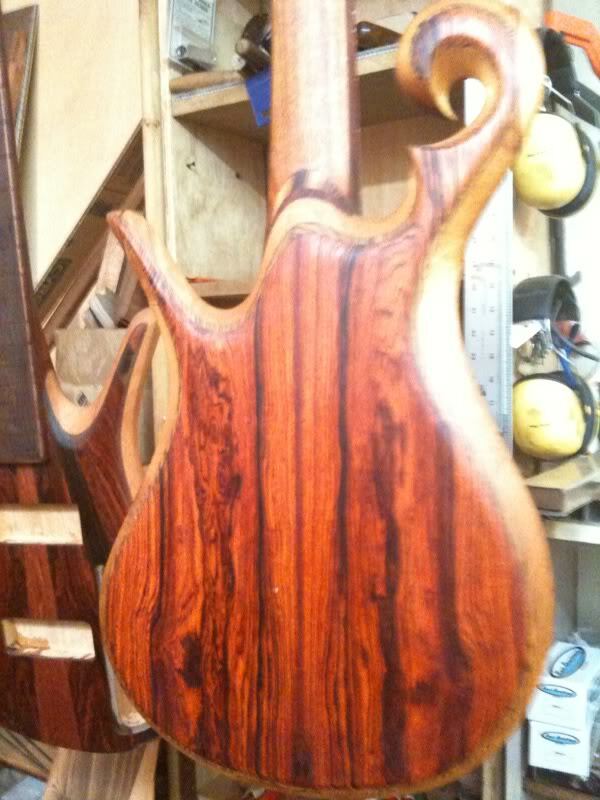 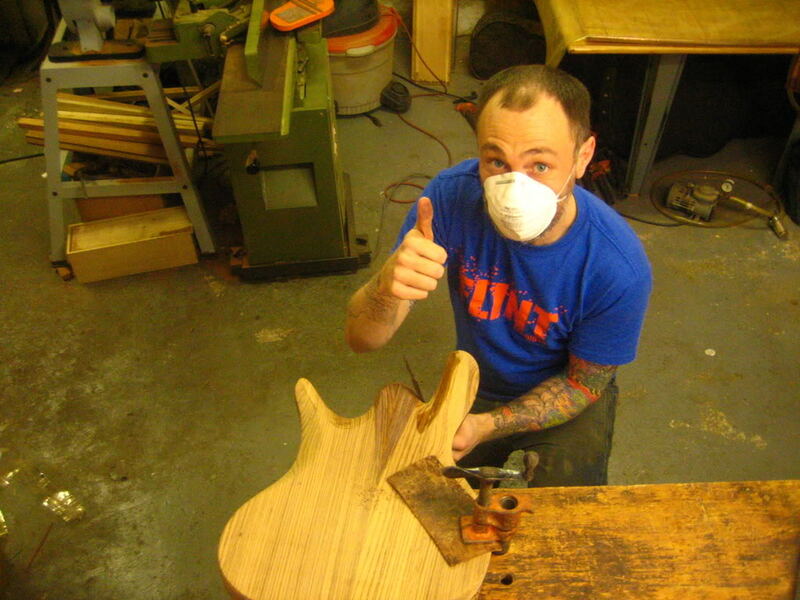 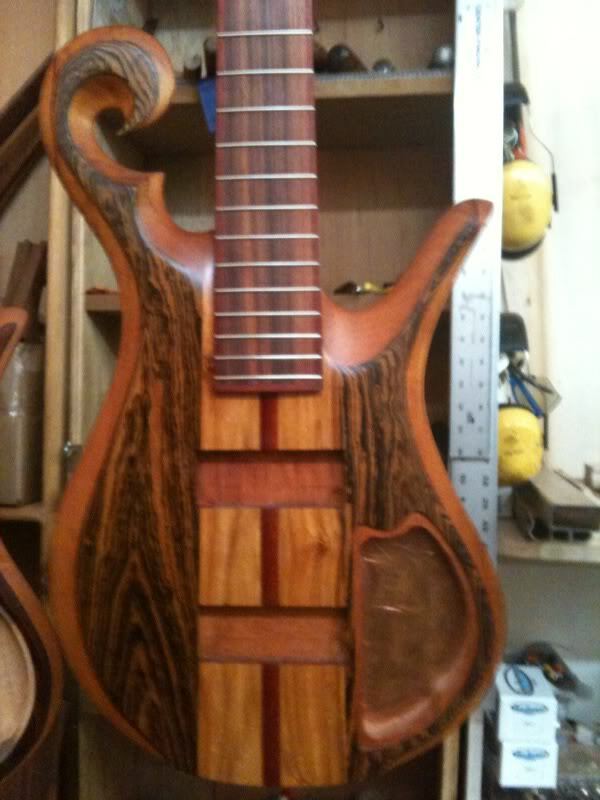 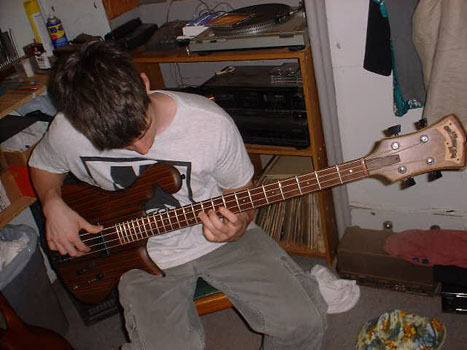 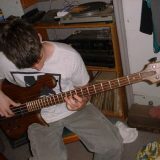 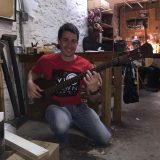 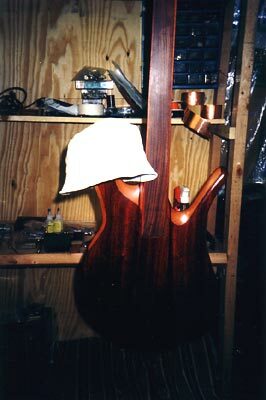 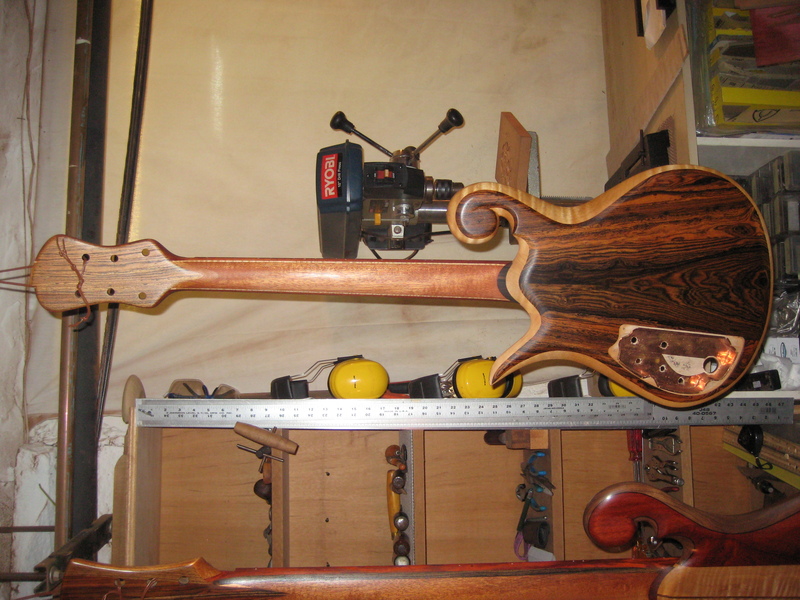 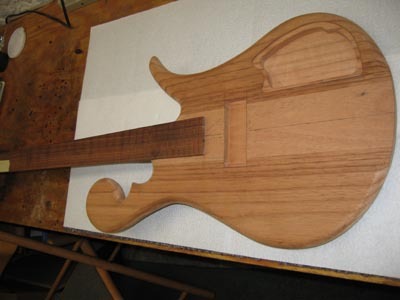 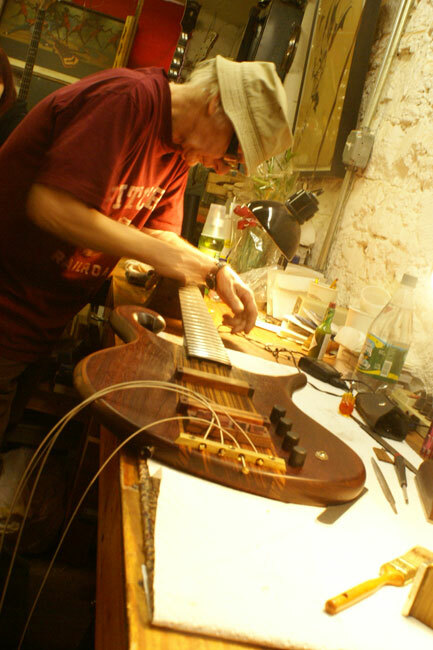 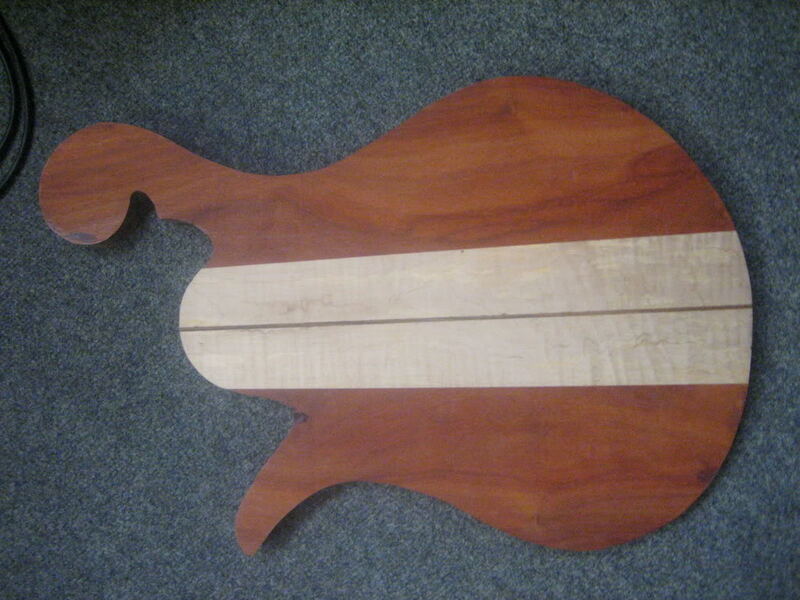 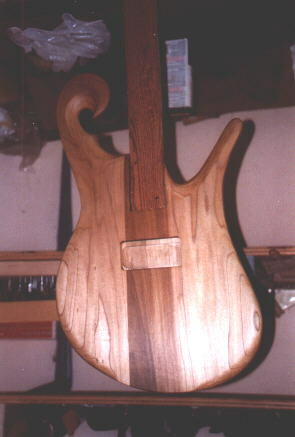 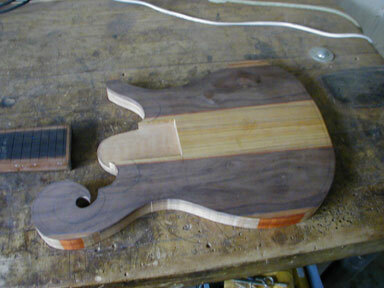 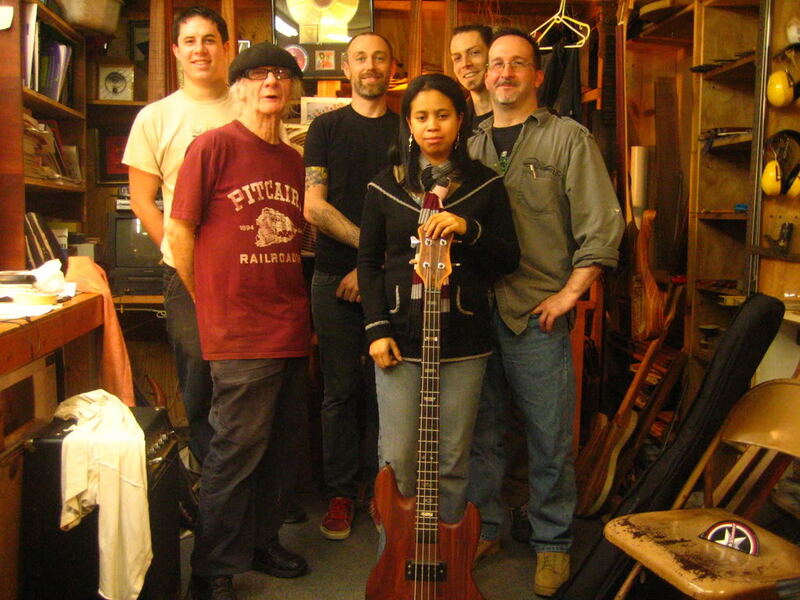 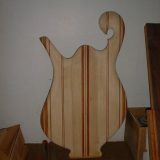 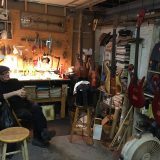 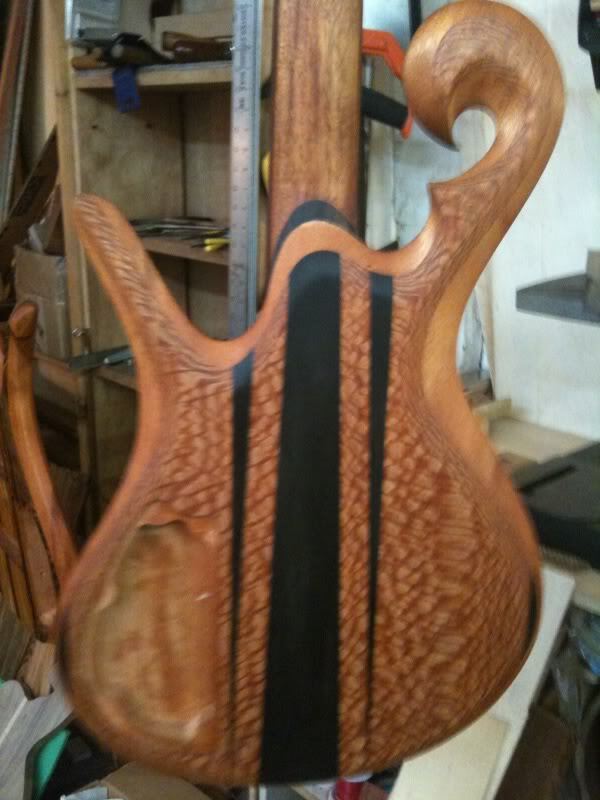 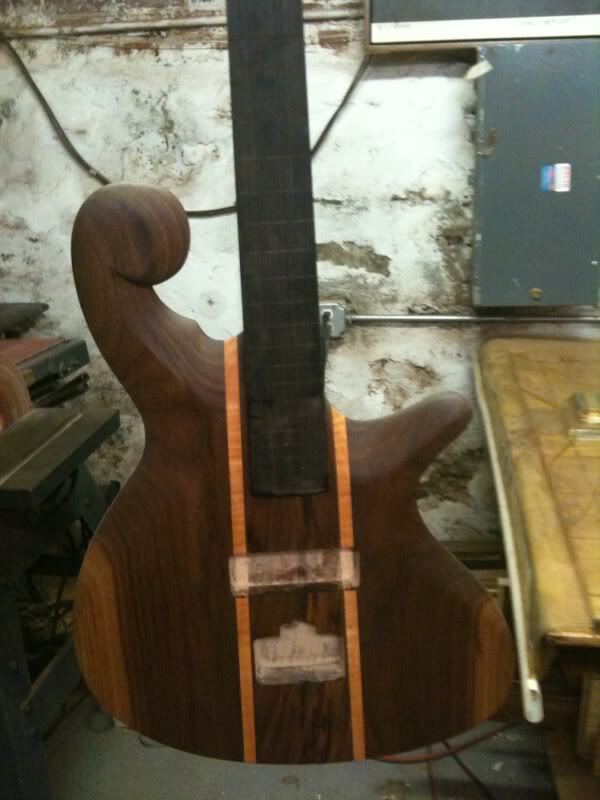 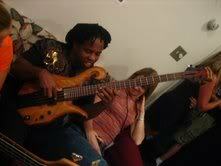 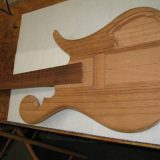 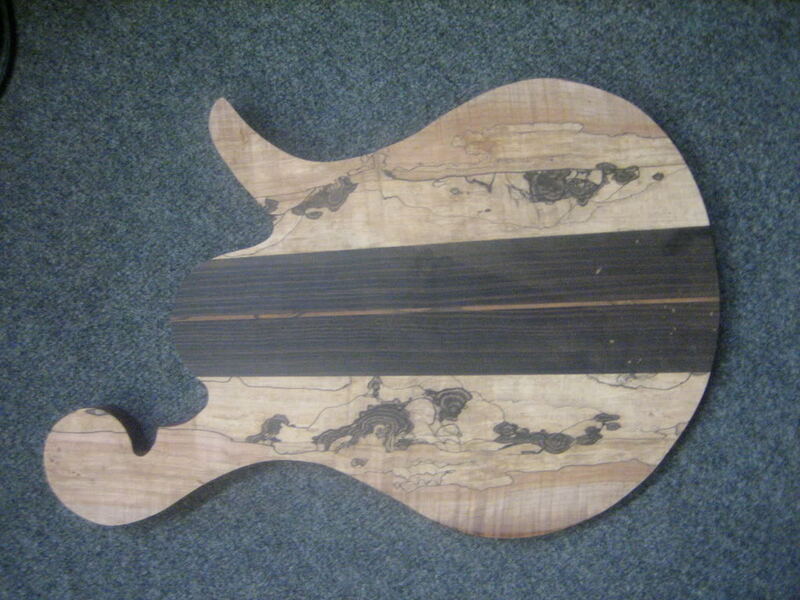 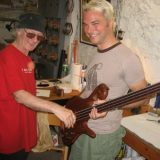 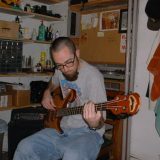 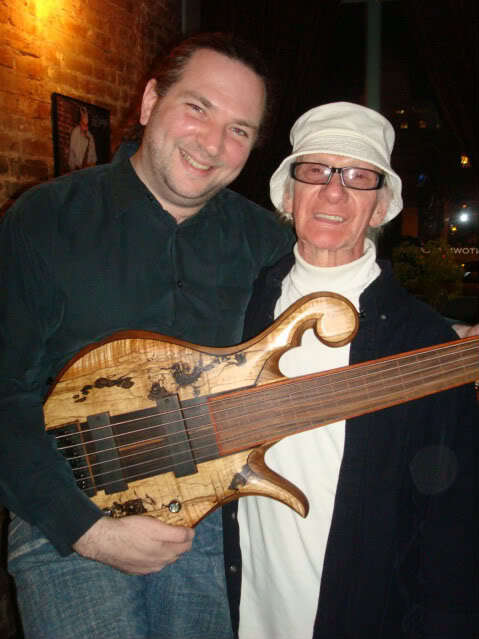 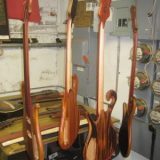 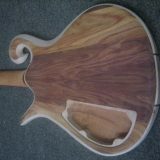 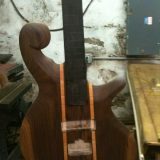 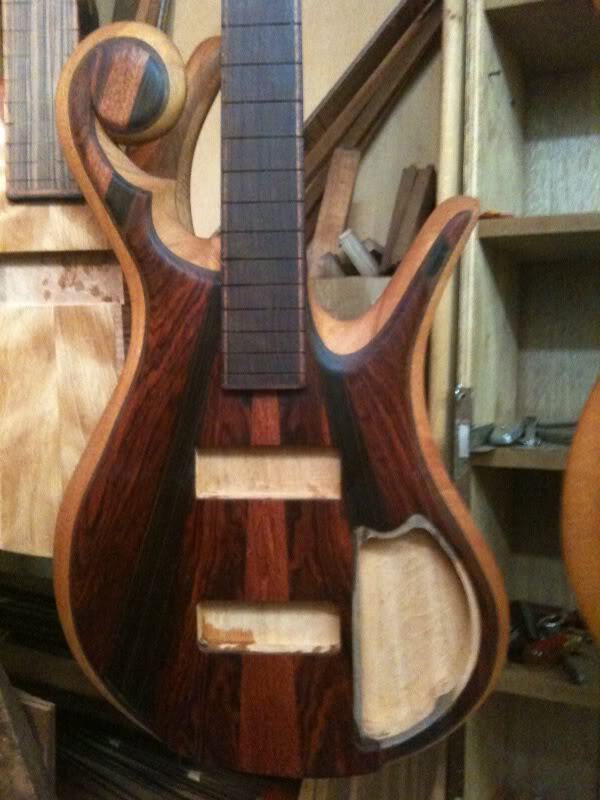 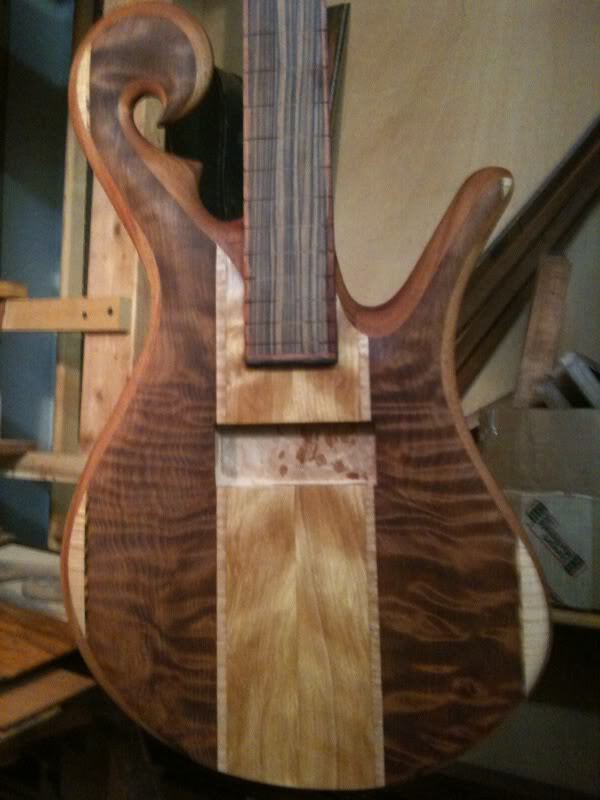 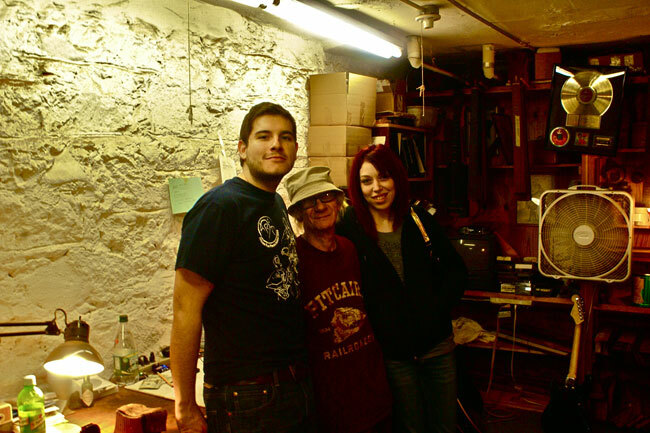 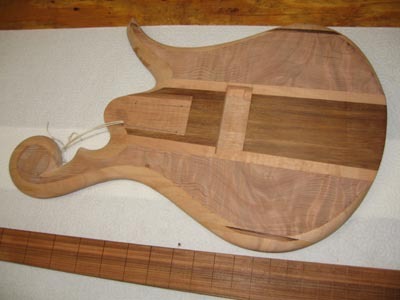 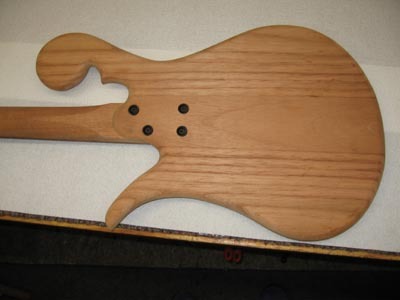 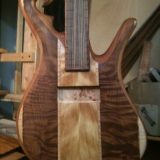 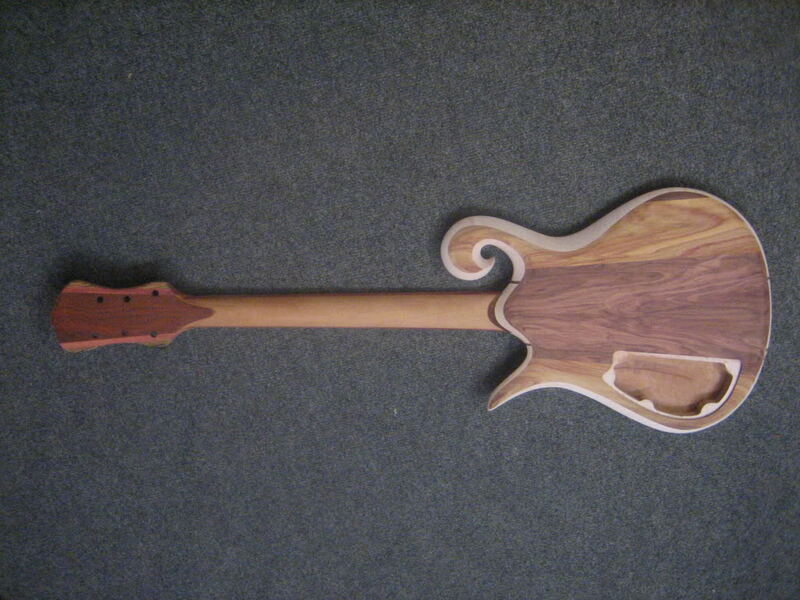 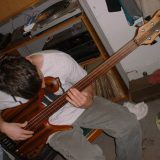 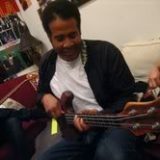 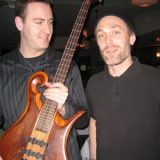 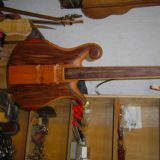 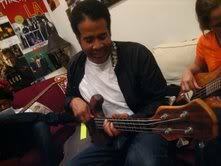 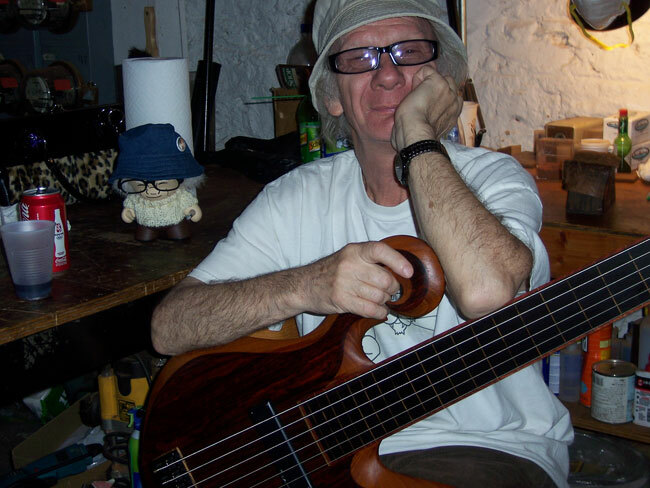 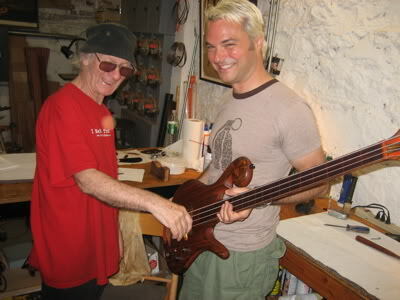 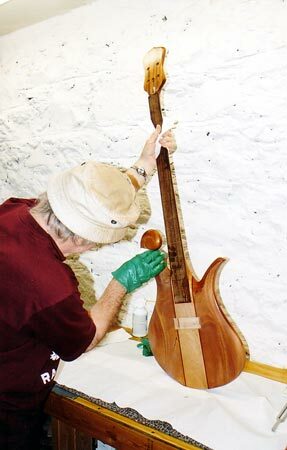 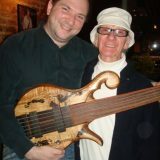 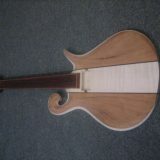 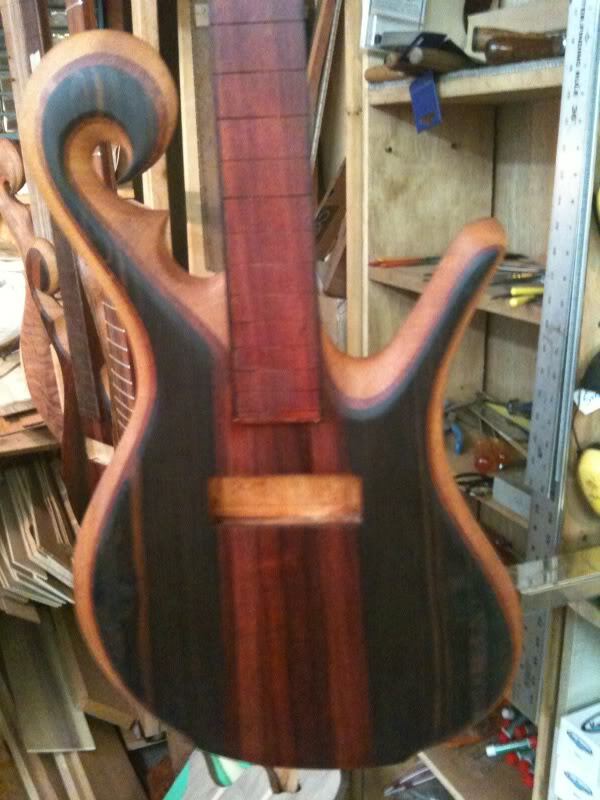 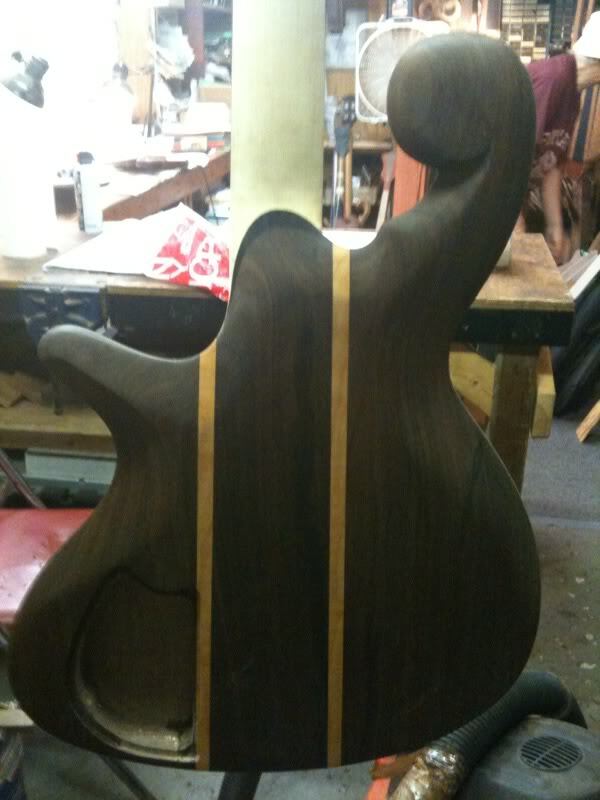 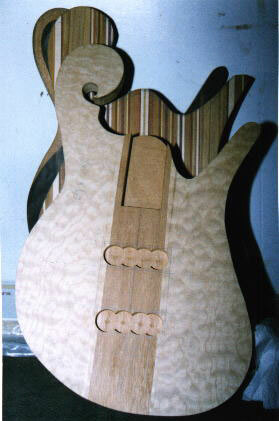 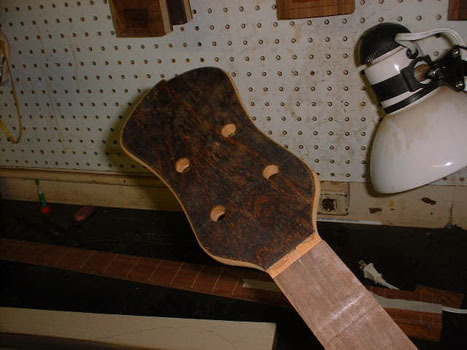 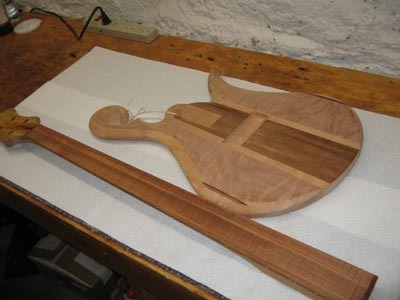 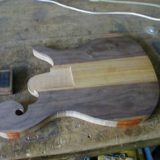 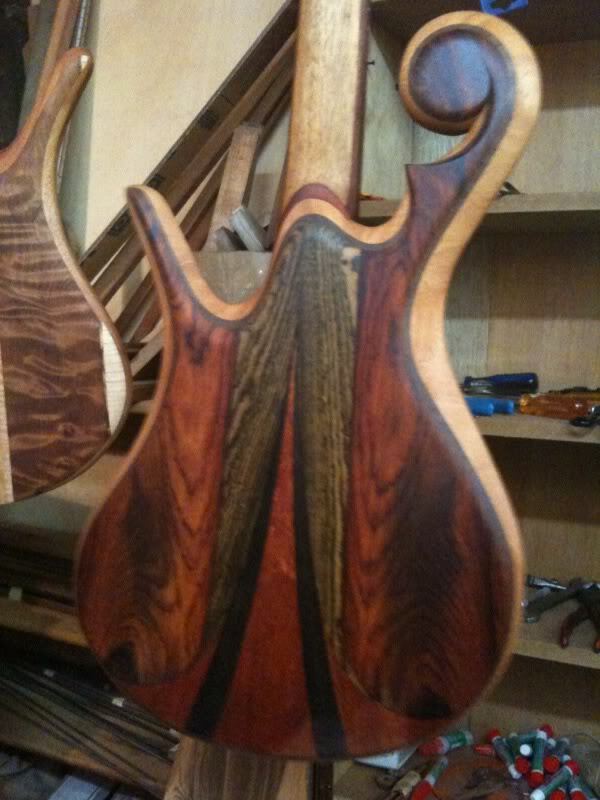 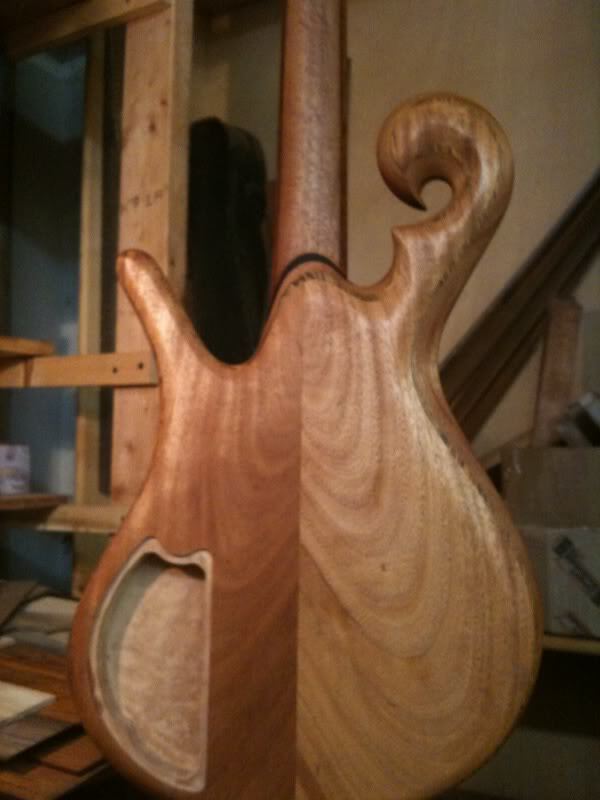 Carlos took a trip to Brooklyn to have Carl work on his bass and sent in some pics. 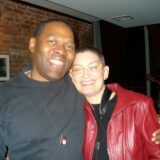 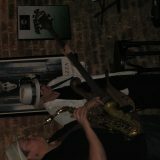 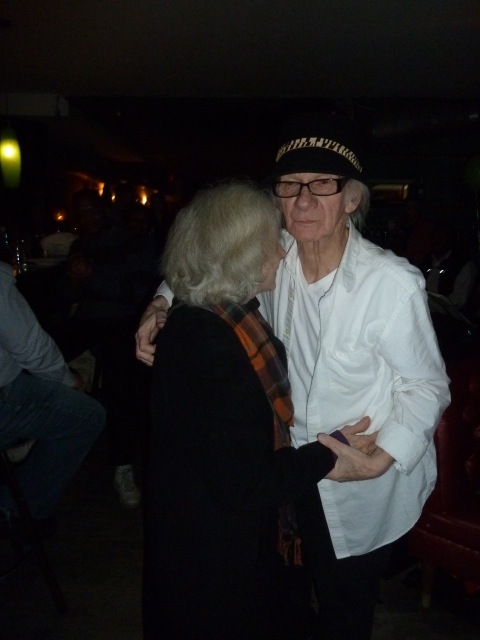 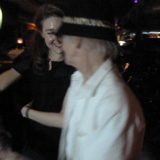 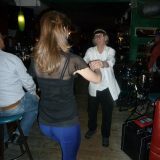 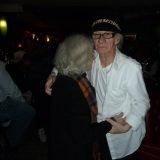 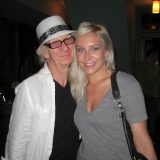 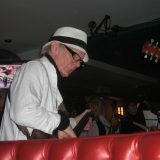 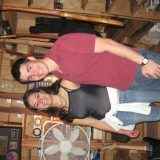 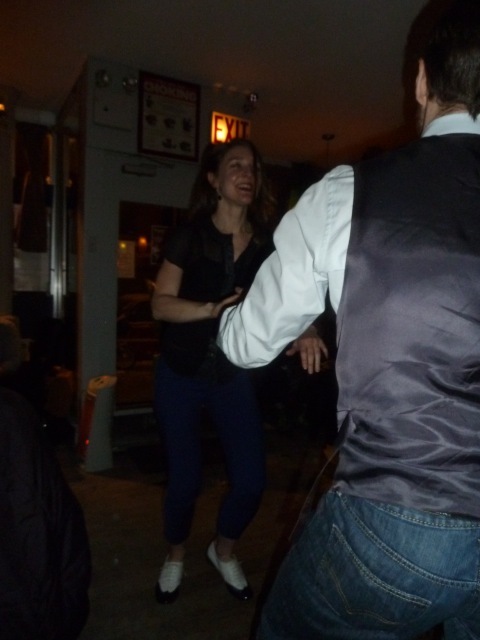 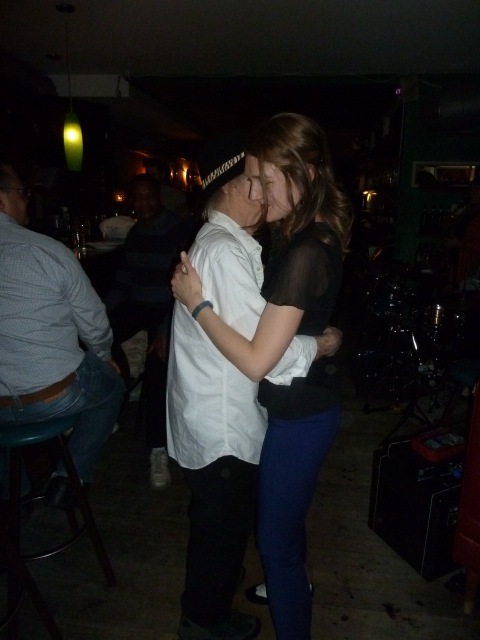 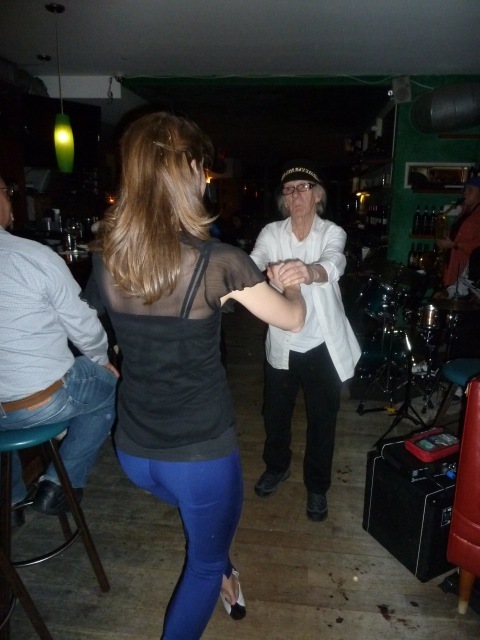 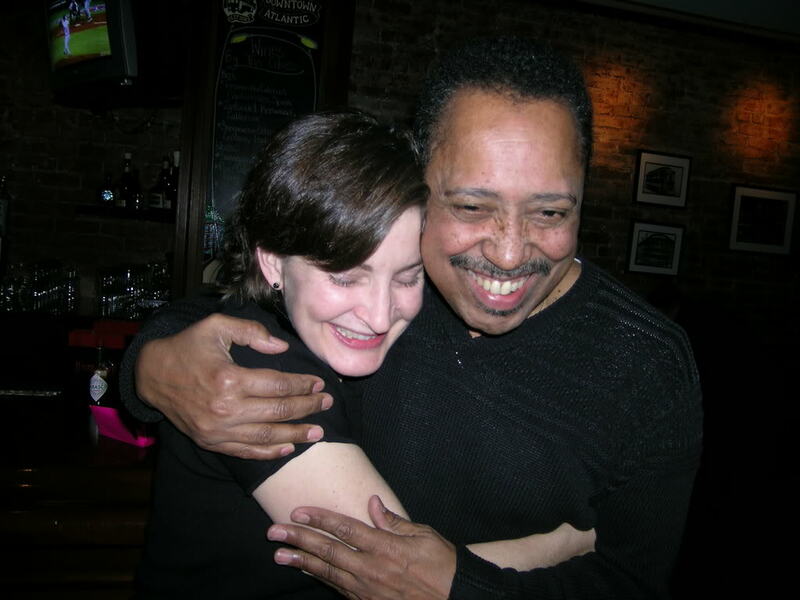 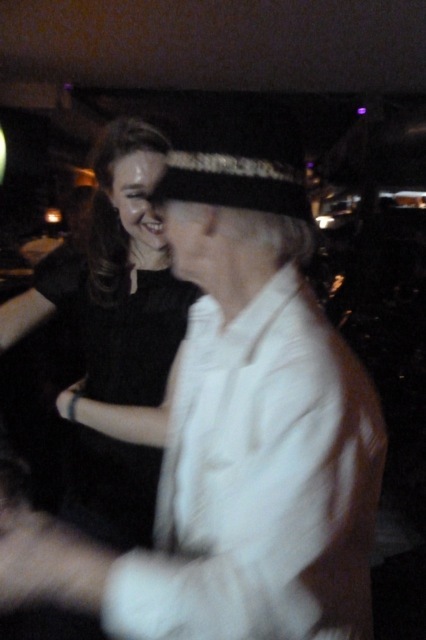 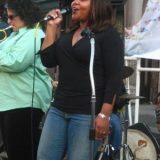 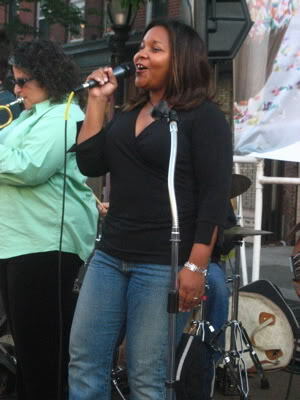 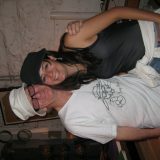 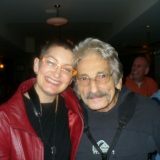 He also got a chance to see Carl in action at a gig in Manhattan and Carl got a chance to charm Samantha. 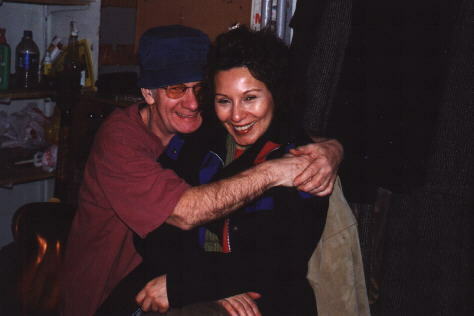 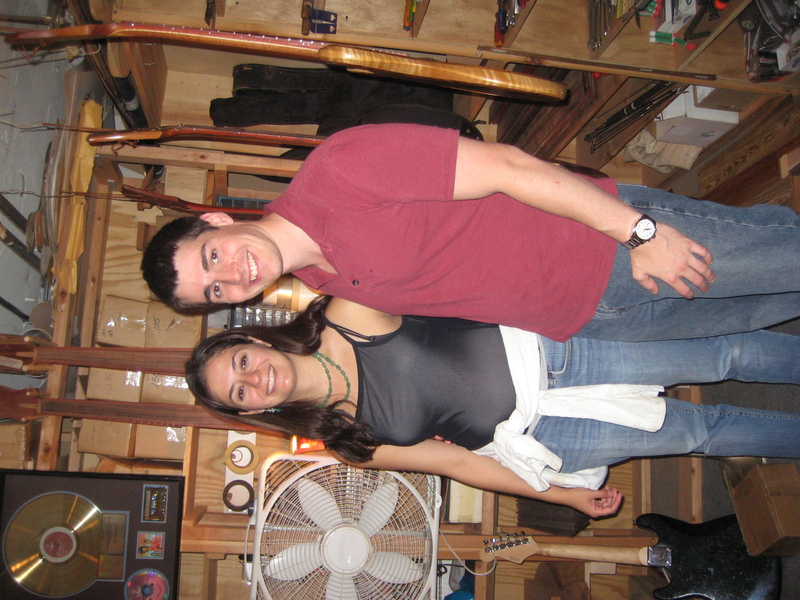 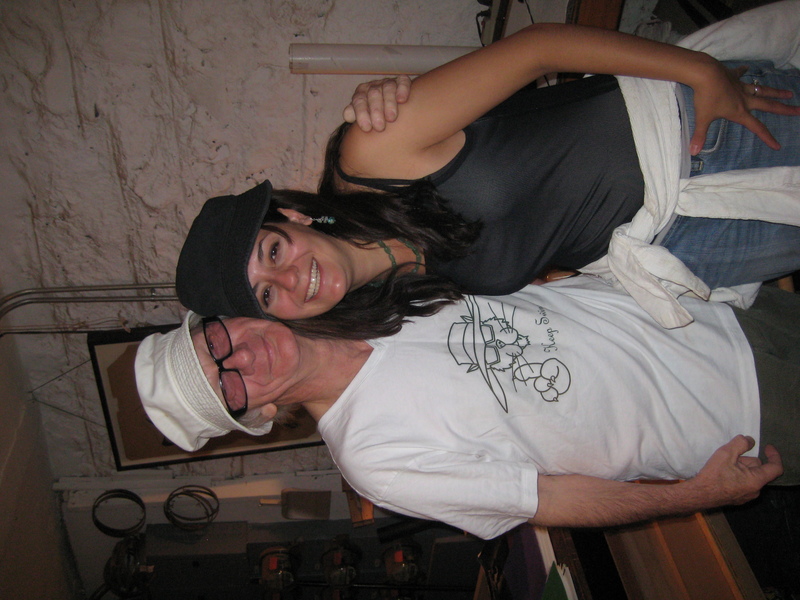 Aaron and his wife Anjali visiting Carl in 2008. 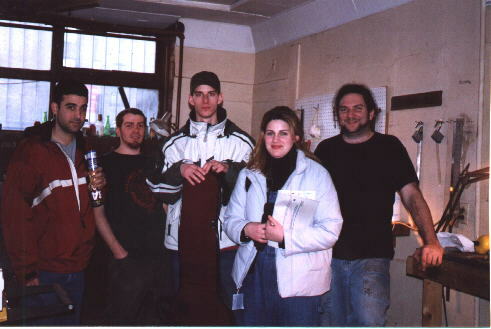 Pictured: Aaron, Anthony, Jill, Leah, John, Kelvin, Pete, Chelsey, Josh and Akila. 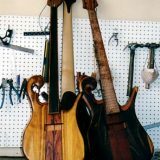 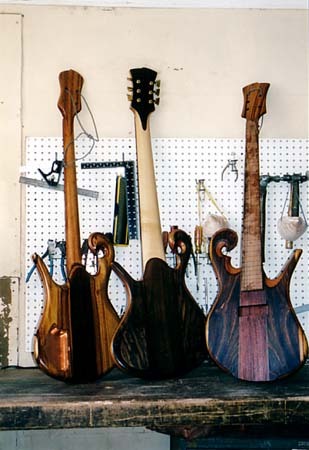 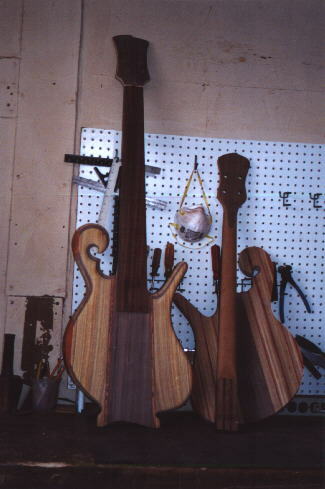 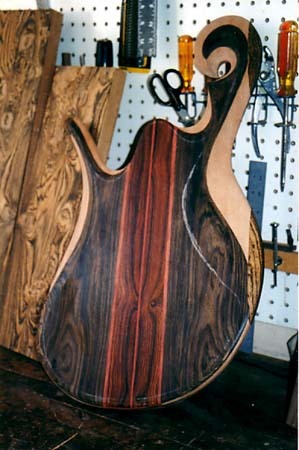 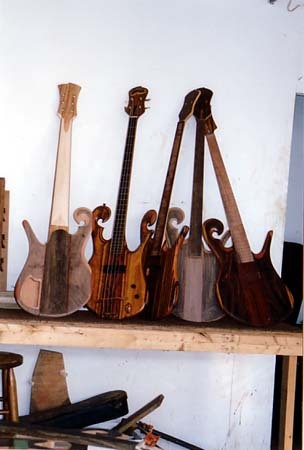 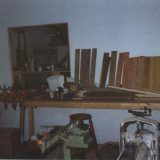 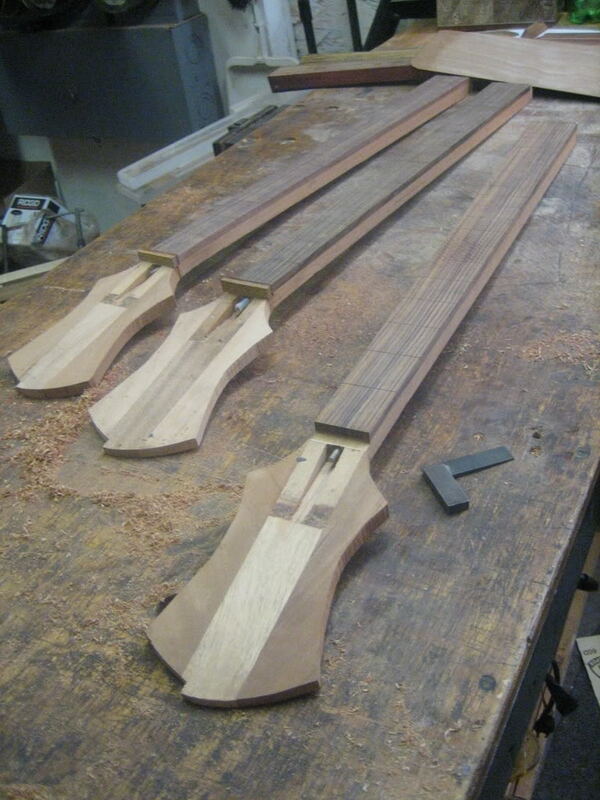 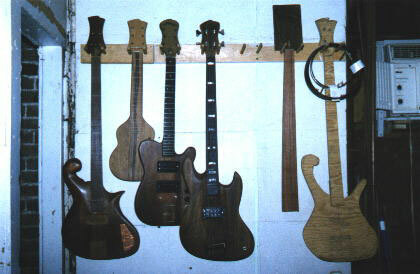 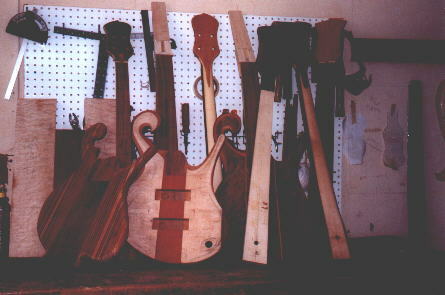 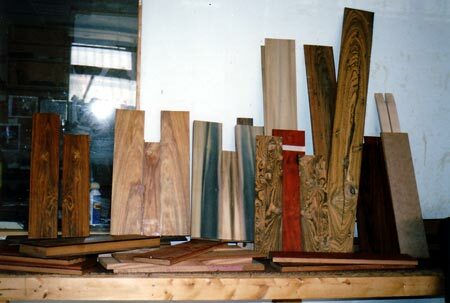 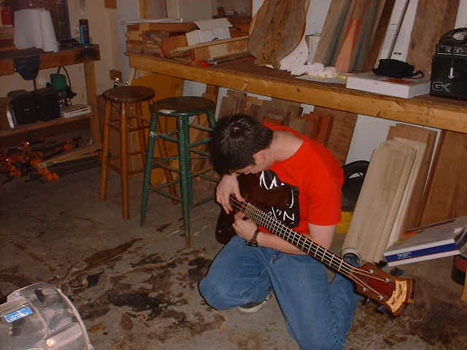 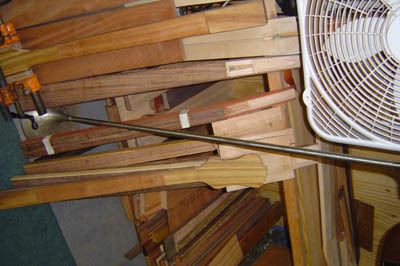 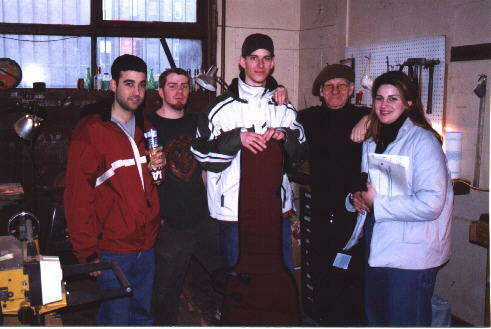 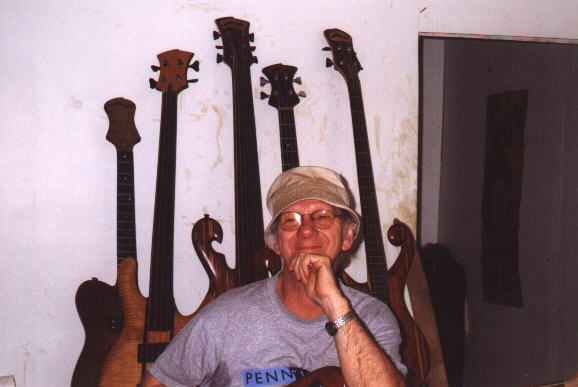 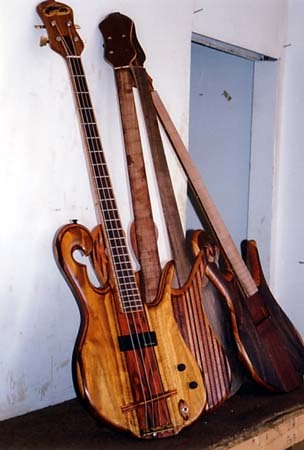 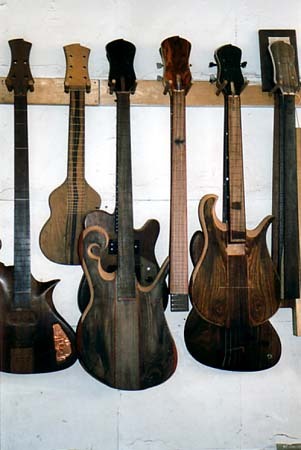 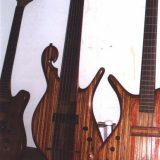 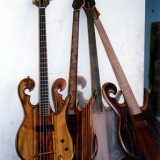 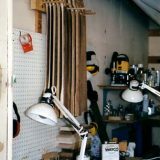 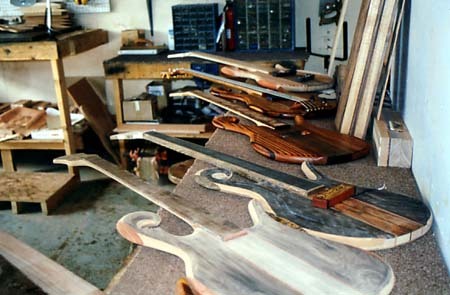 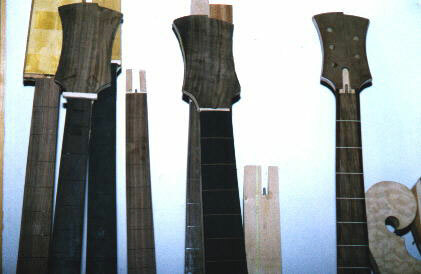 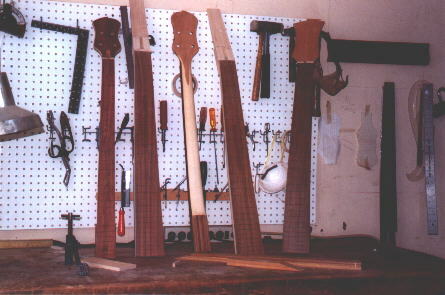 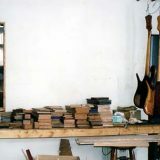 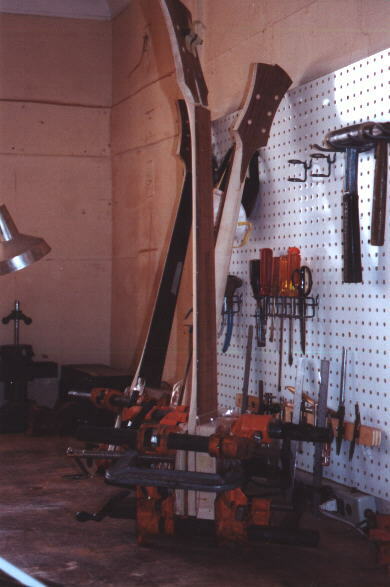 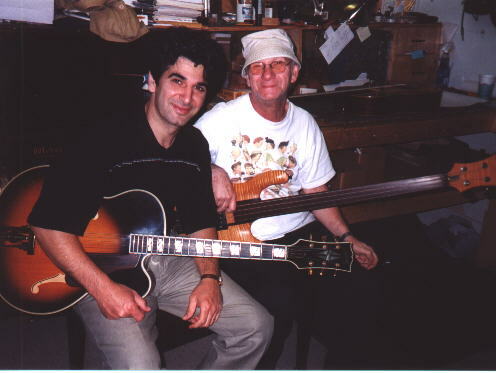 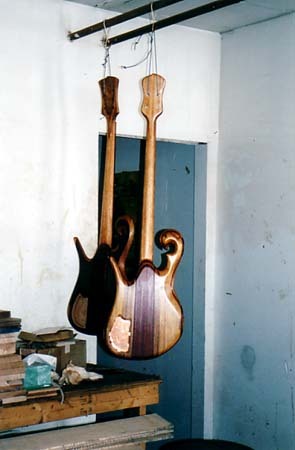 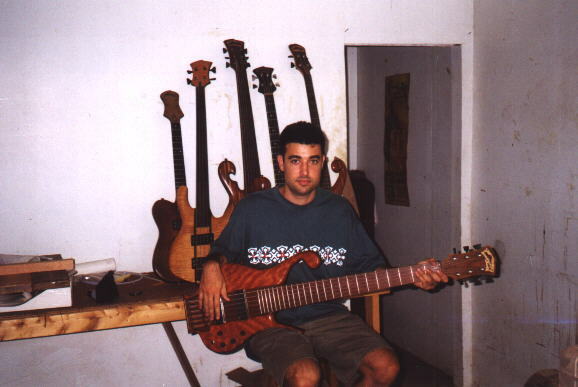 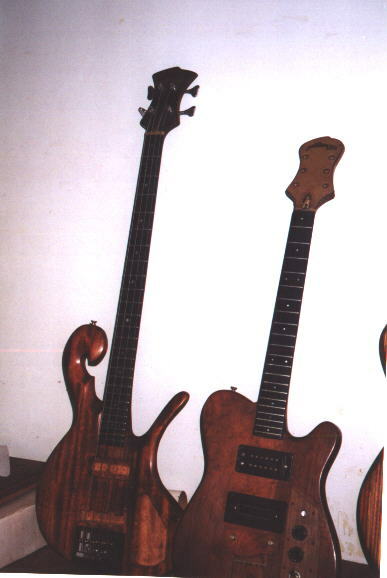 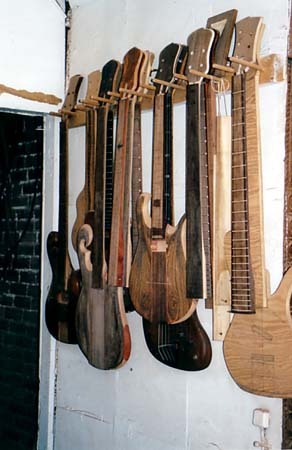 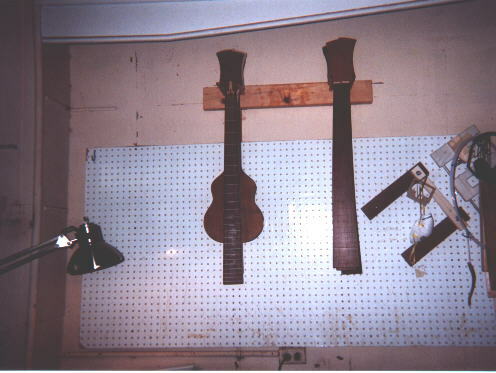 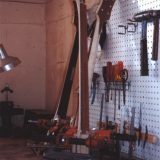 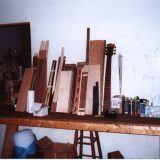 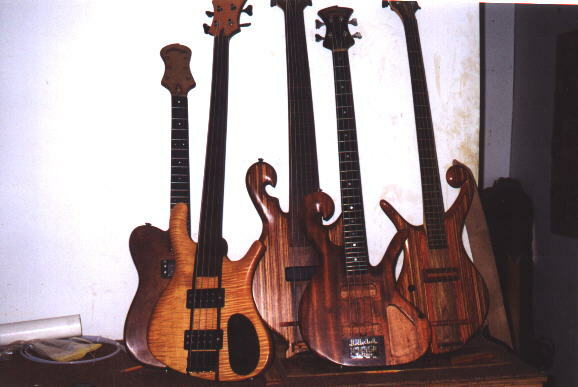 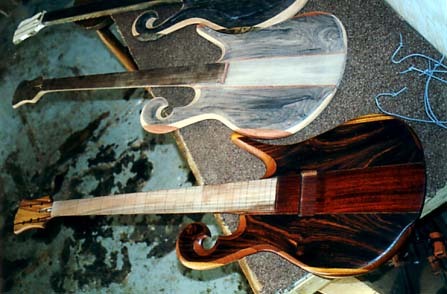 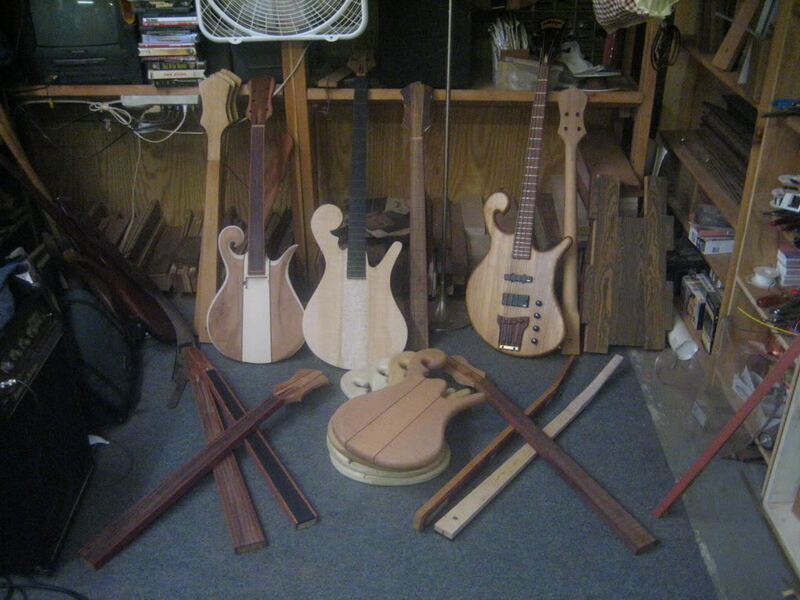 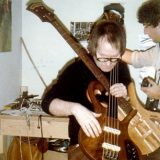 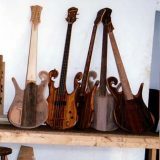 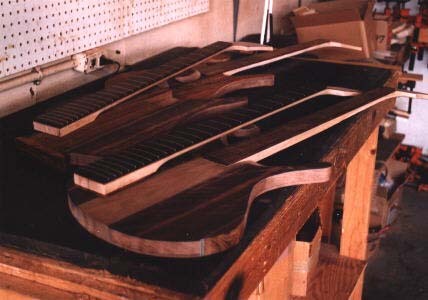 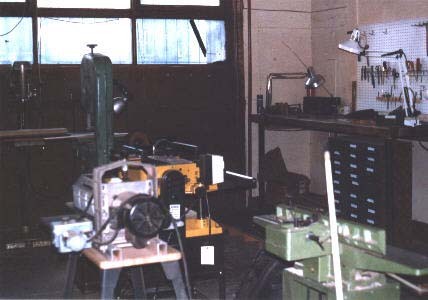 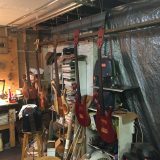 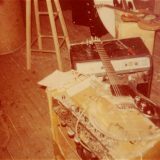 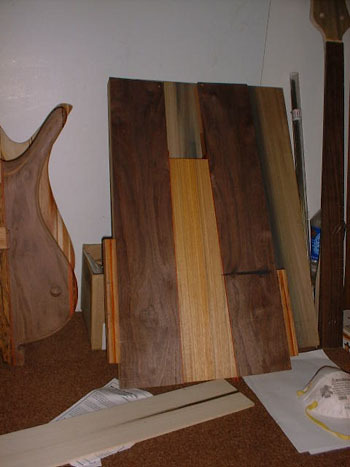 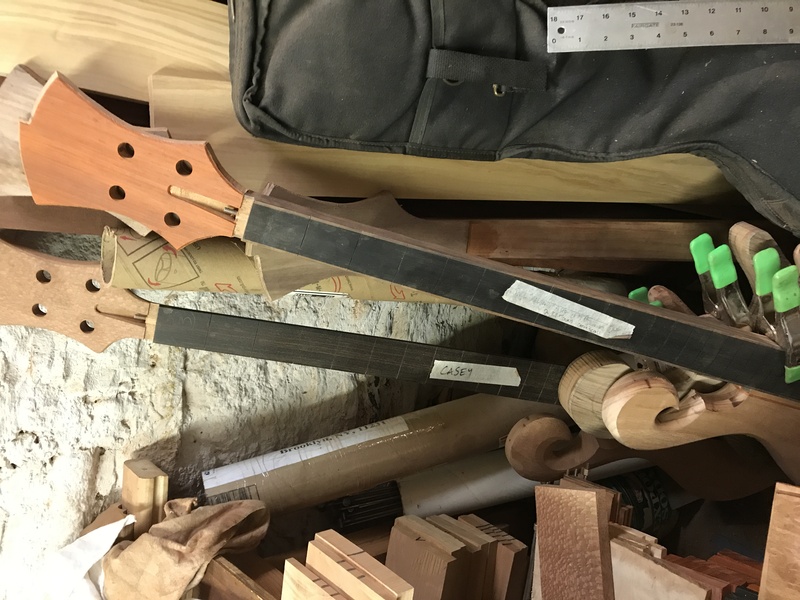 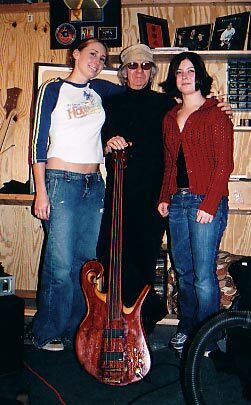 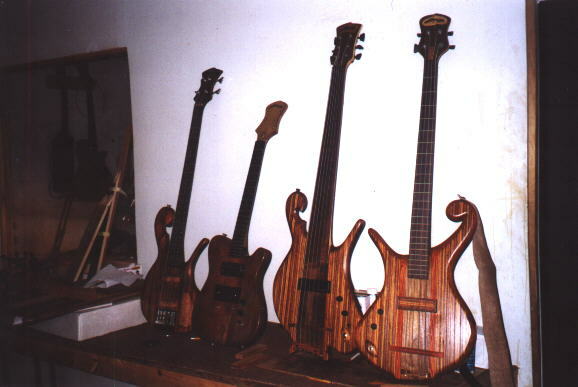 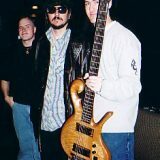 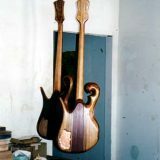 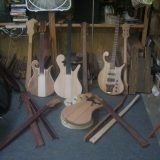 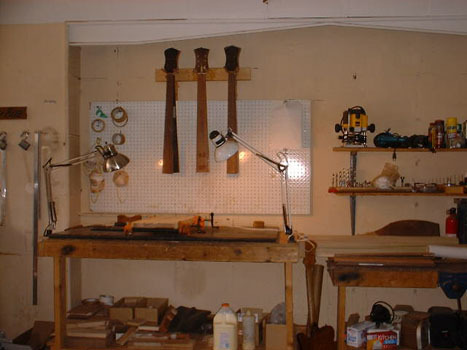 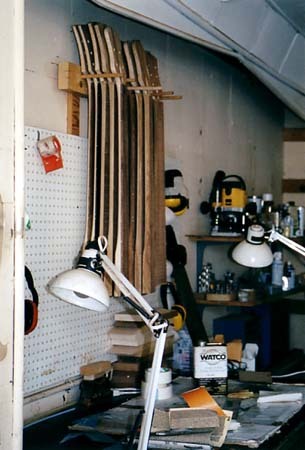 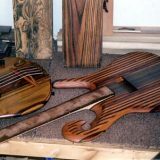 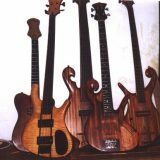 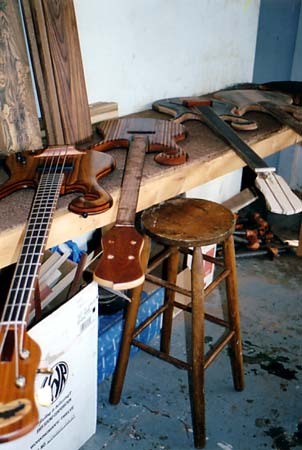 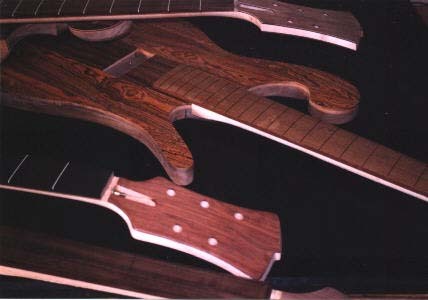 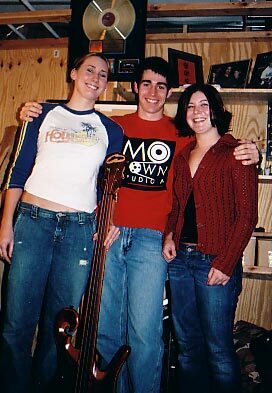 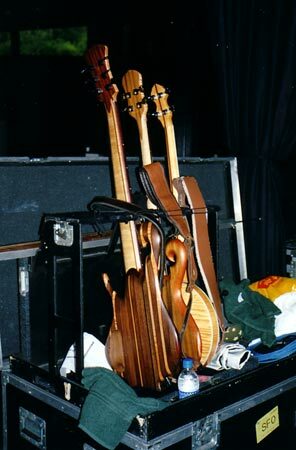 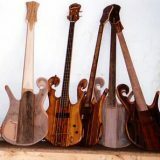 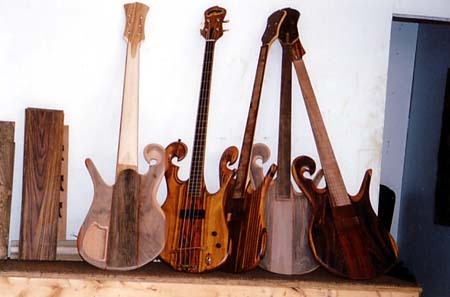 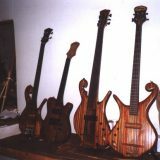 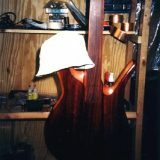 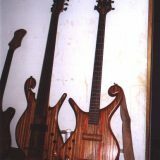 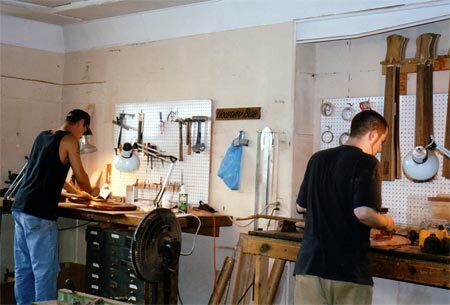 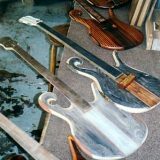 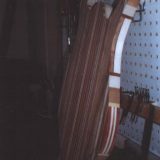 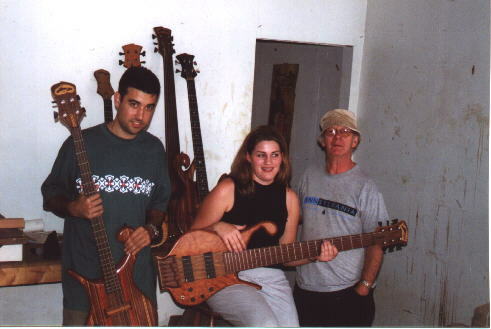 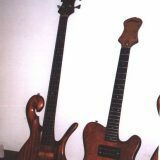 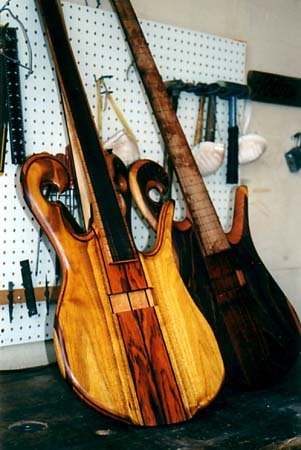 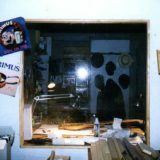 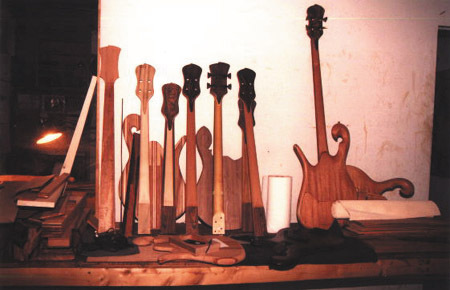 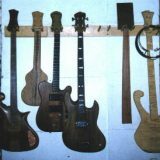 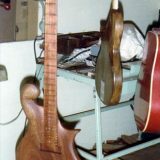 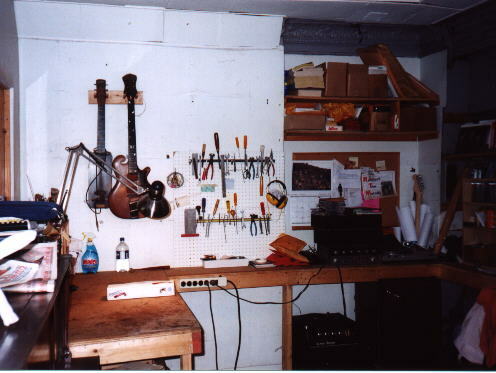 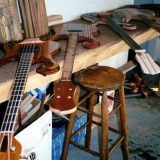 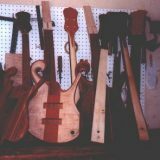 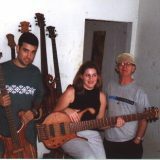 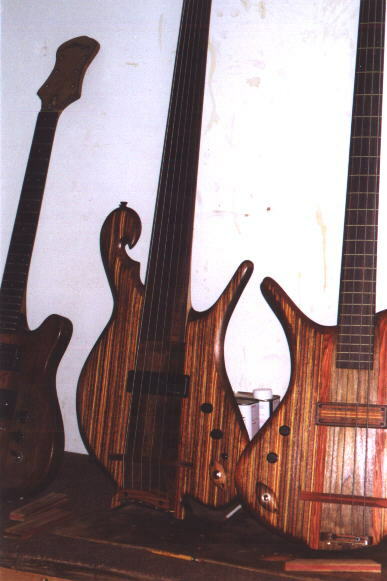 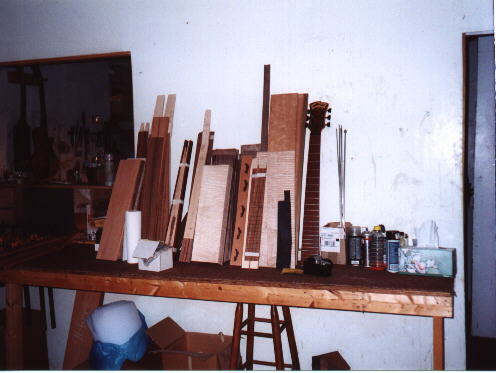 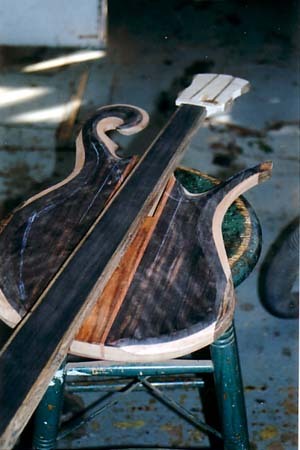 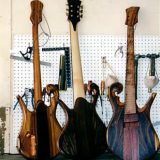 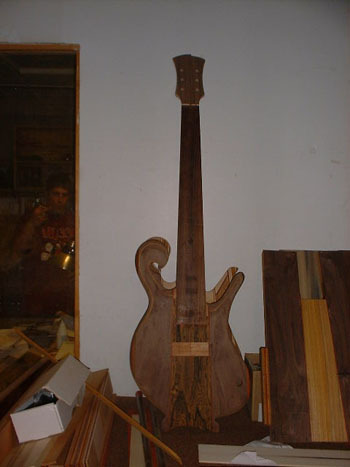 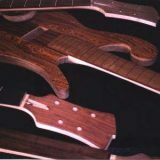 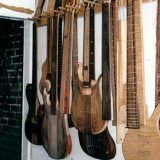 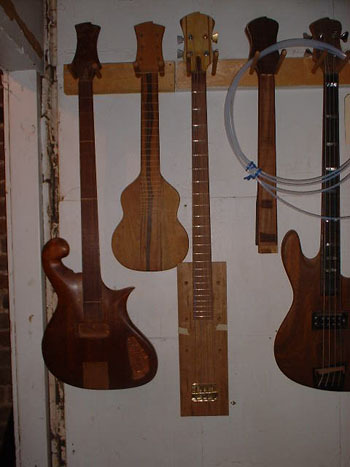 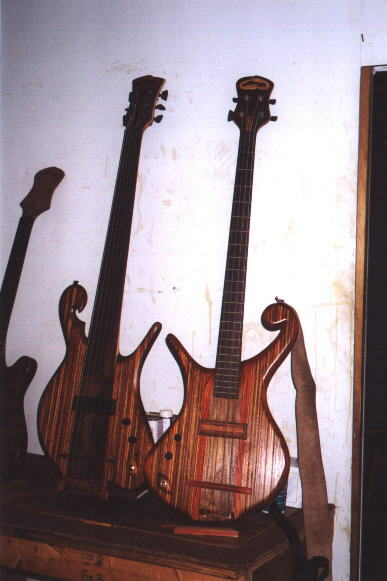 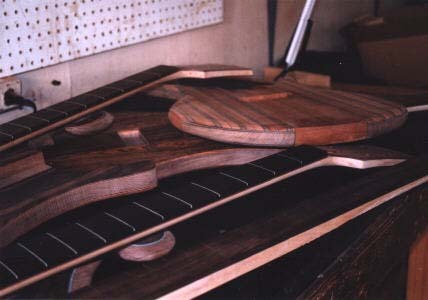 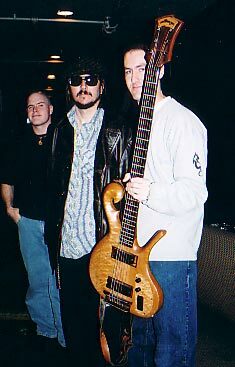 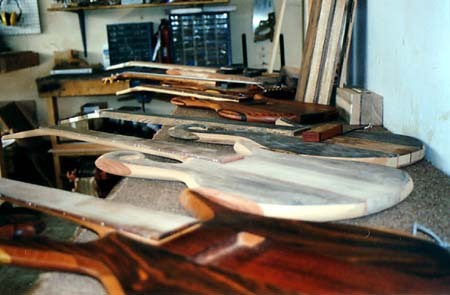 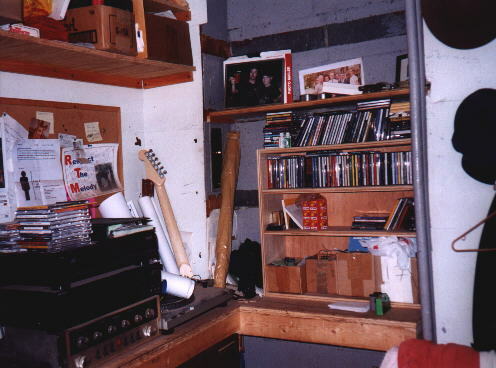 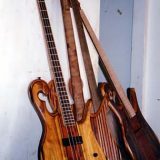 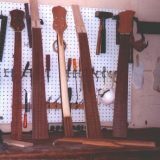 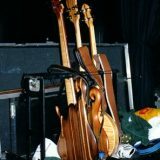 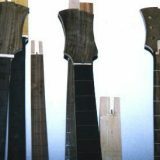 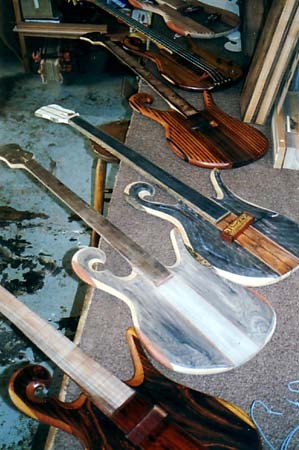 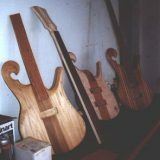 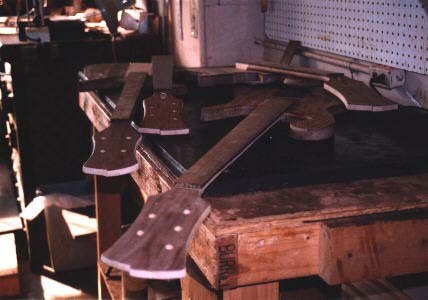 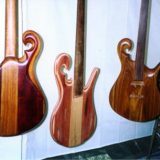 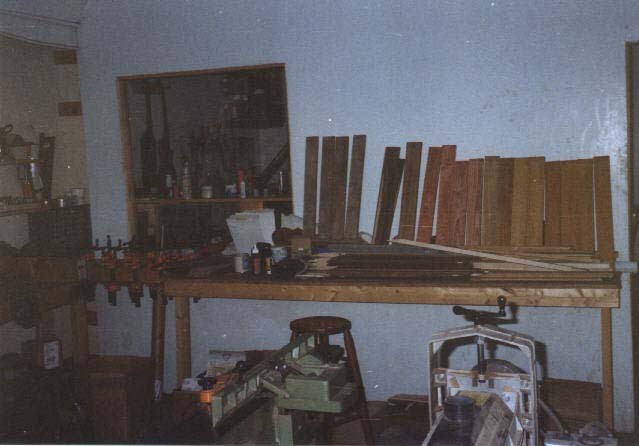 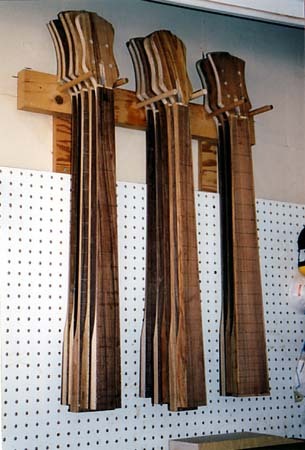 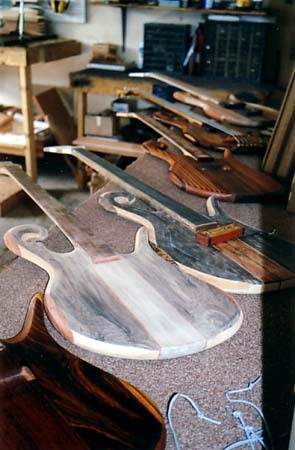 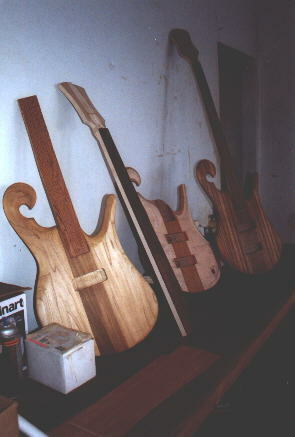 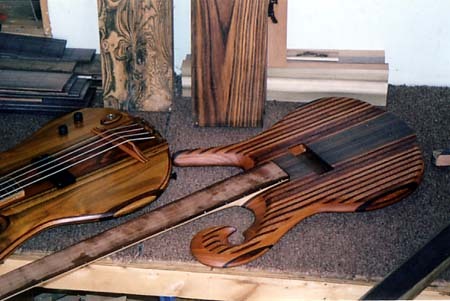 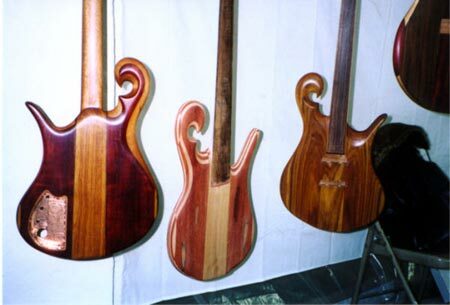 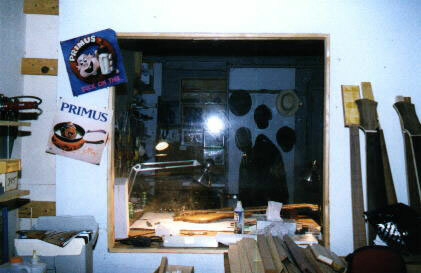 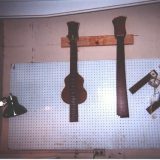 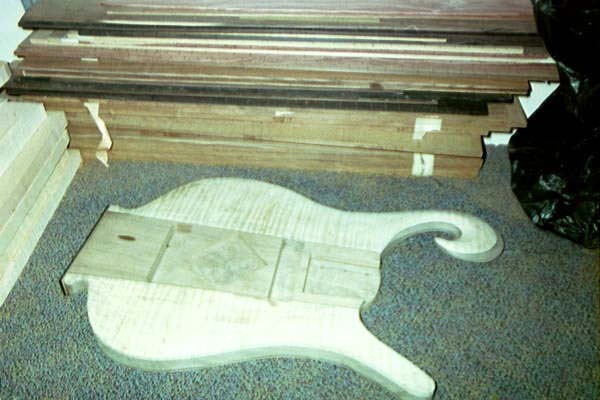 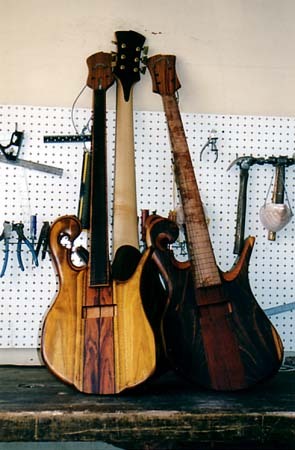 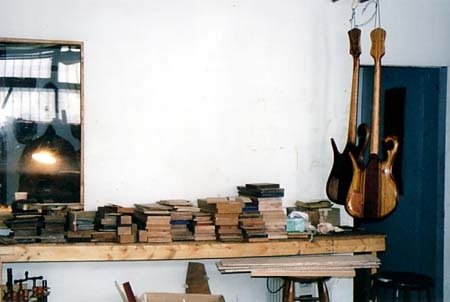 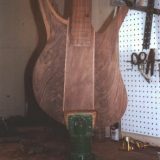 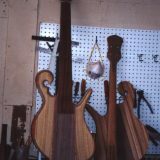 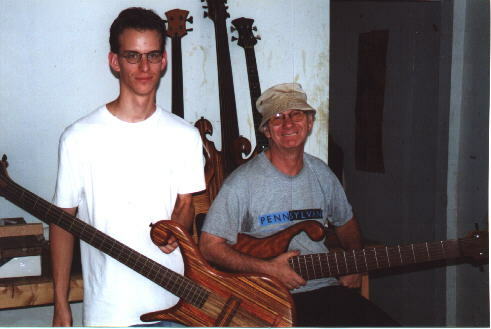 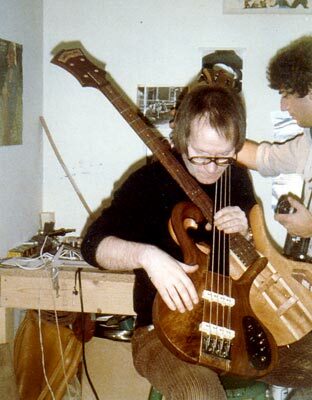 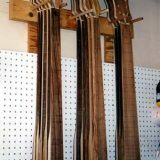 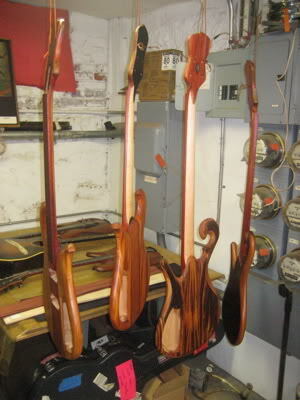 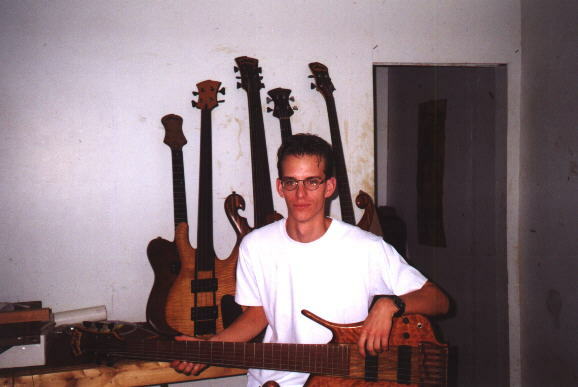 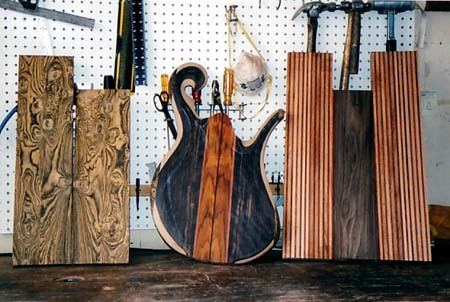 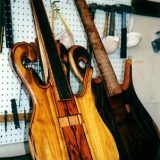 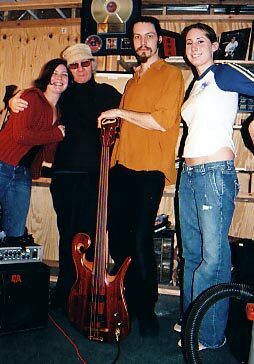 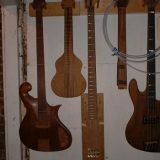 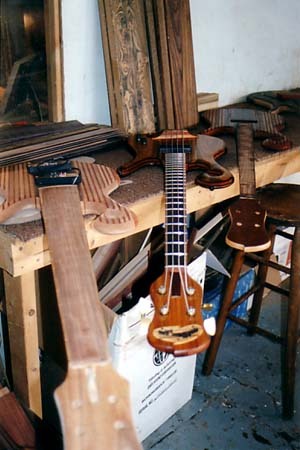 The basses in Carl’s shop at the time; from left to right – Carl’s second guitar, 1980 Fretless CT, newly finished 6-string, David Siff’s bass, Chad’s lefty-4.